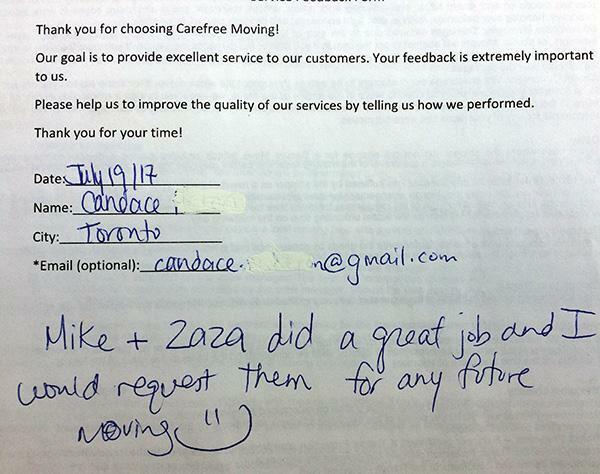 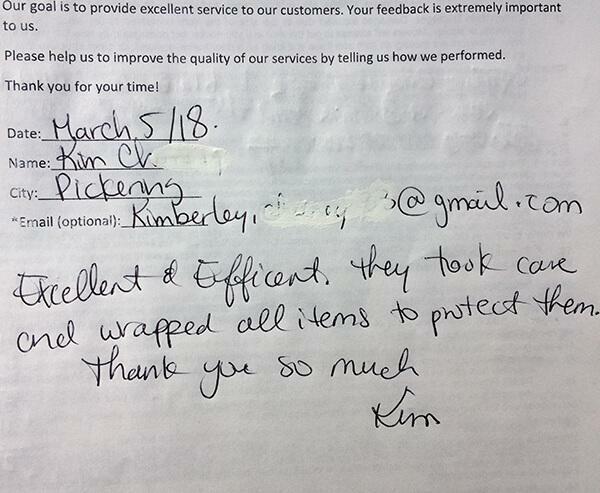 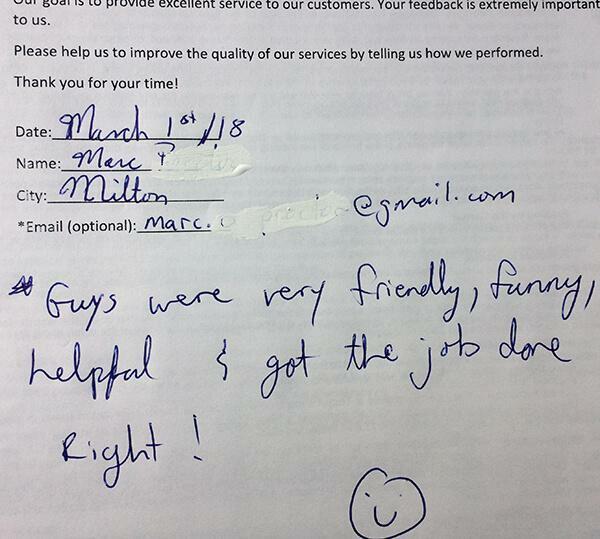 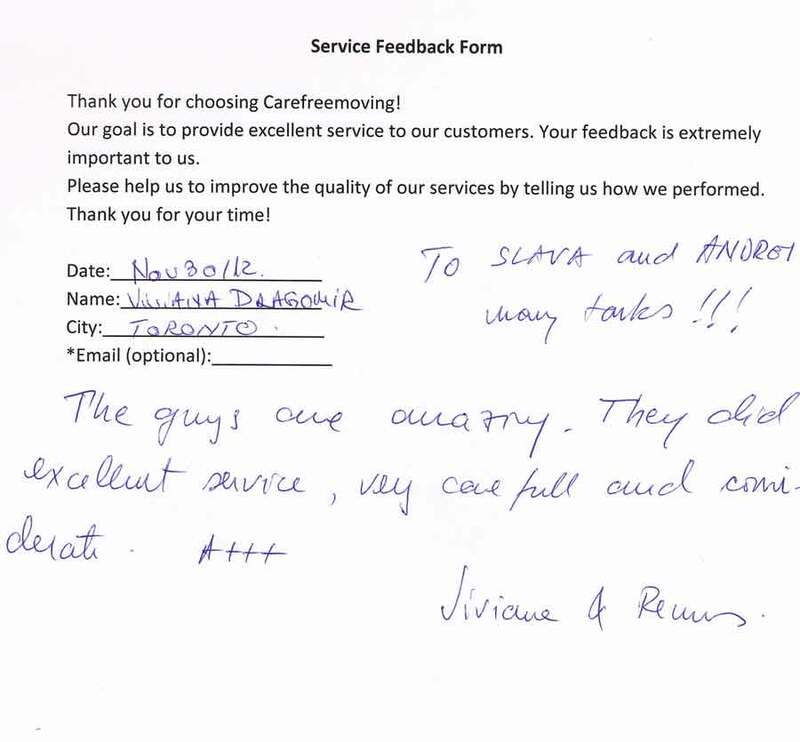 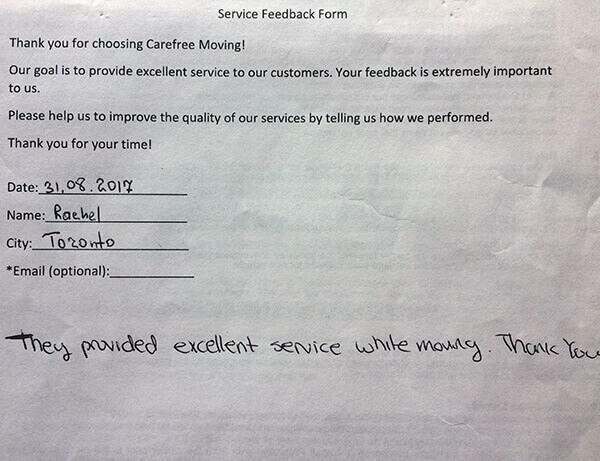 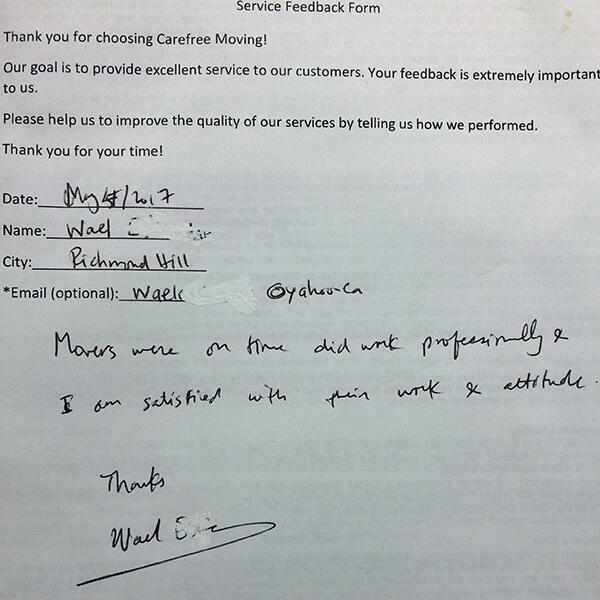 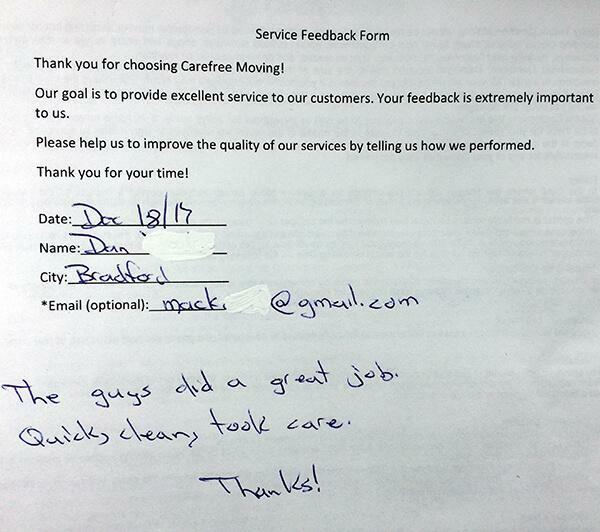 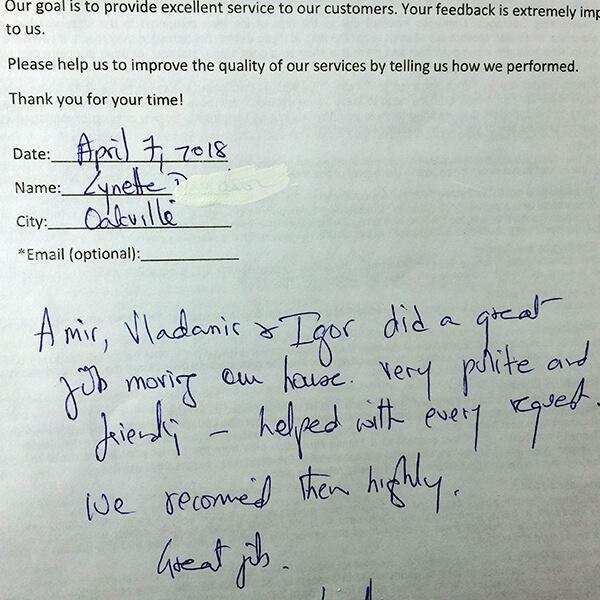 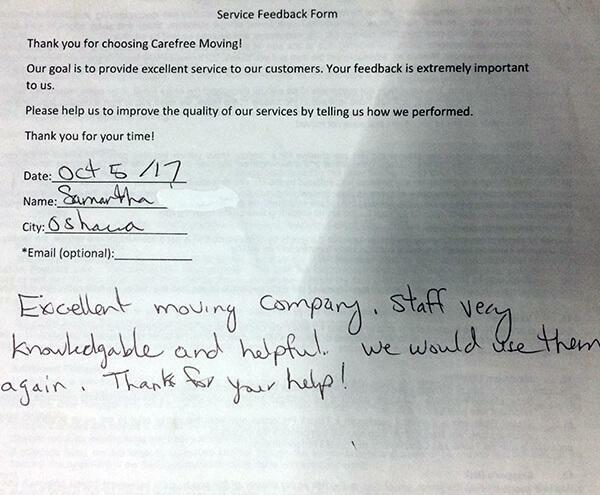 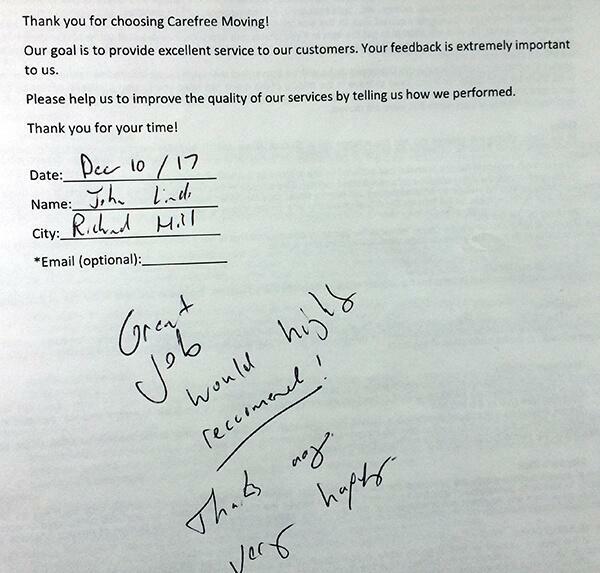 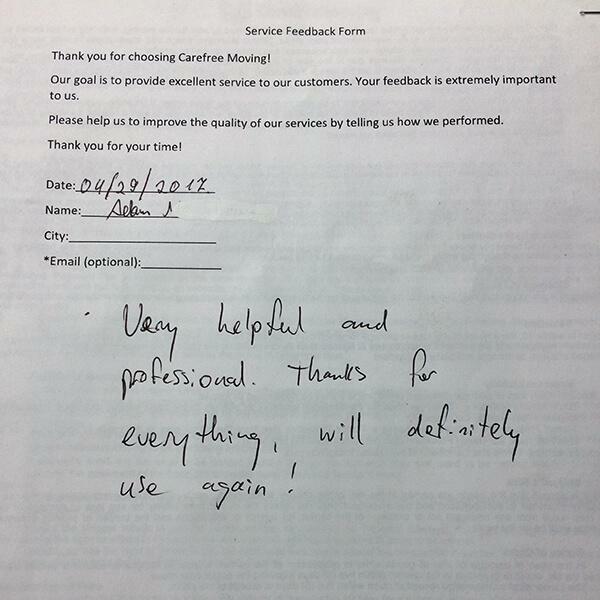 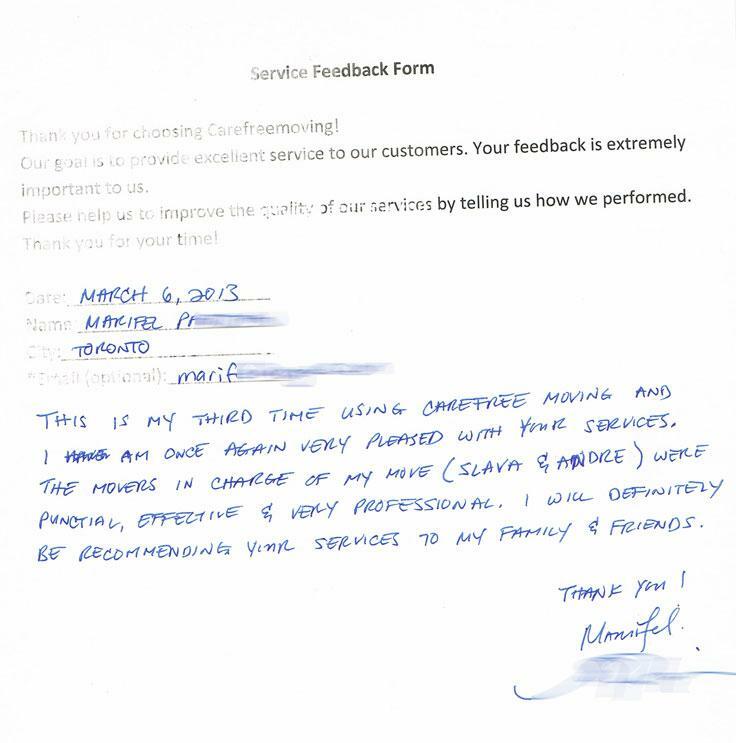 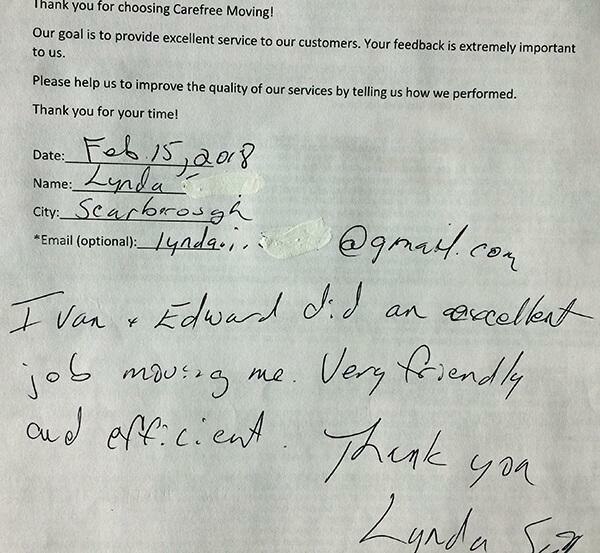 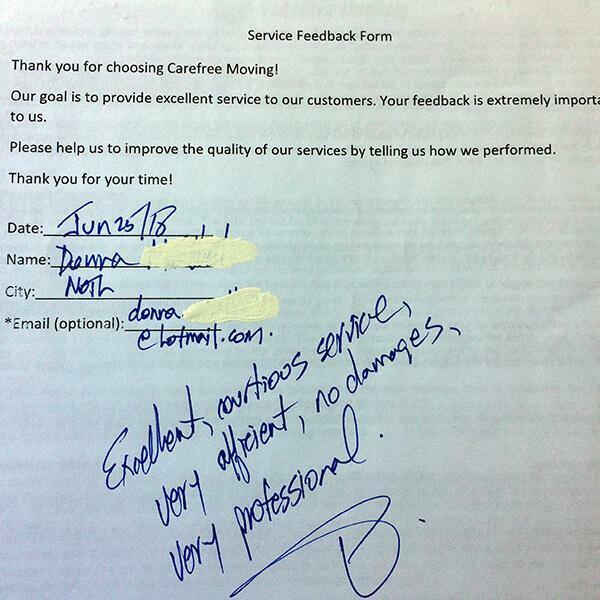 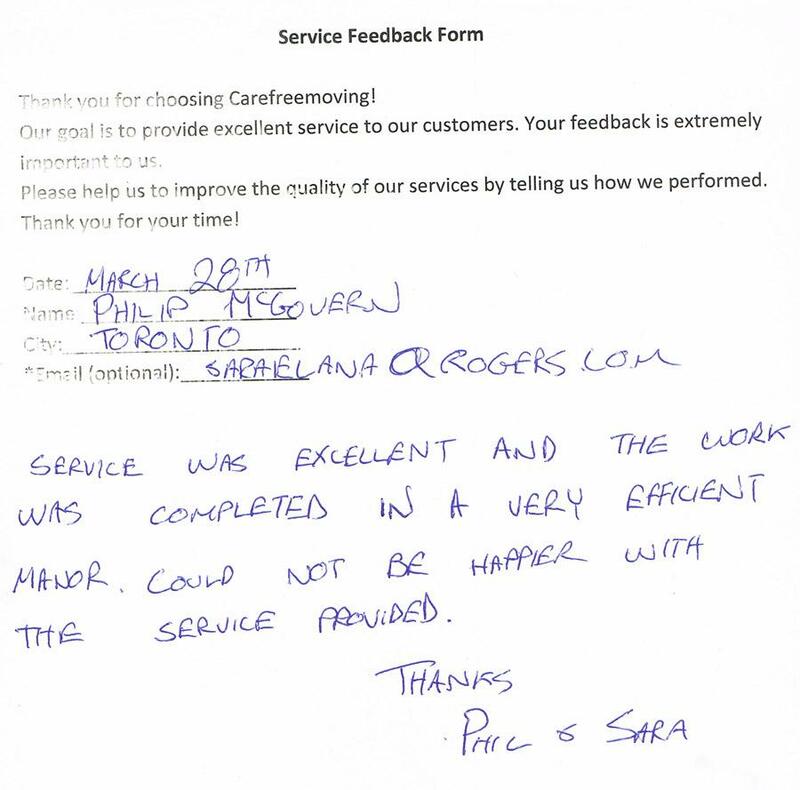 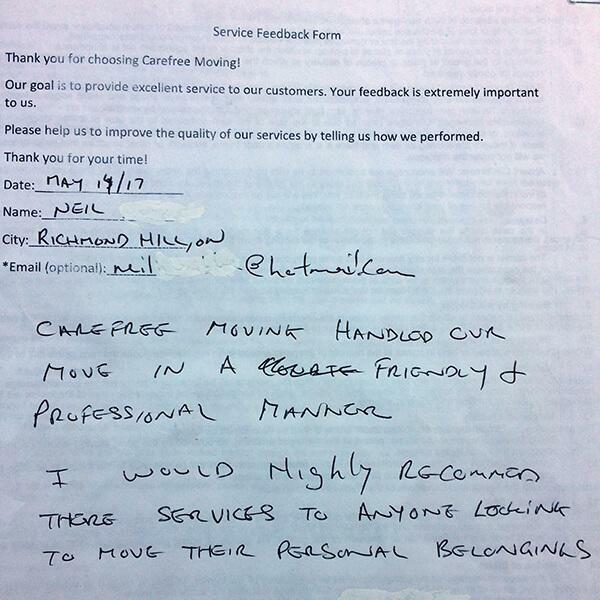 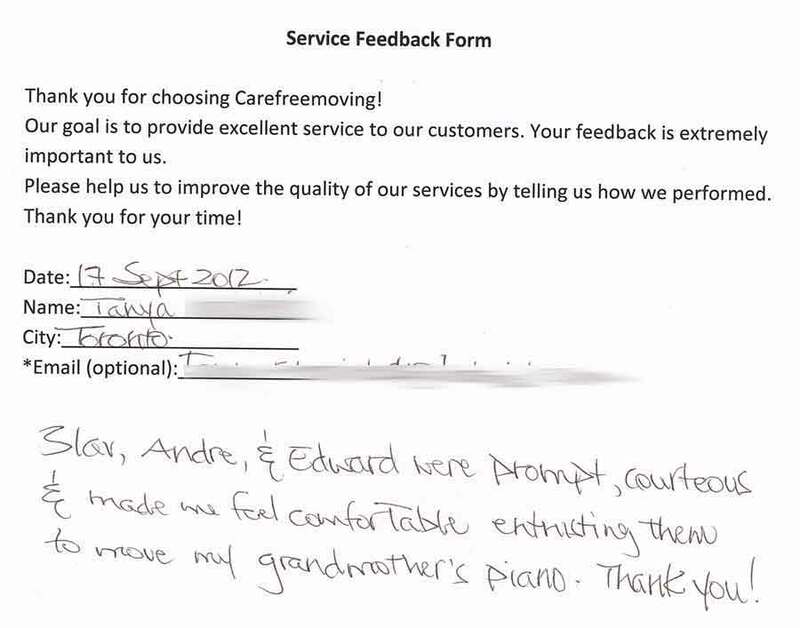 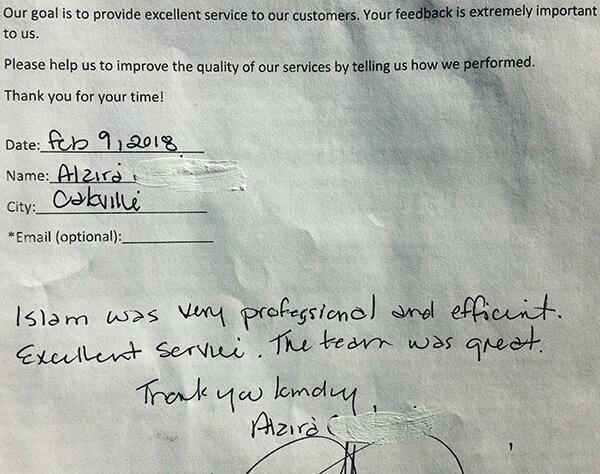 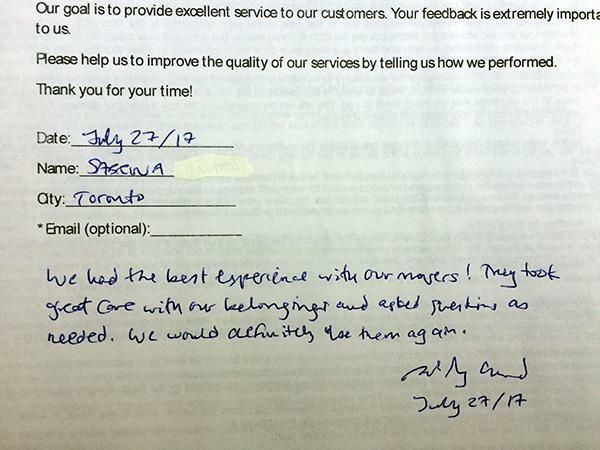 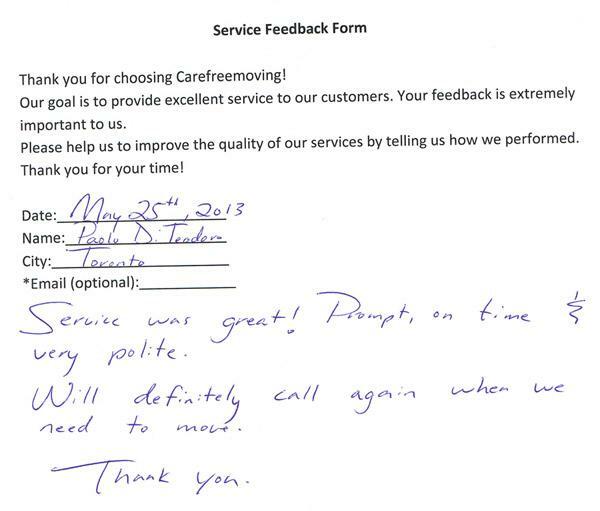 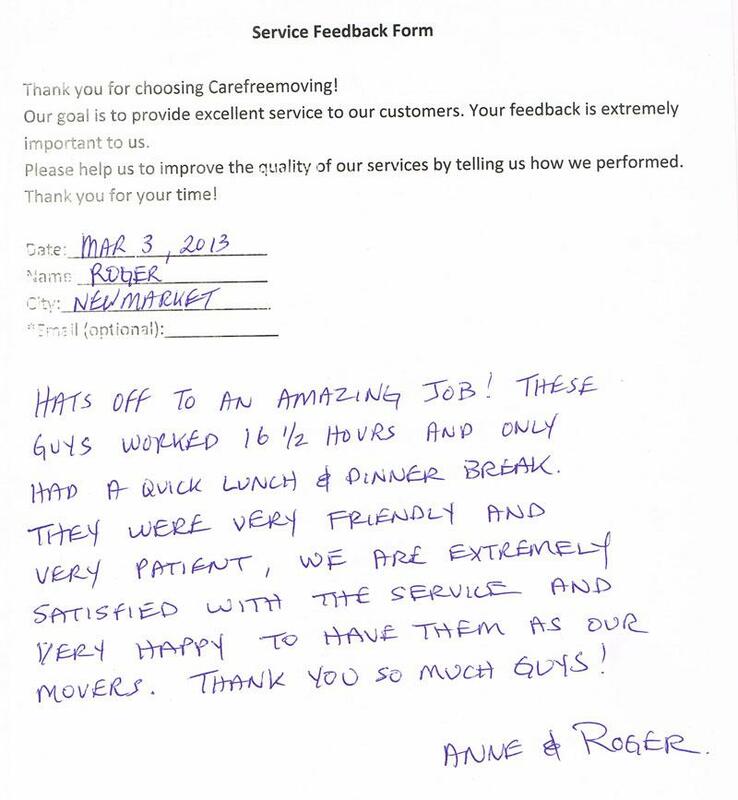 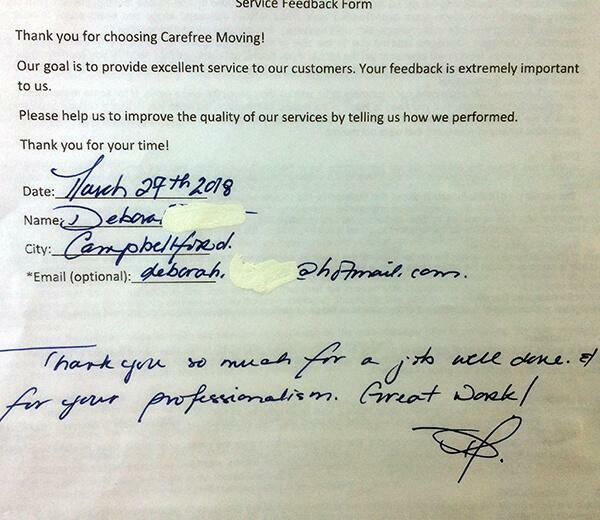 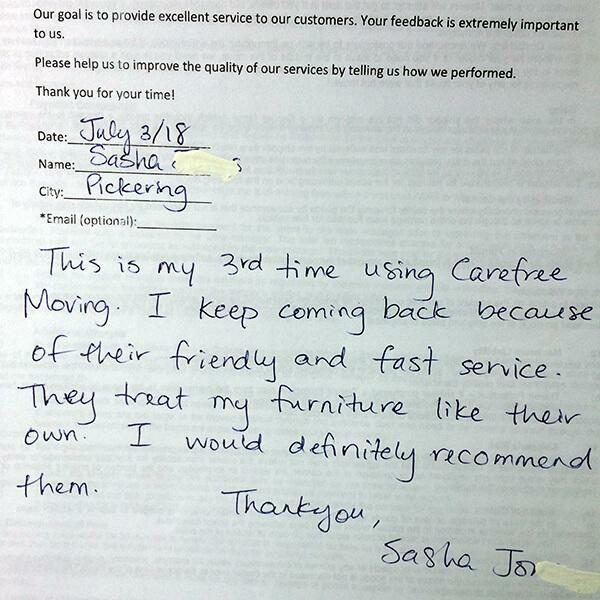 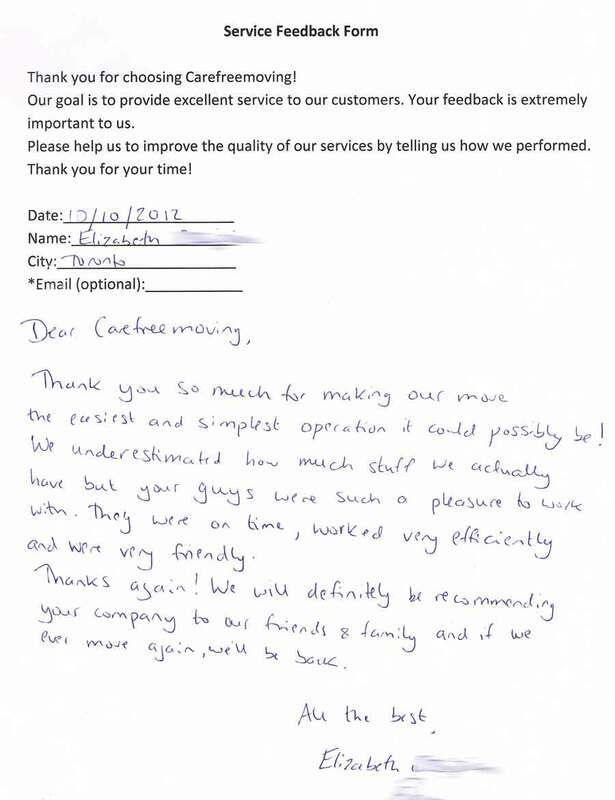 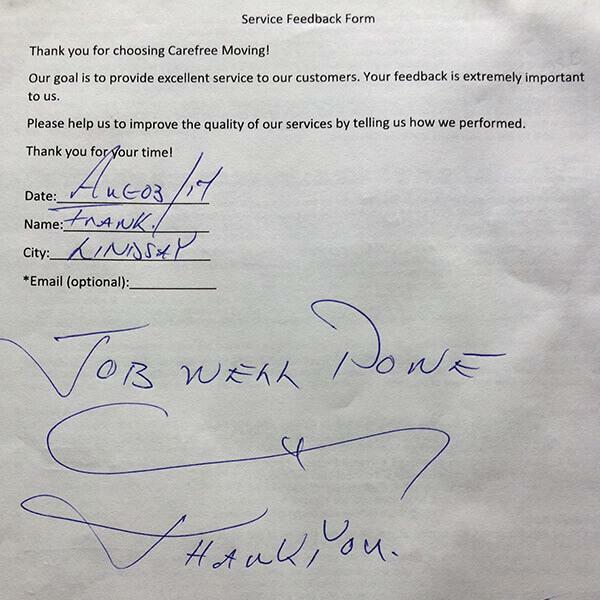 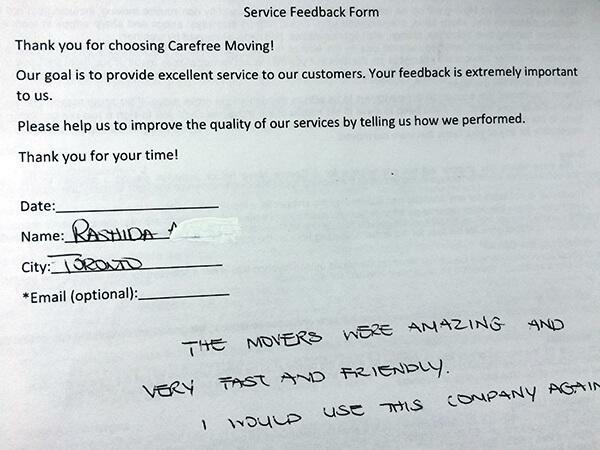 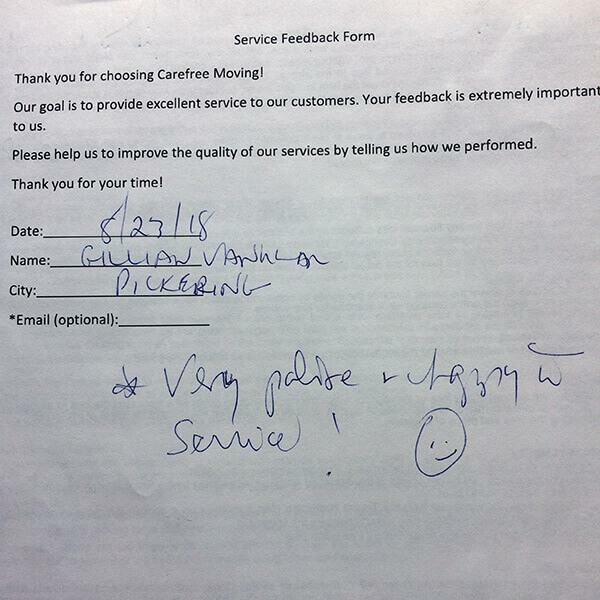 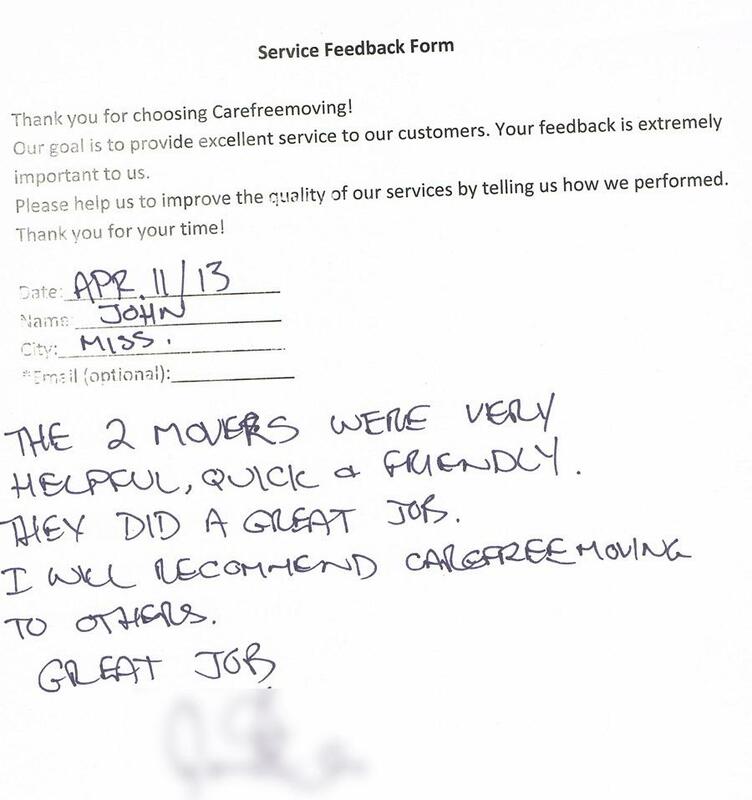 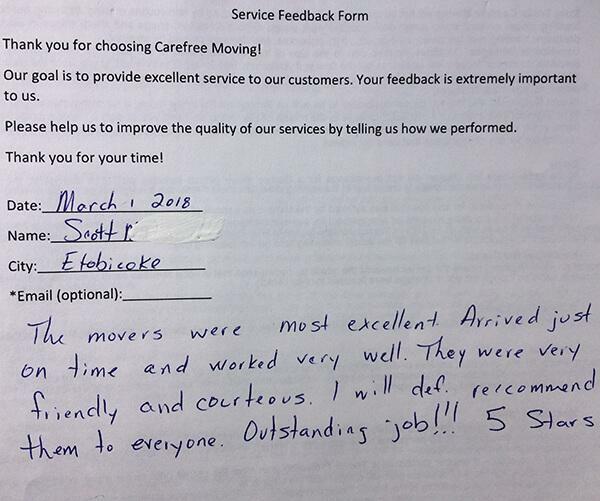 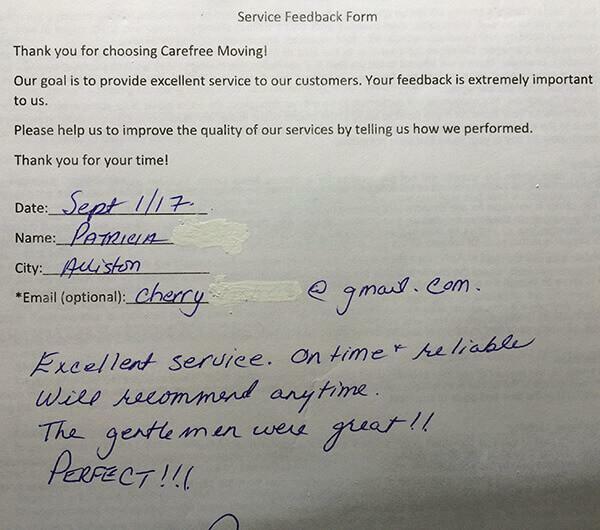 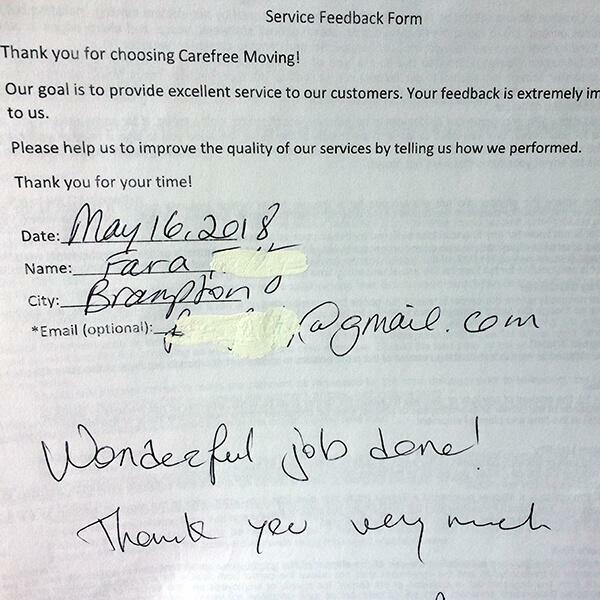 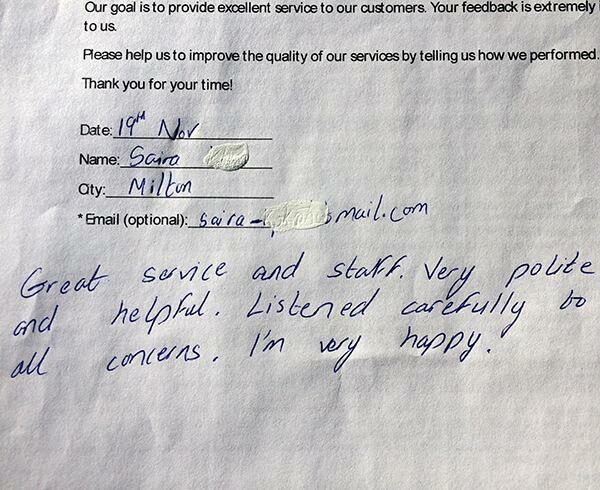 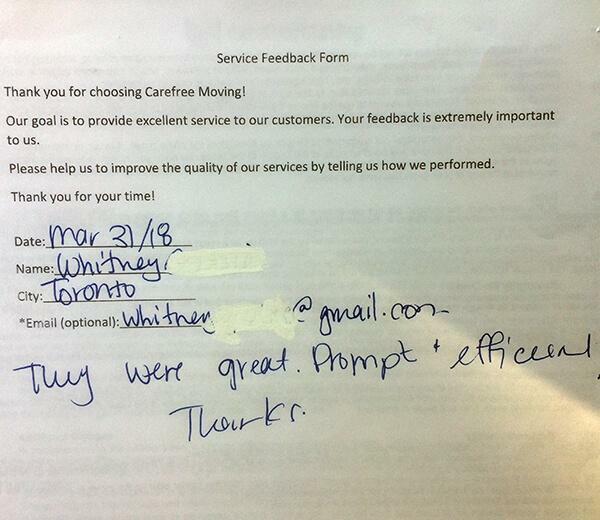 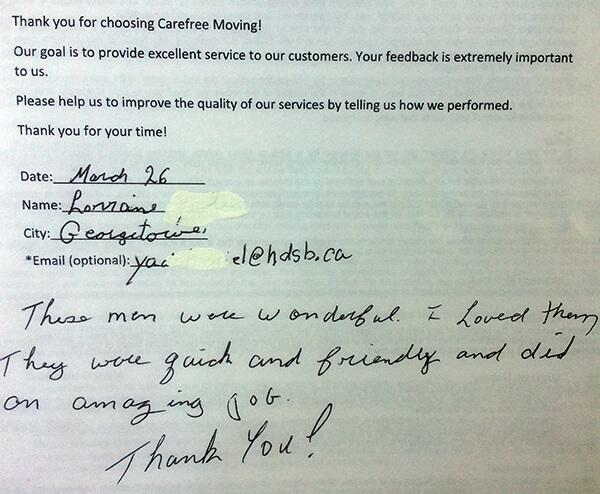 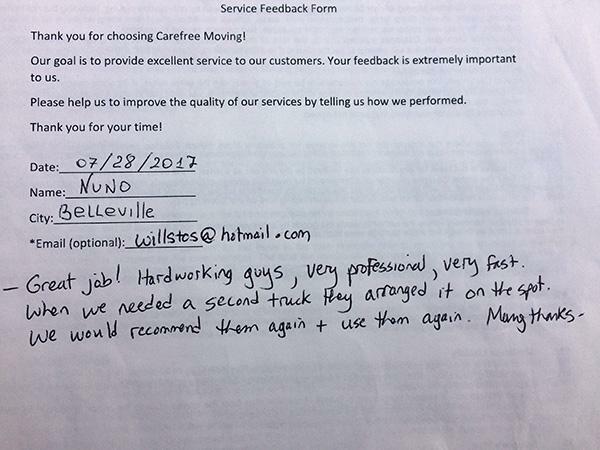 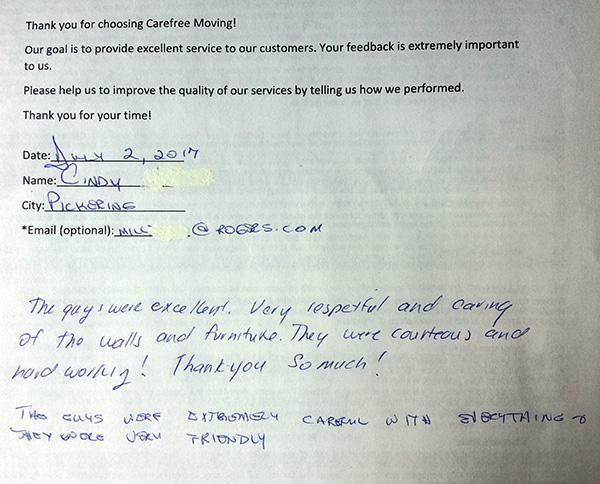 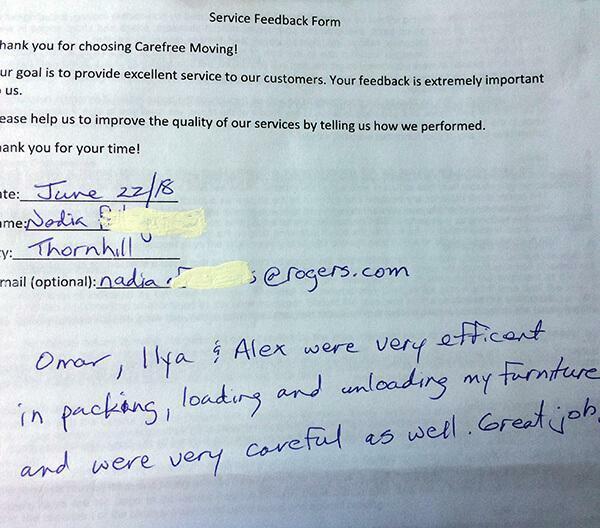 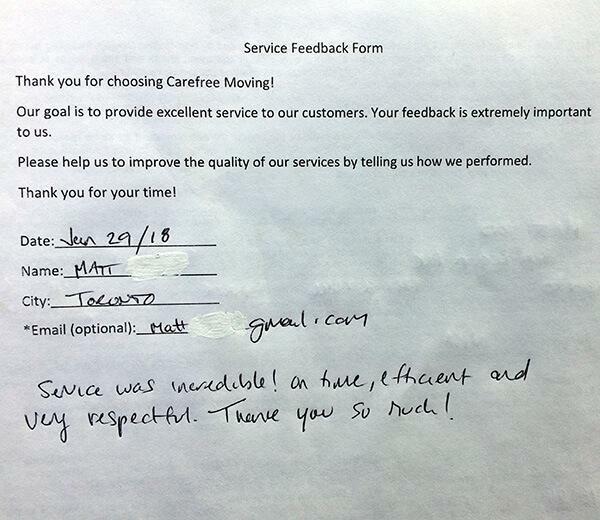 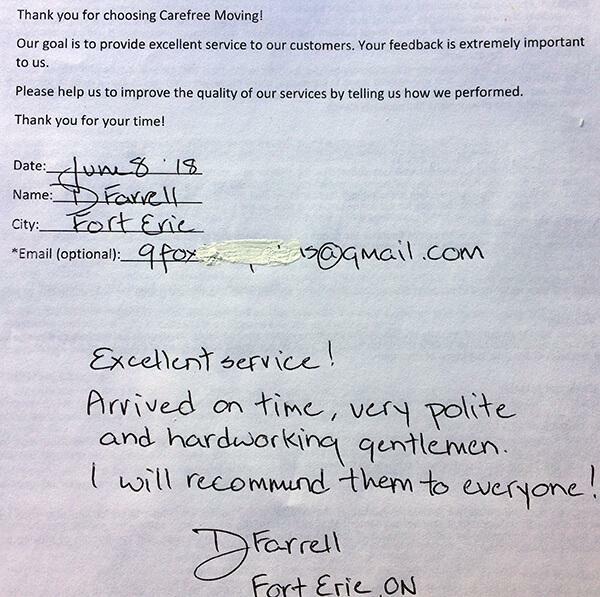 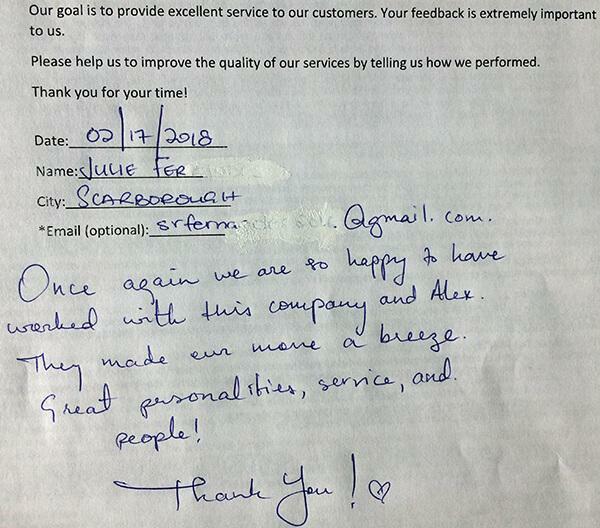 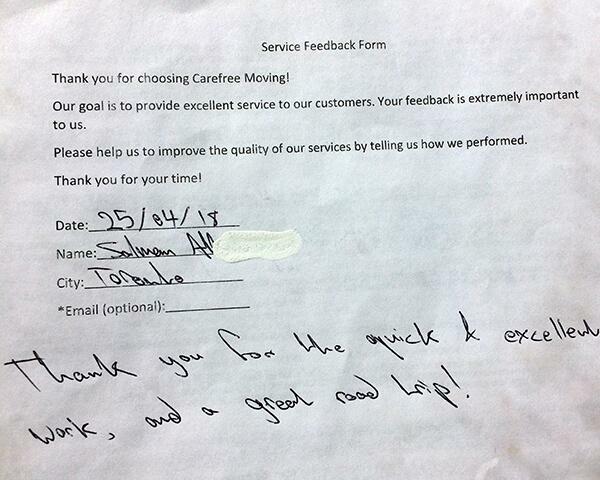 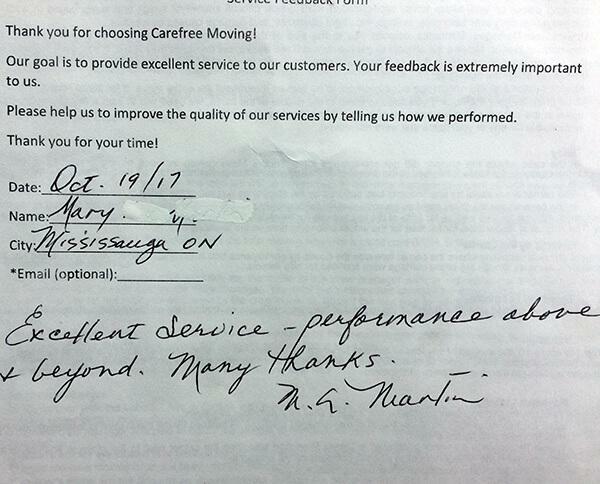 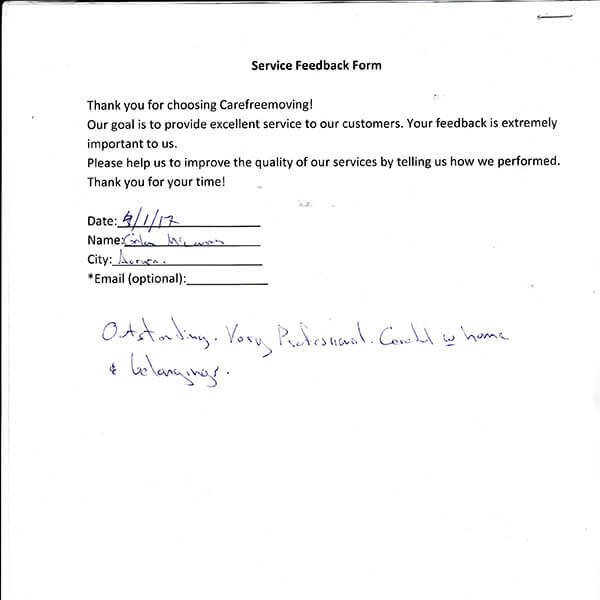 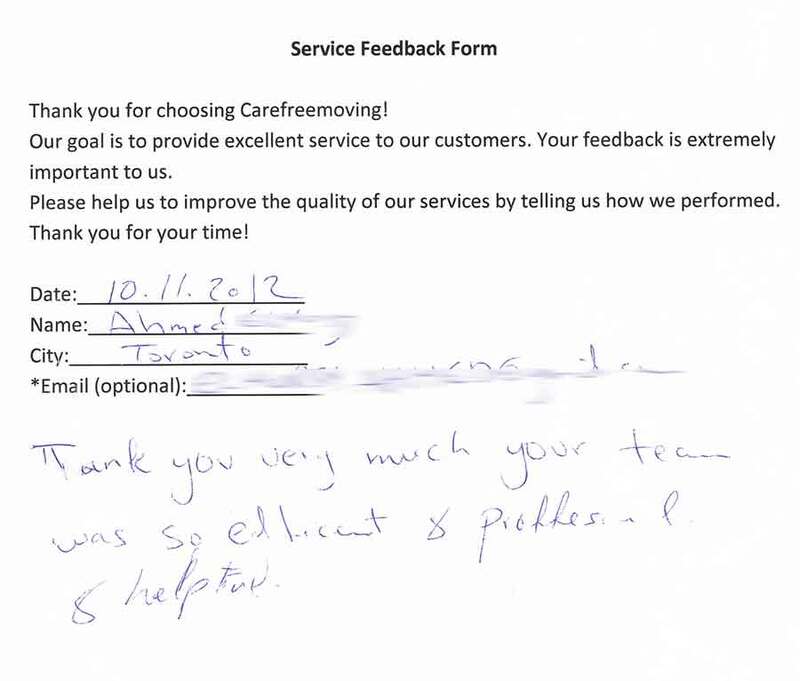 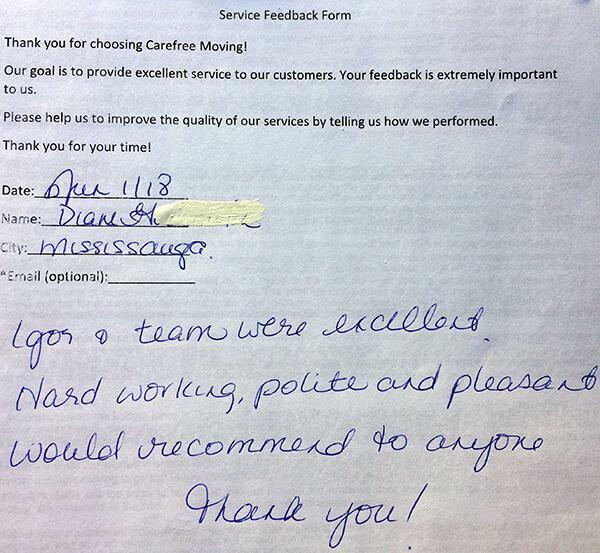 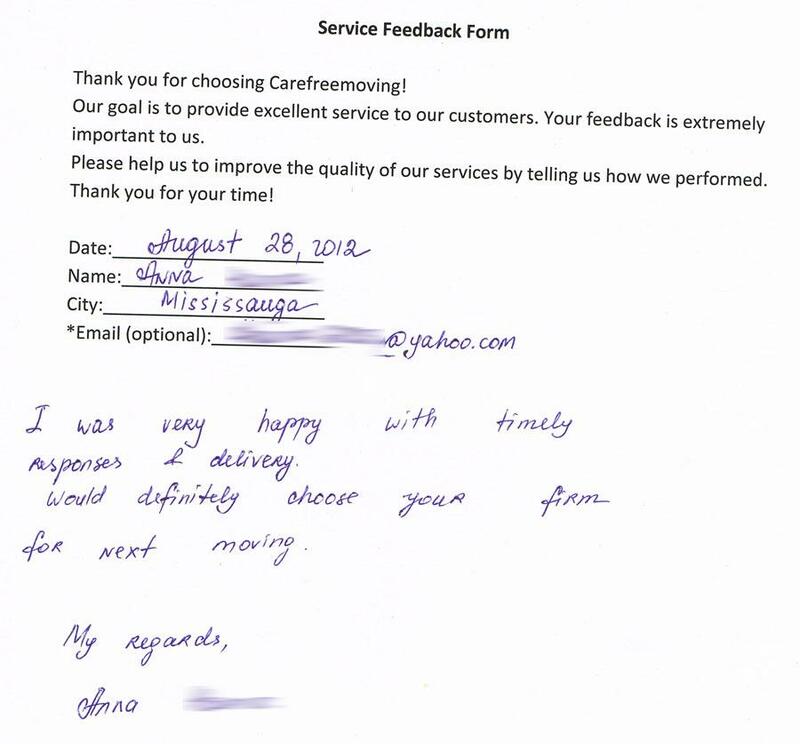 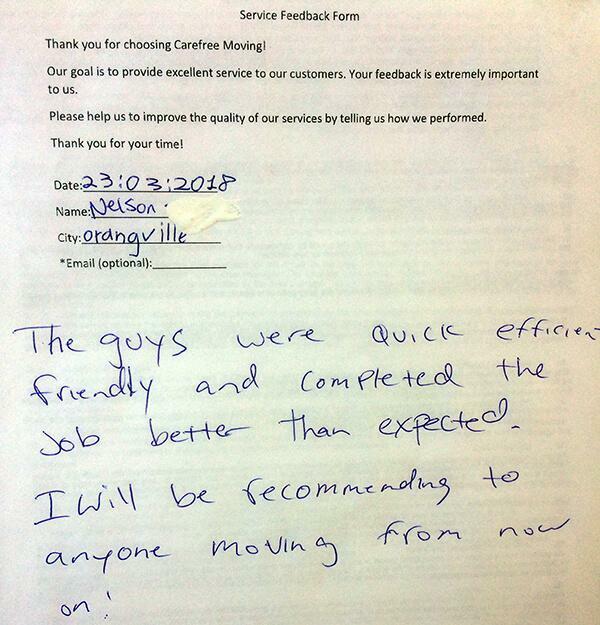 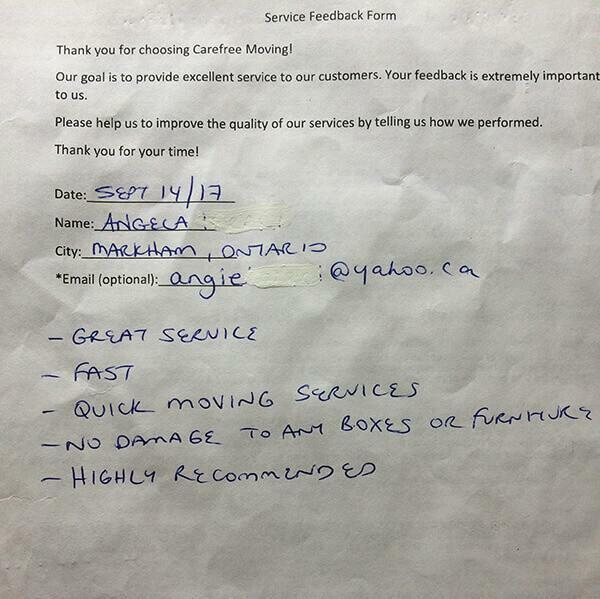 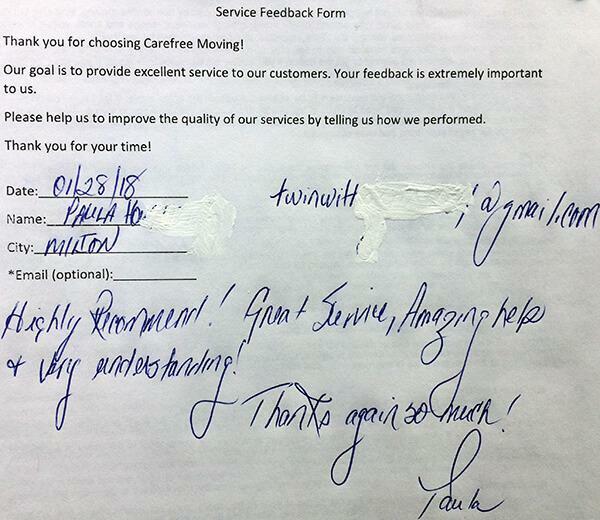 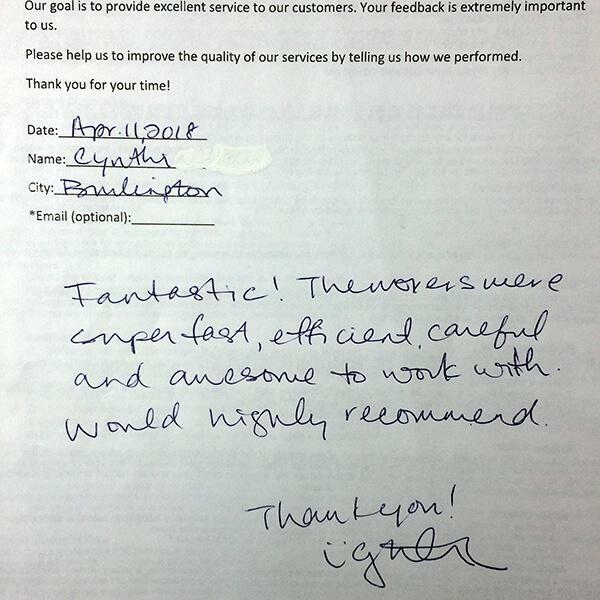 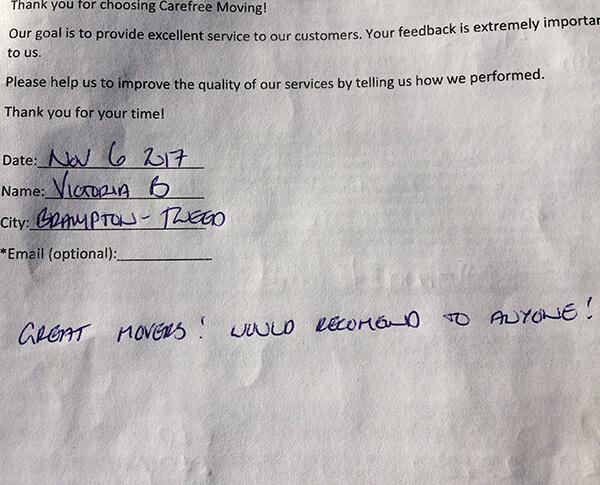 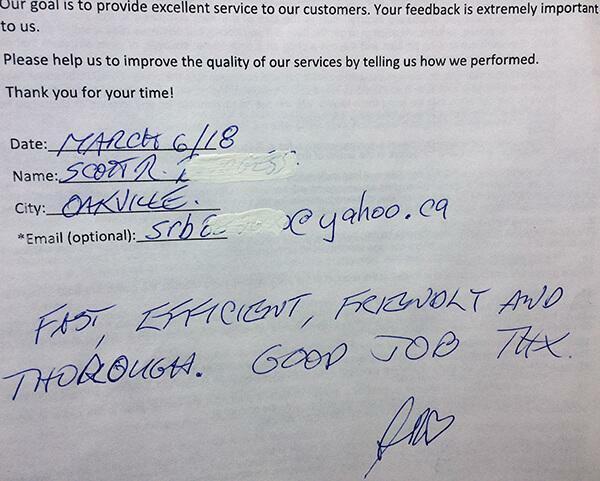 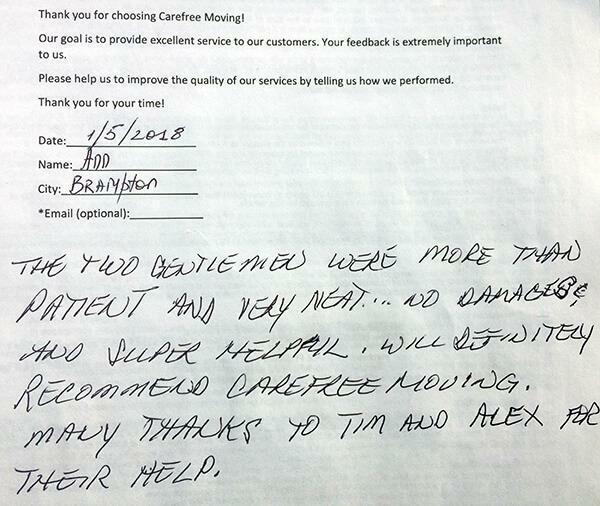 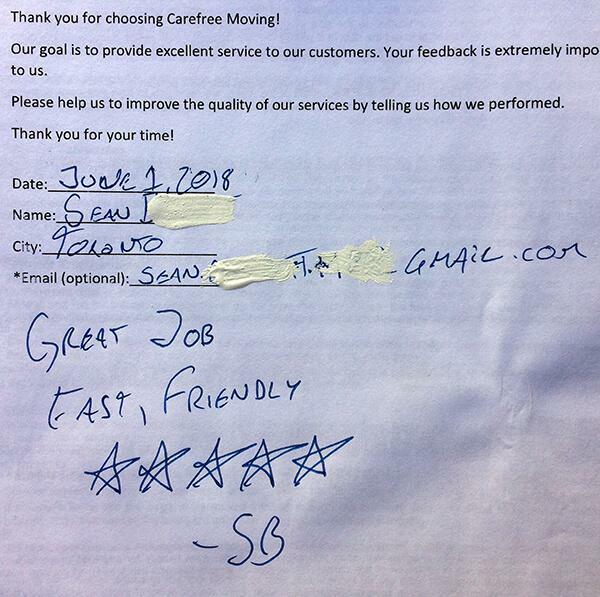 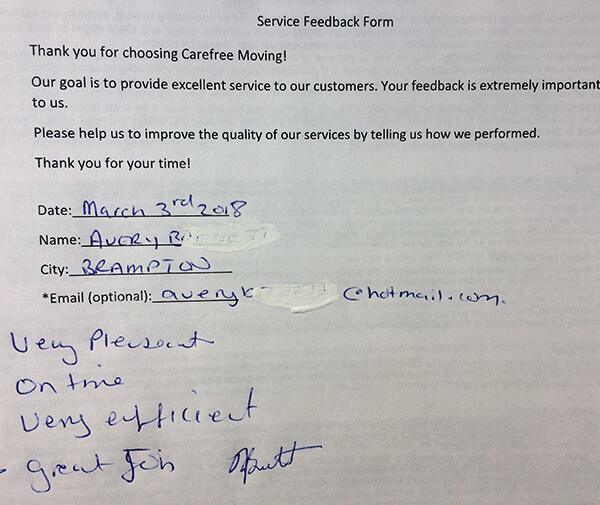 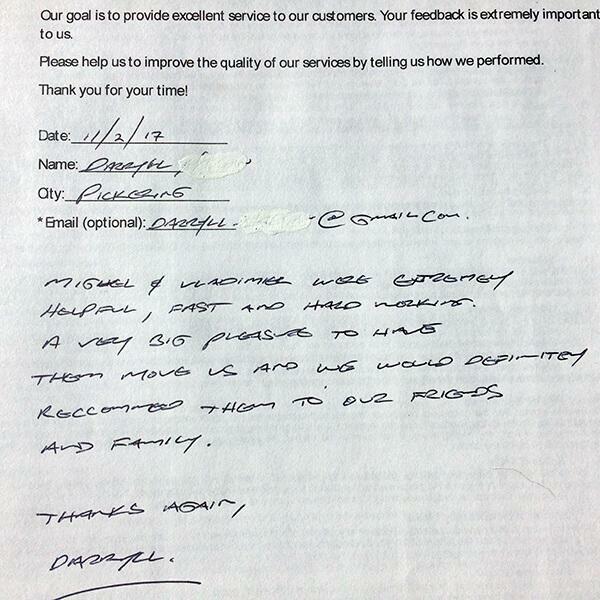 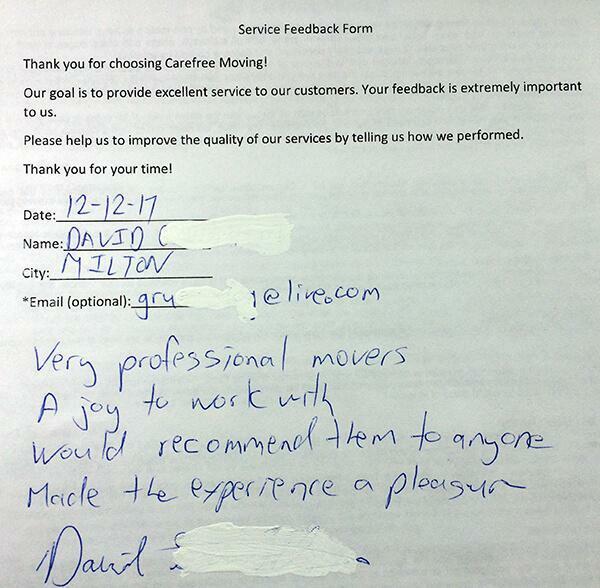 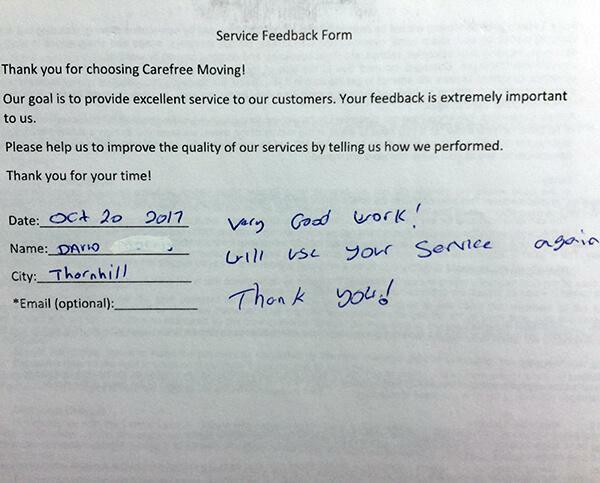 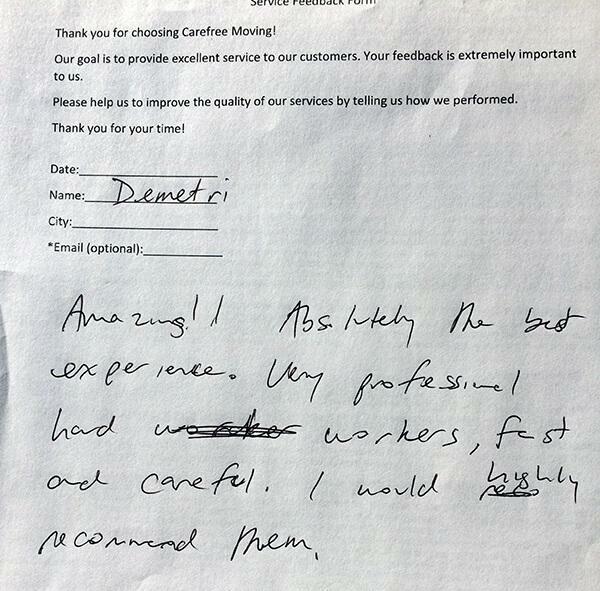 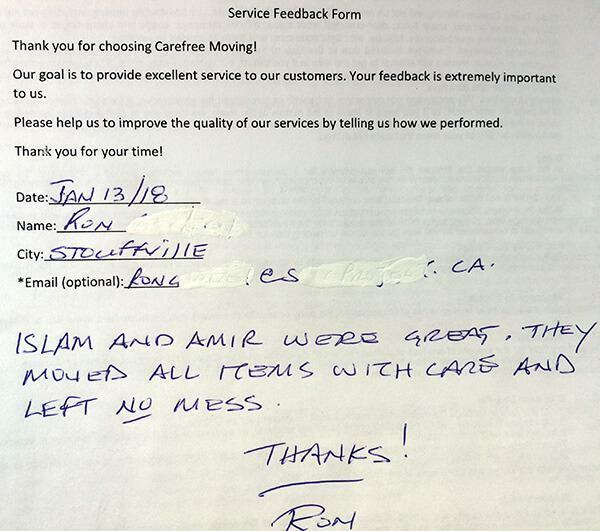 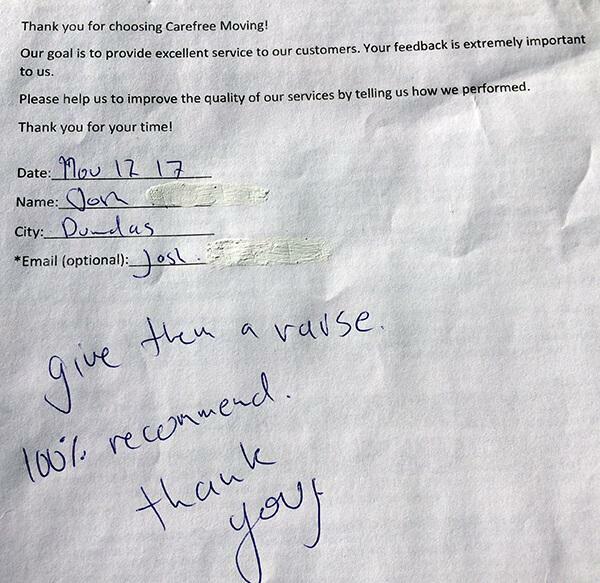 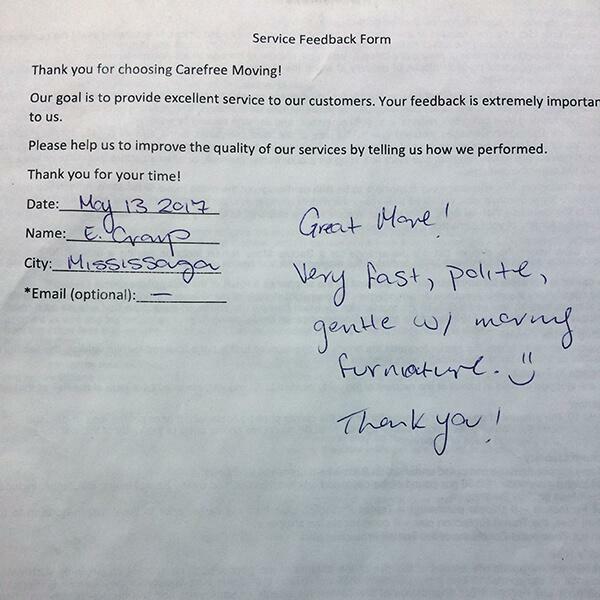 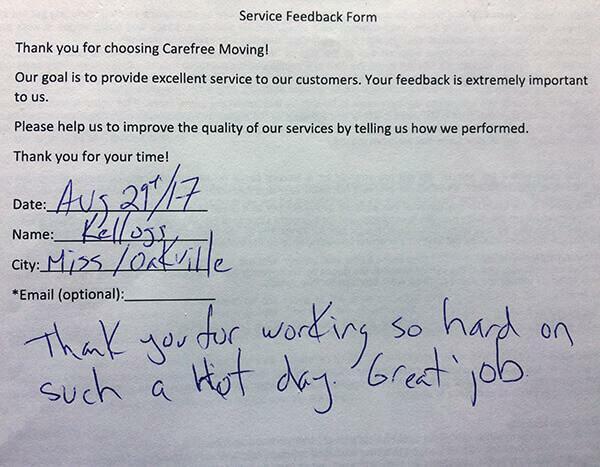 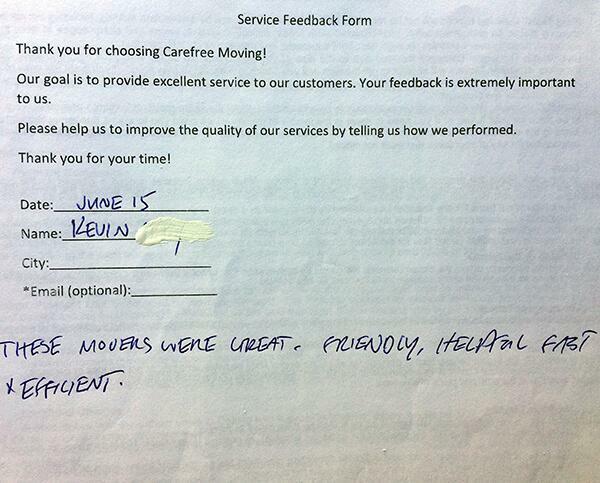 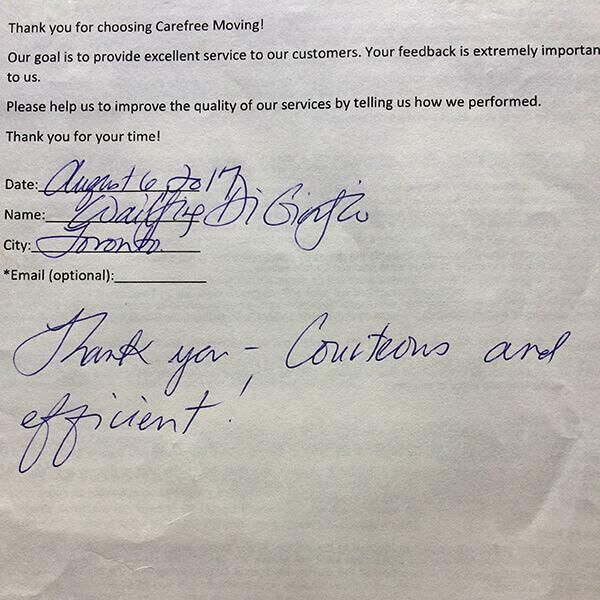 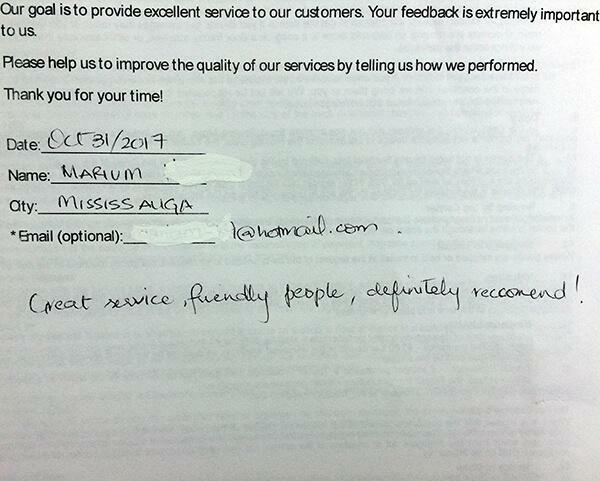 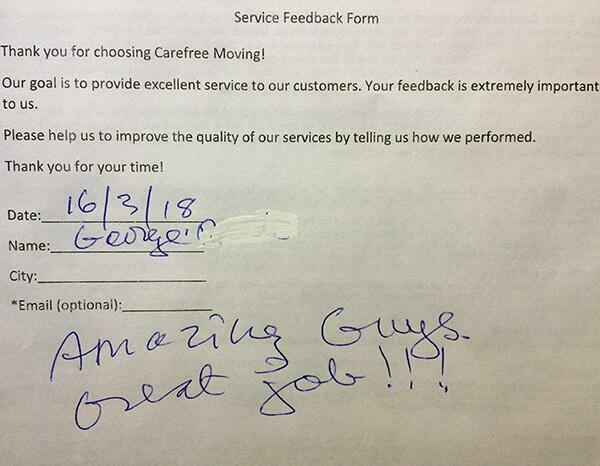 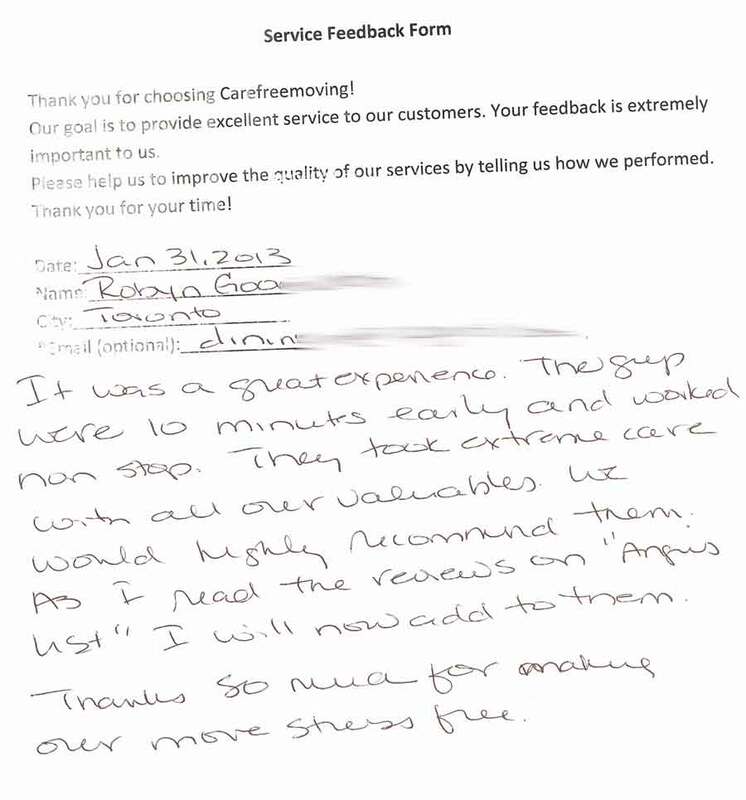 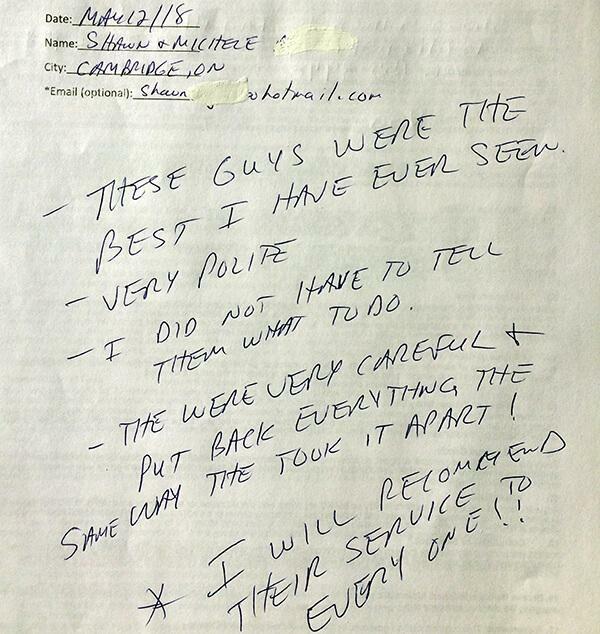 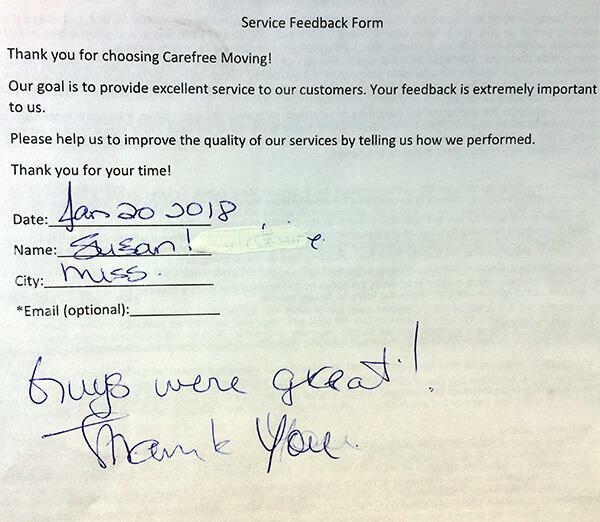 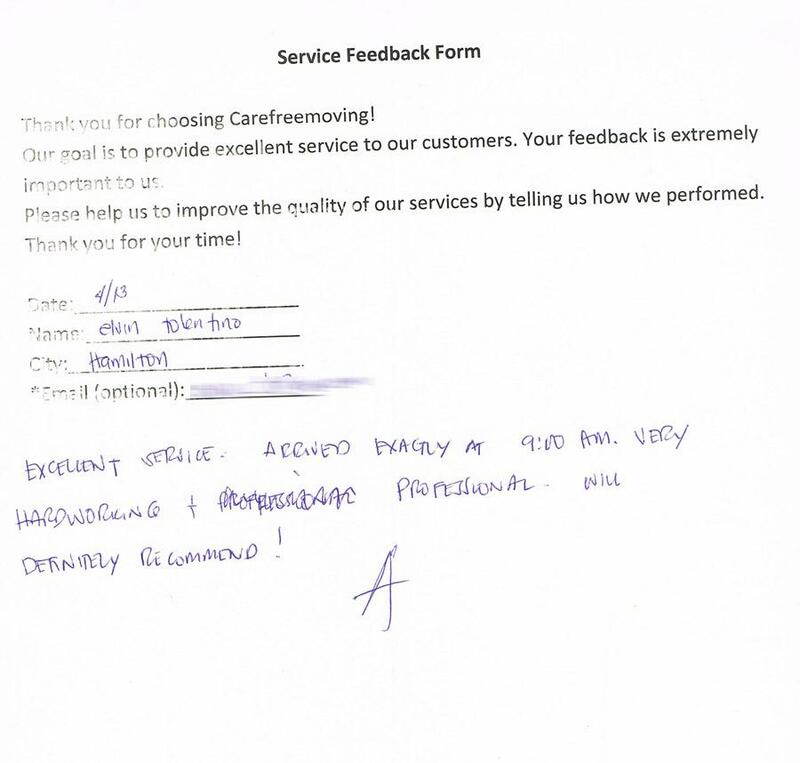 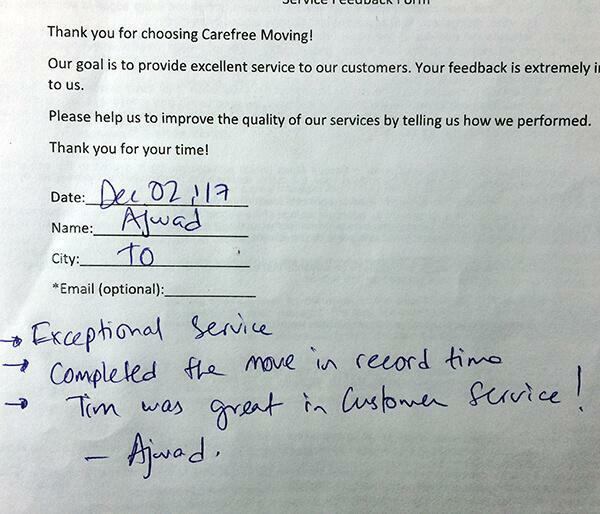 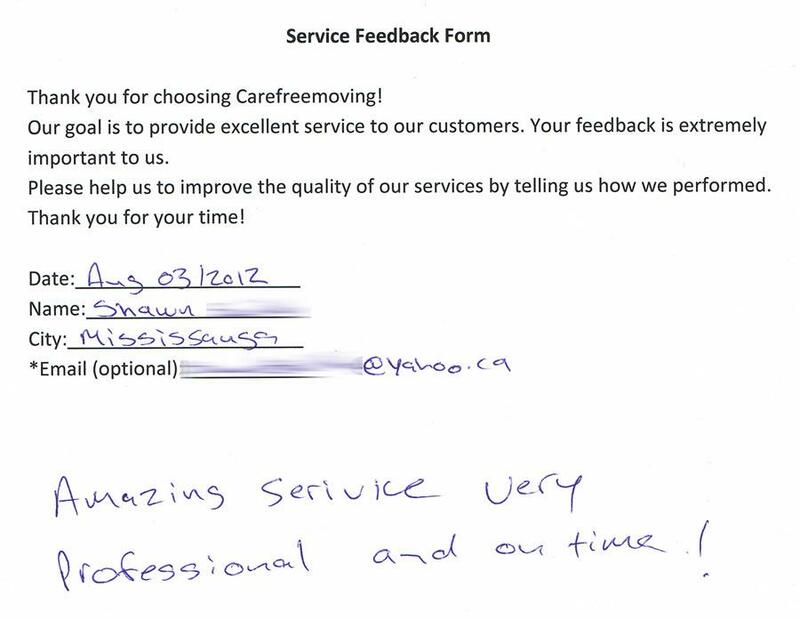 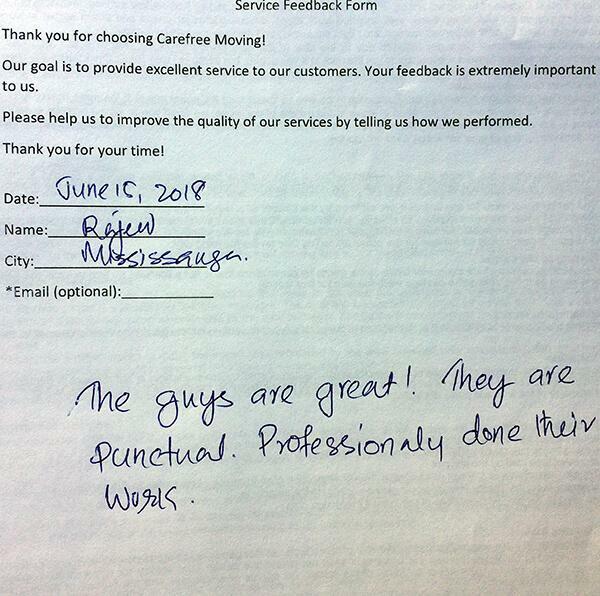 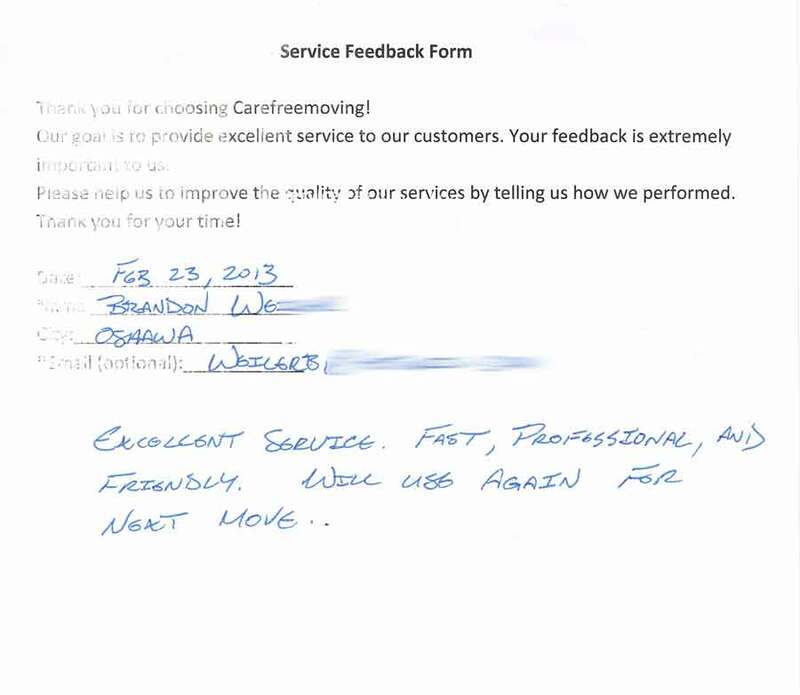 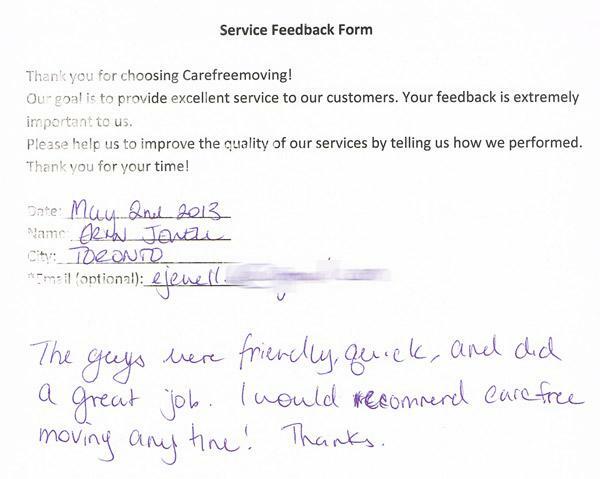 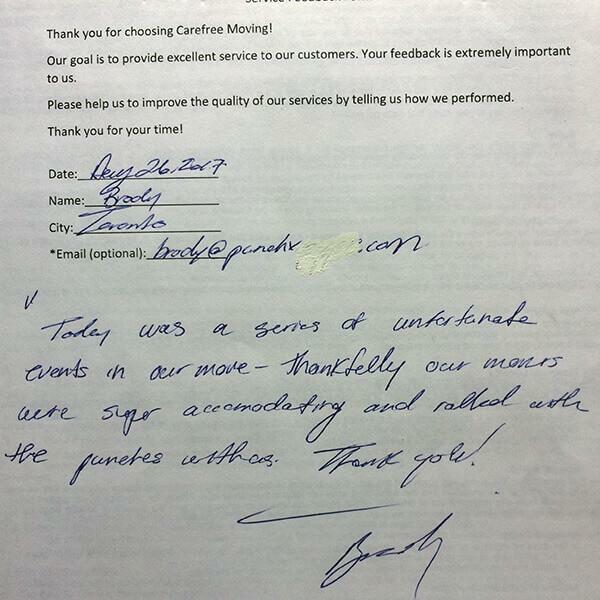 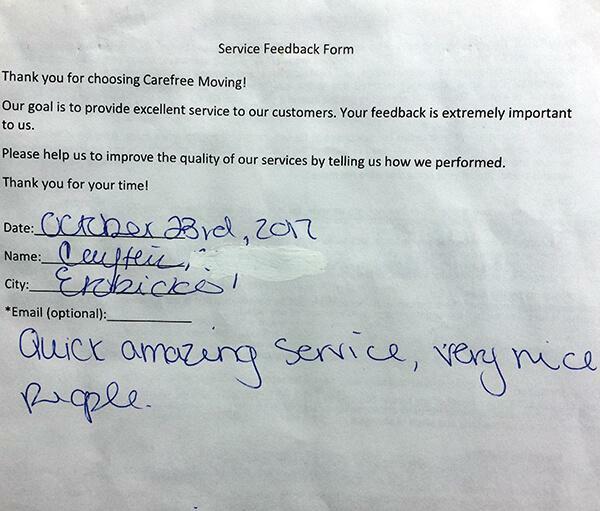 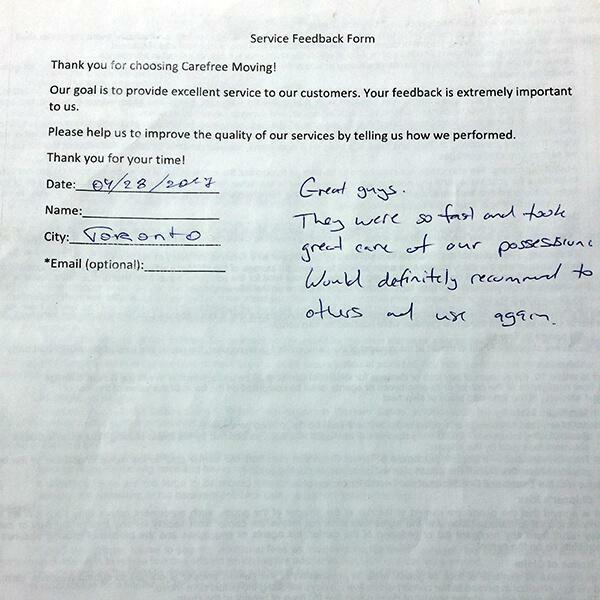 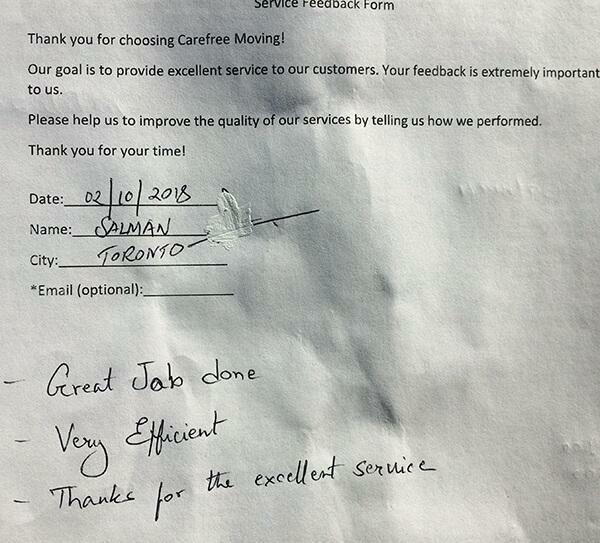 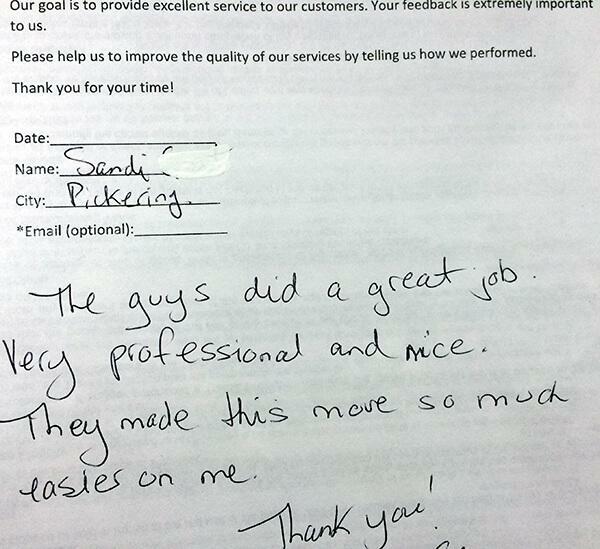 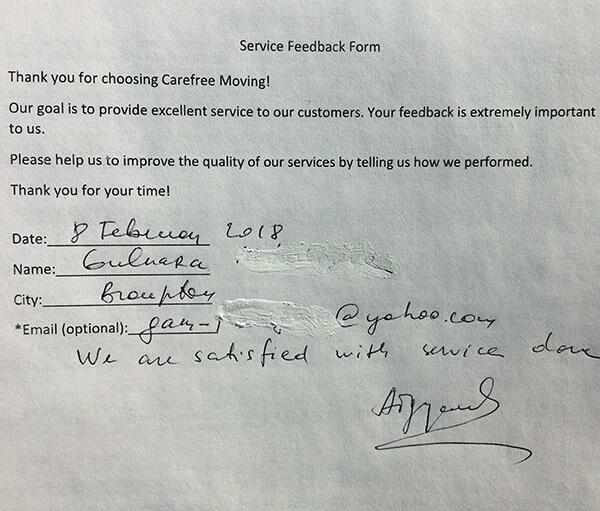 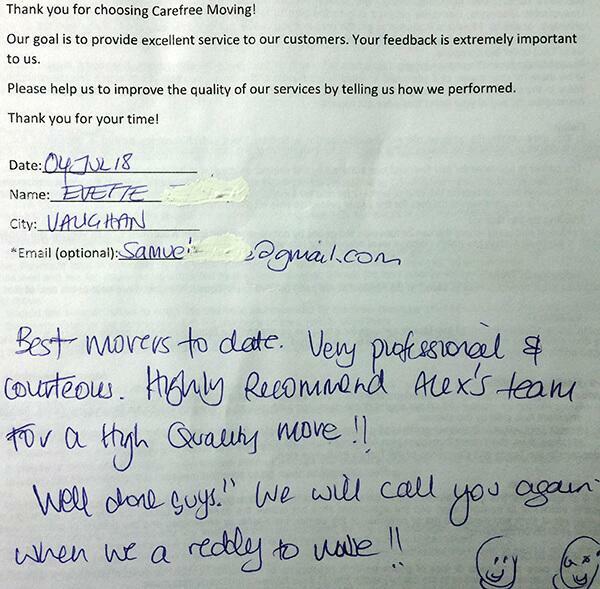 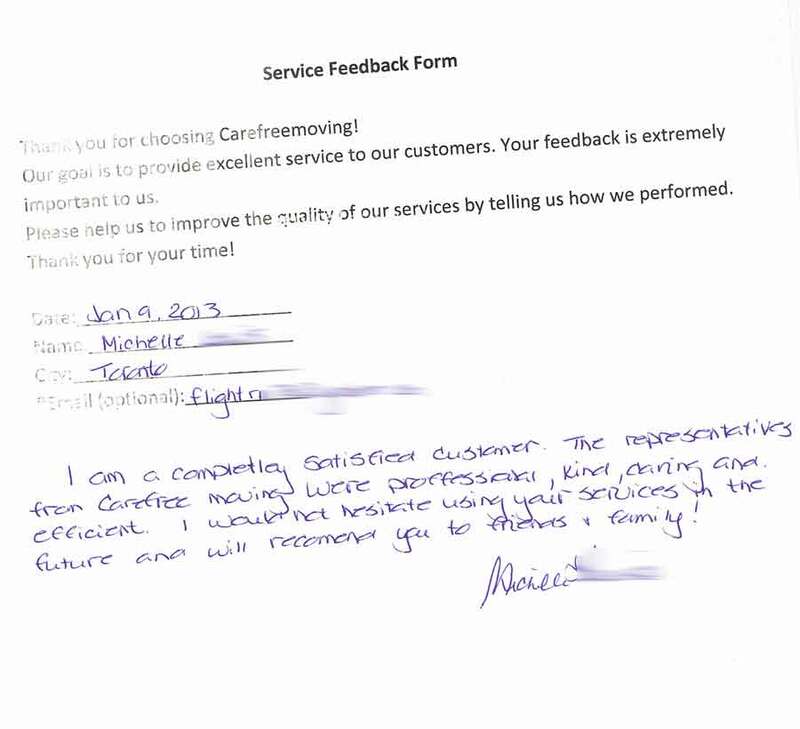 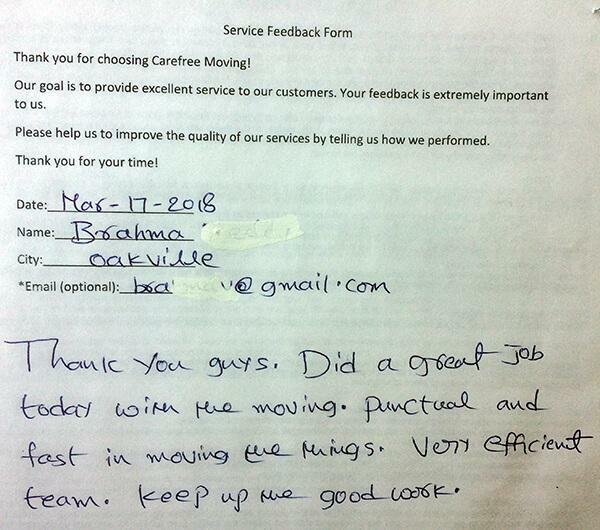 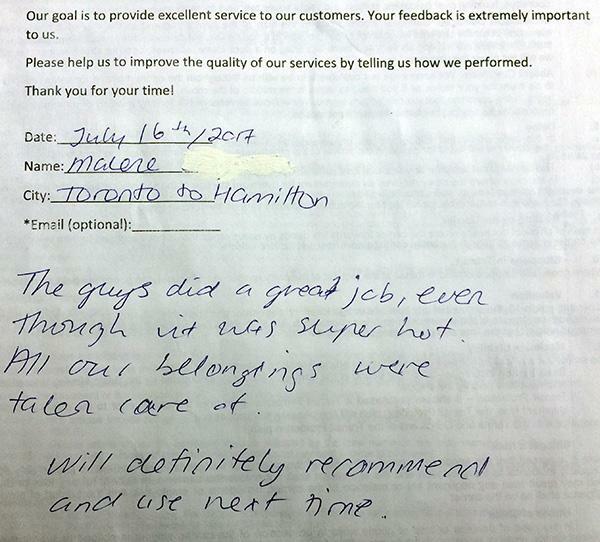 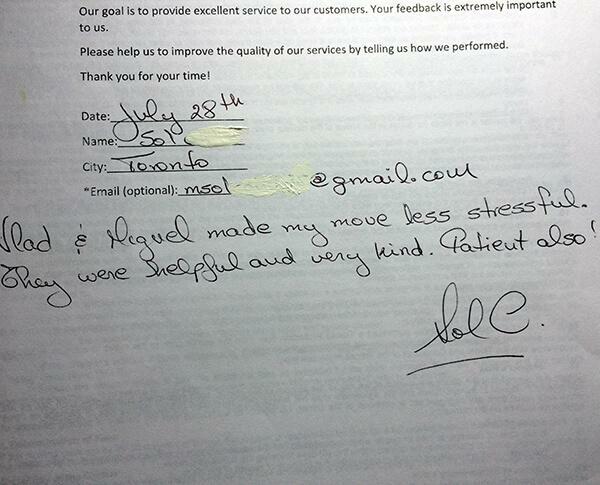 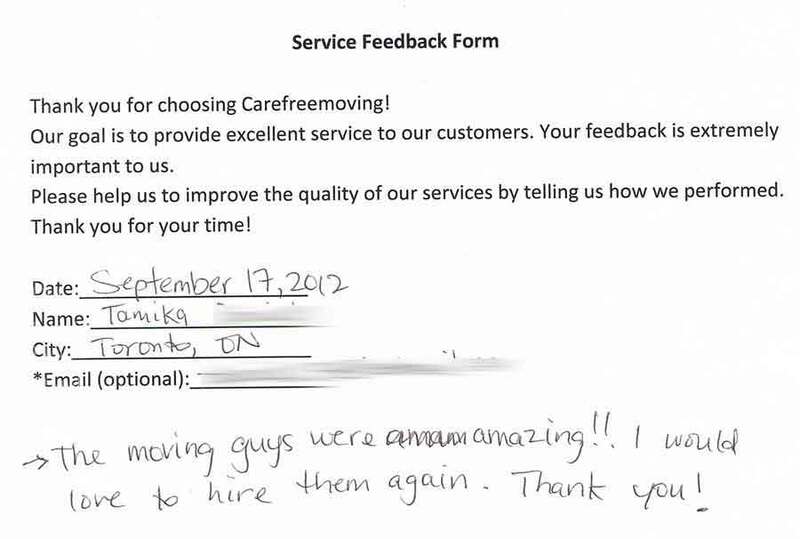 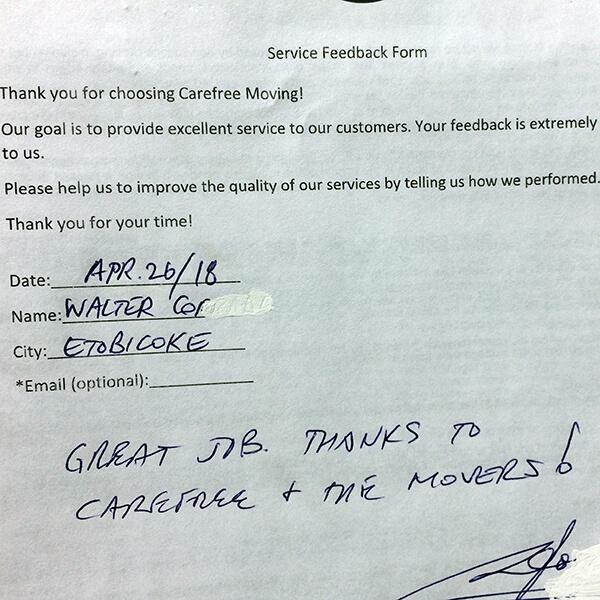 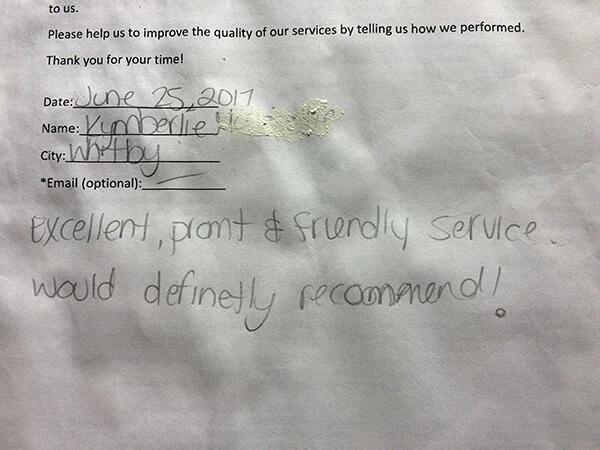 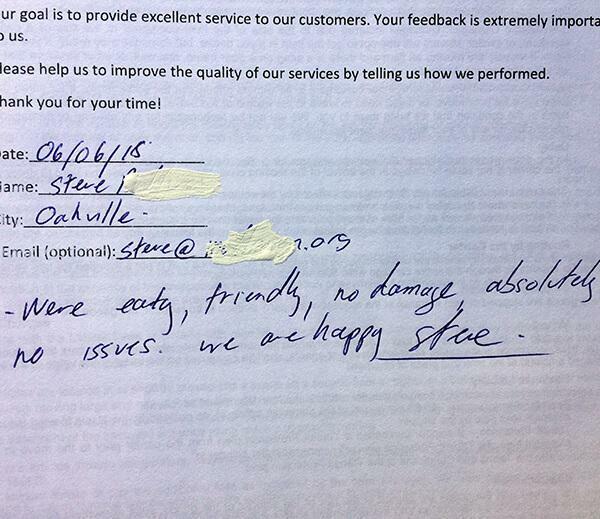 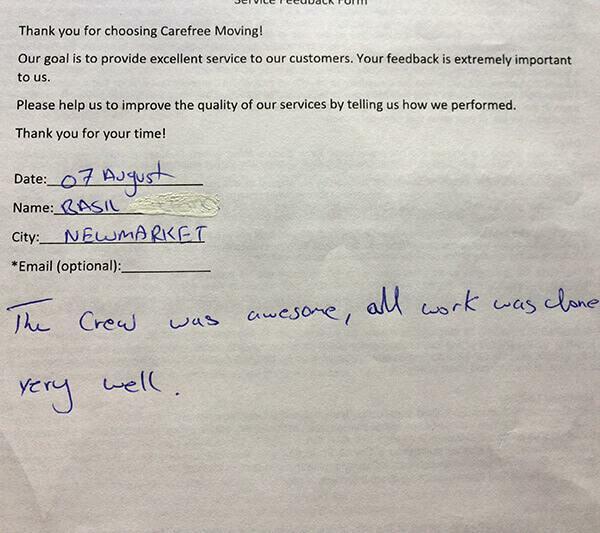 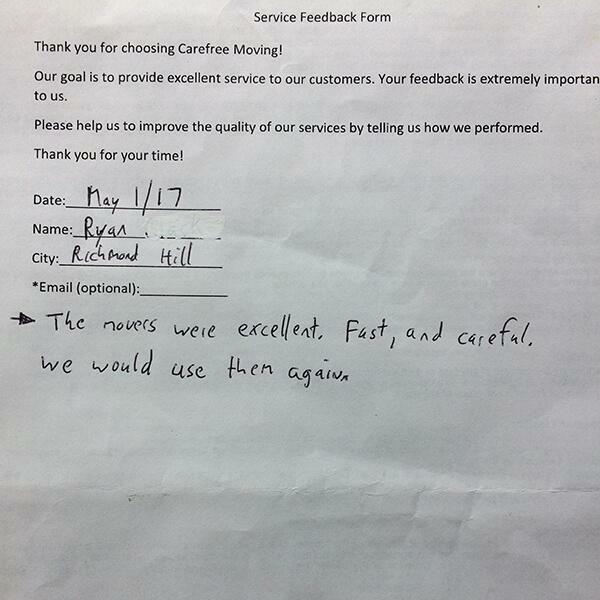 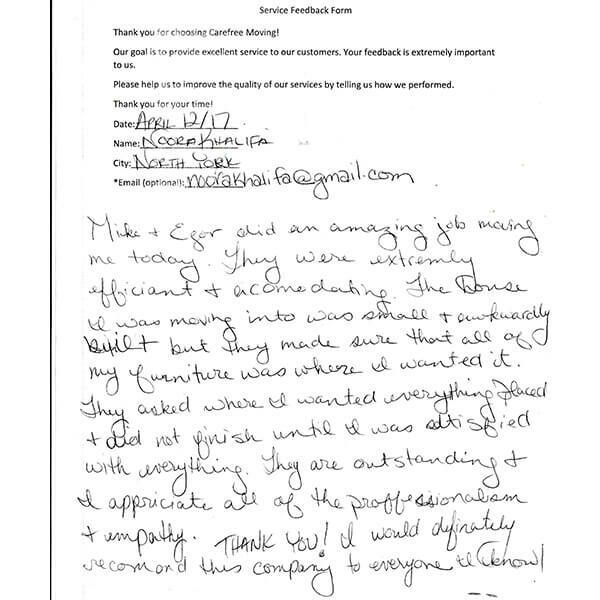 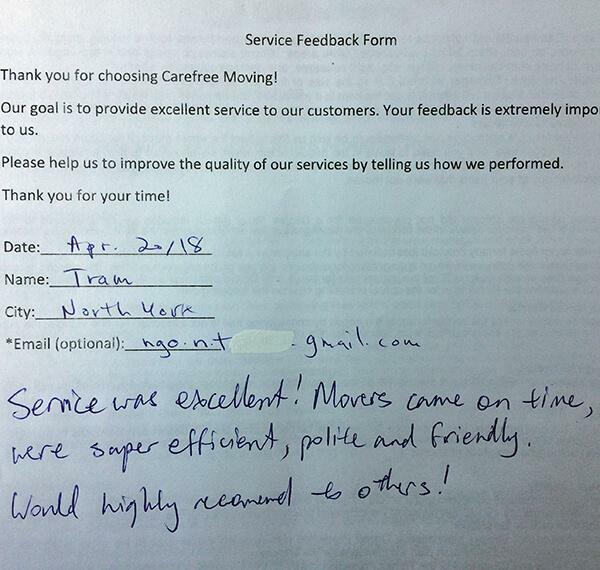 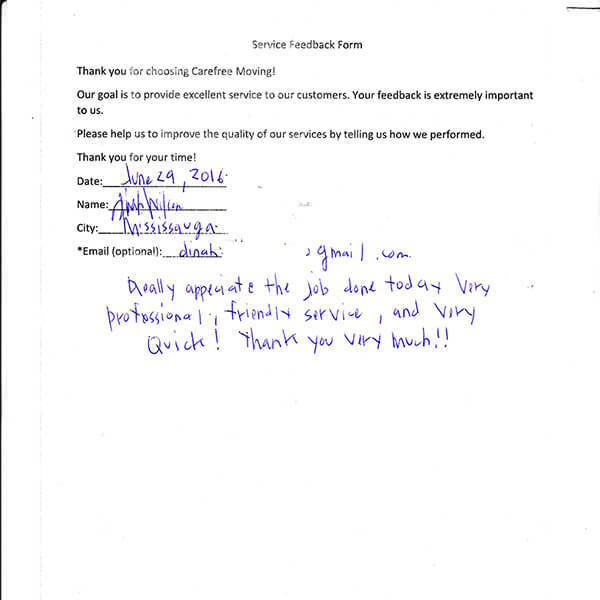 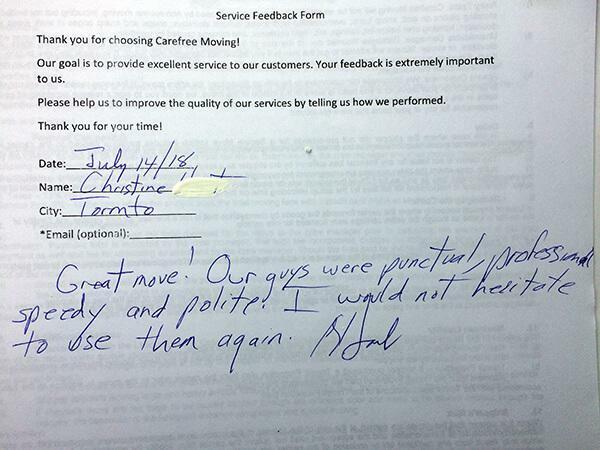 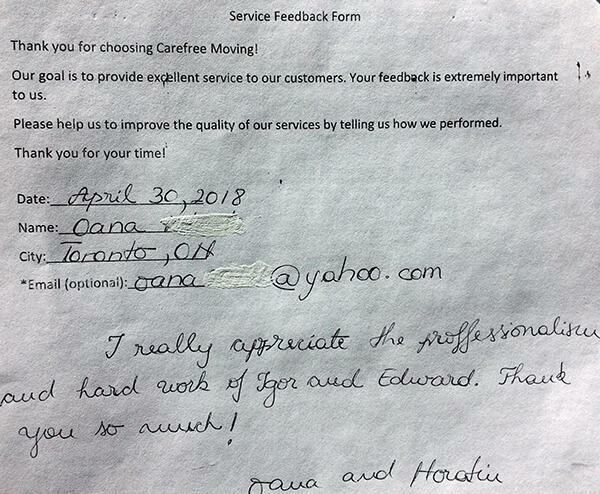 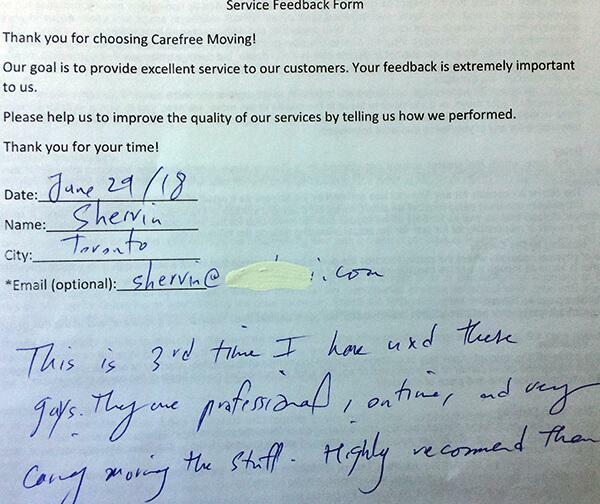 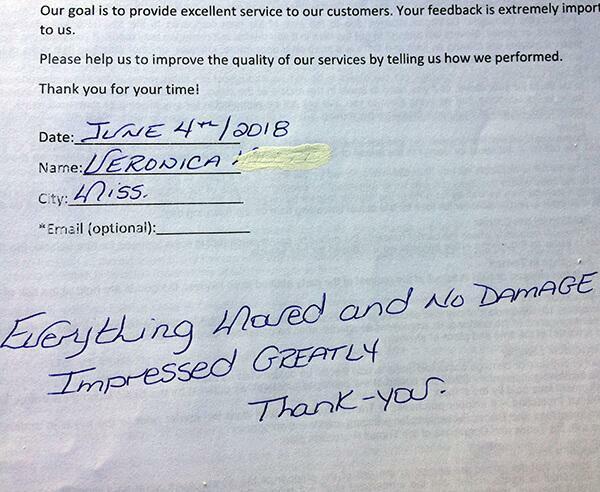 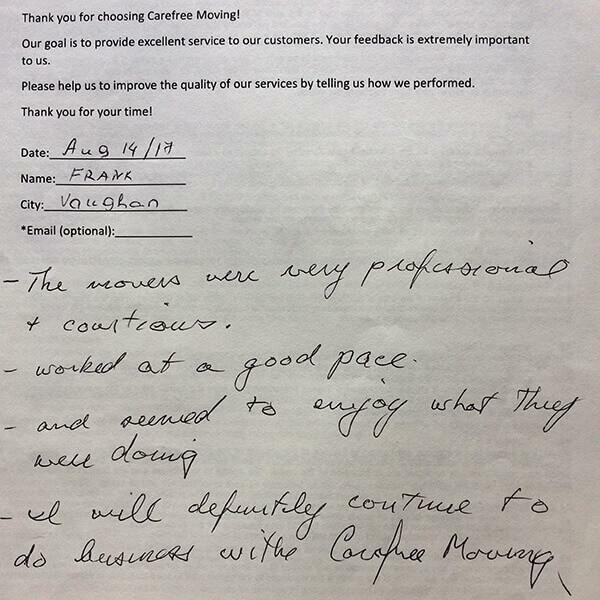 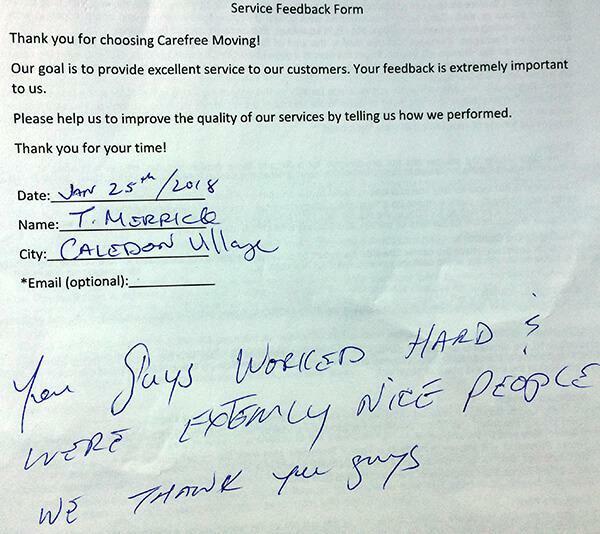 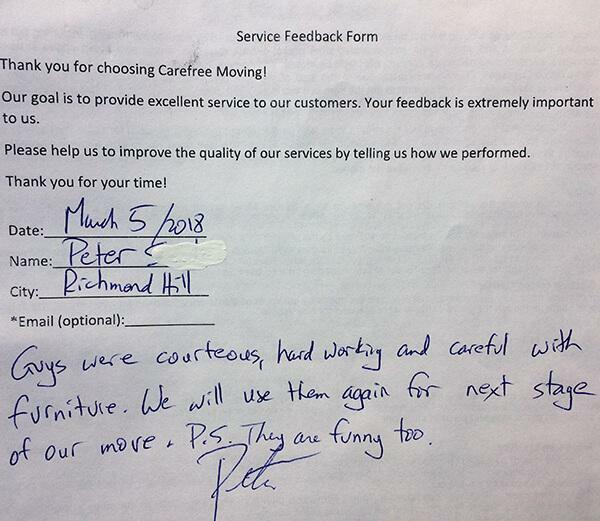 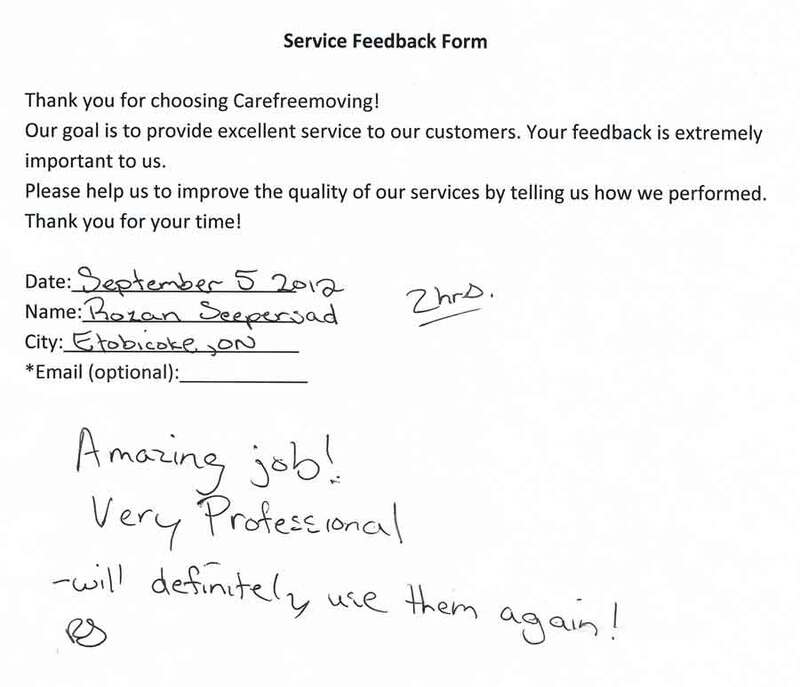 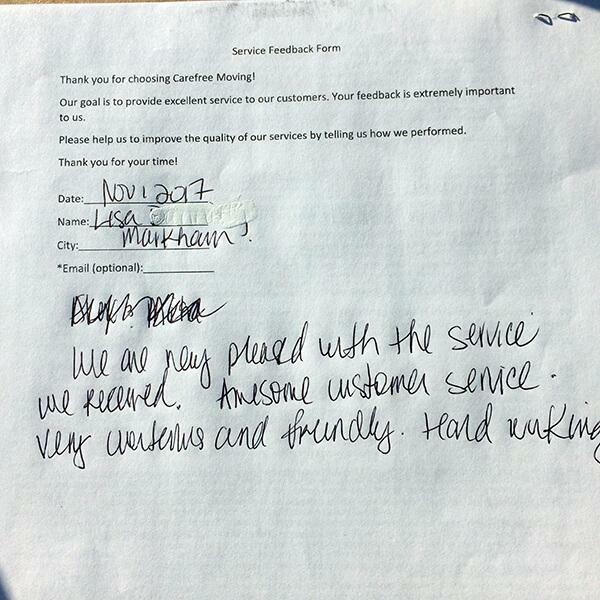 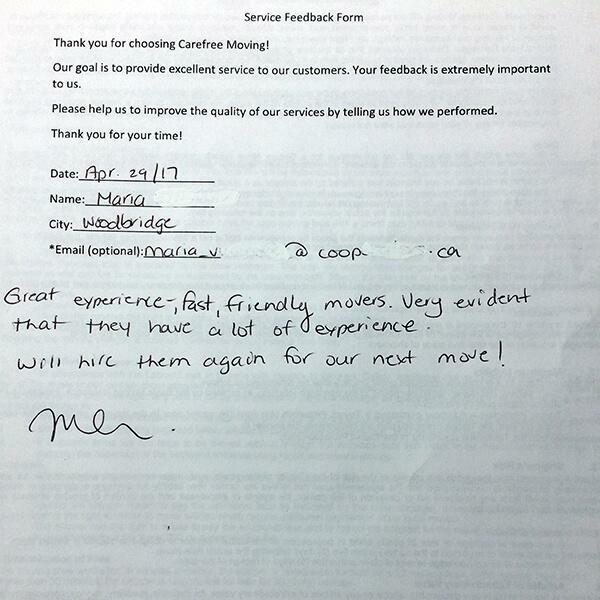 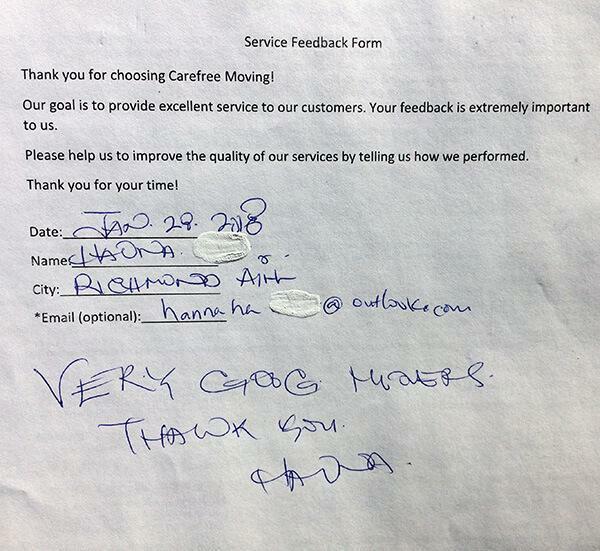 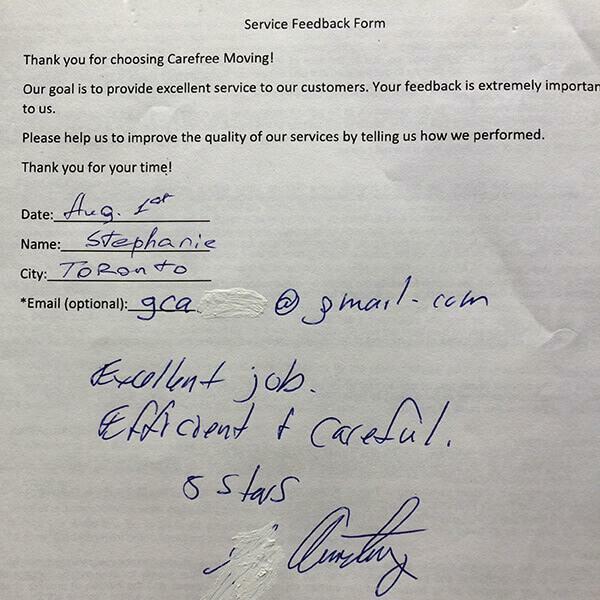 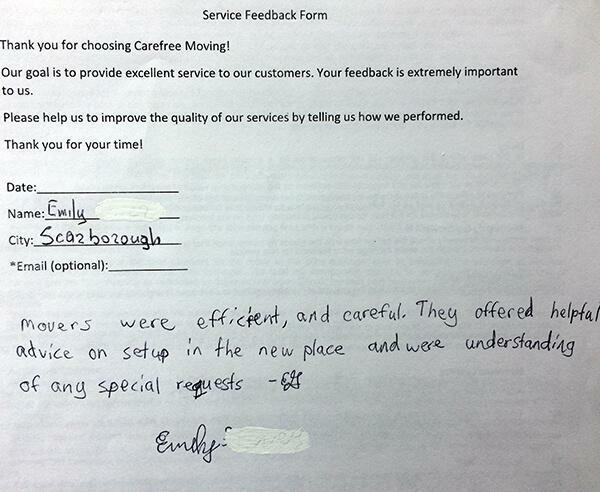 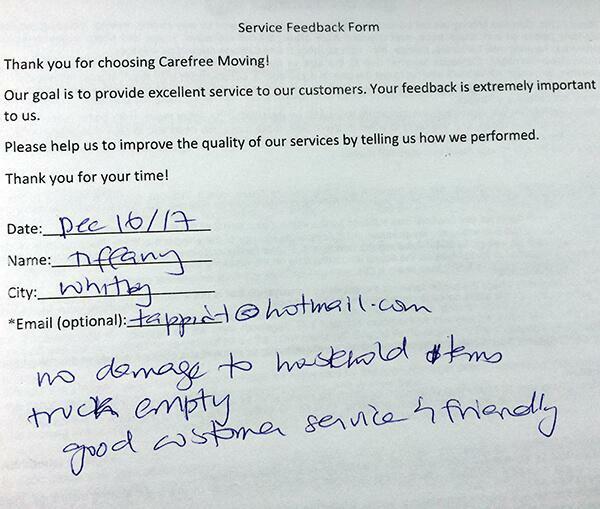 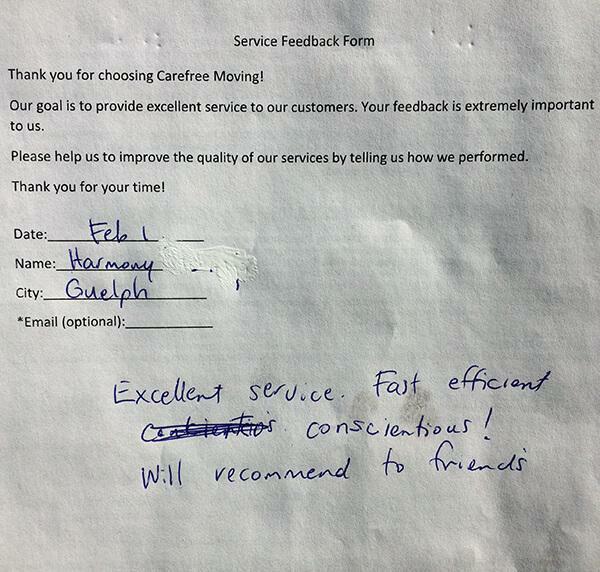 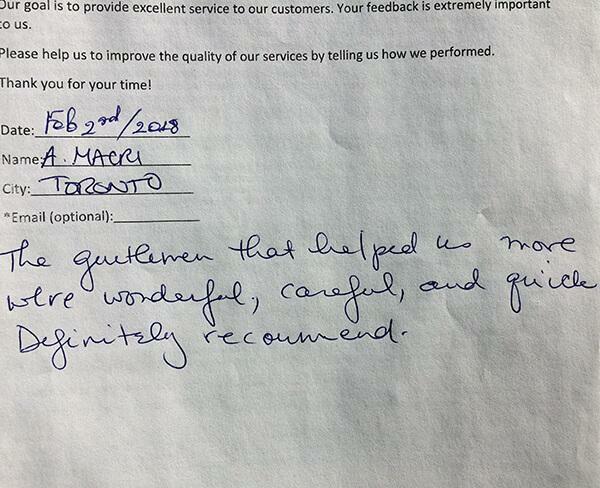 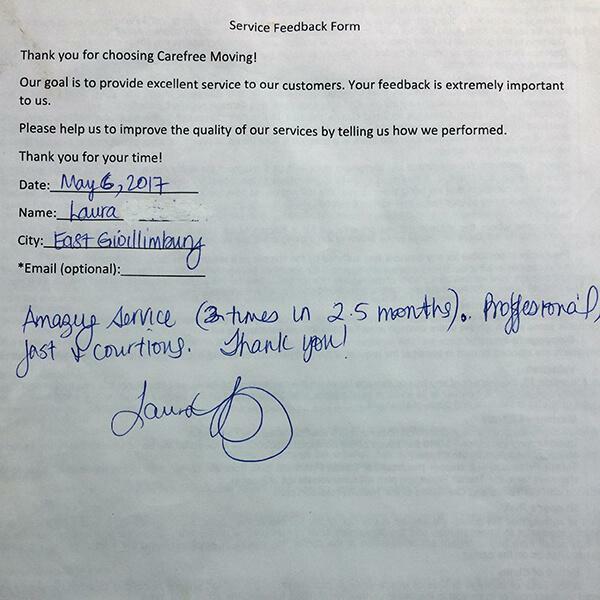 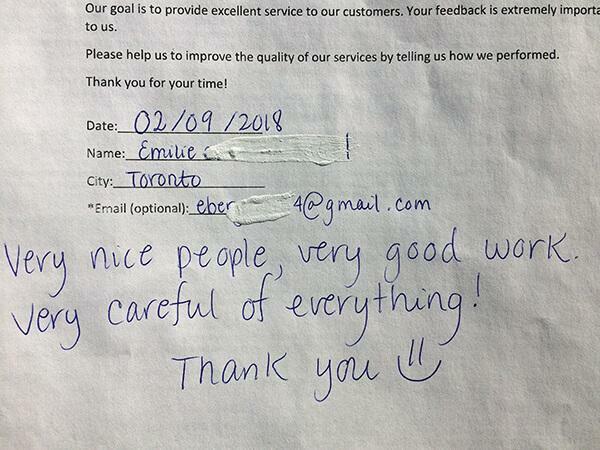 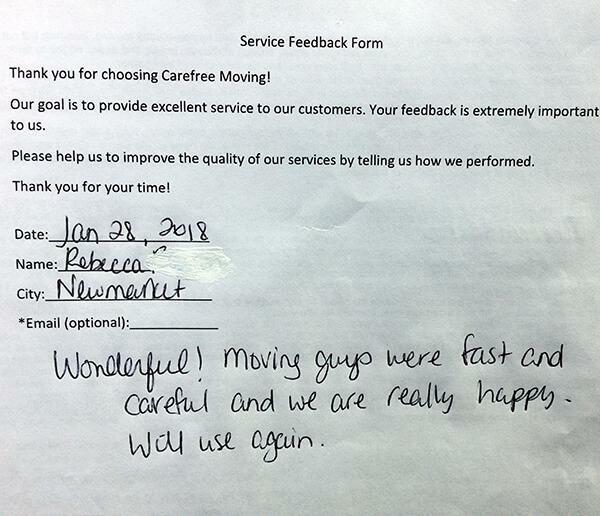 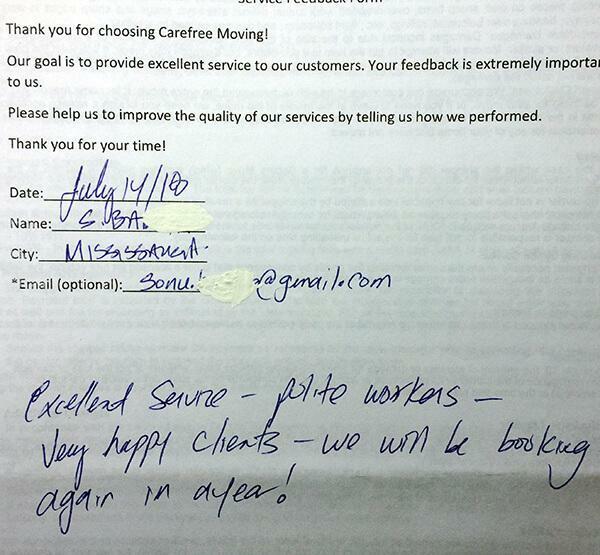 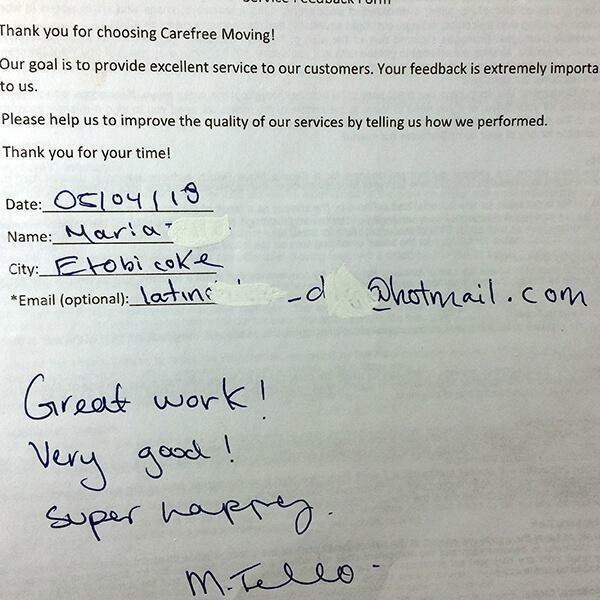 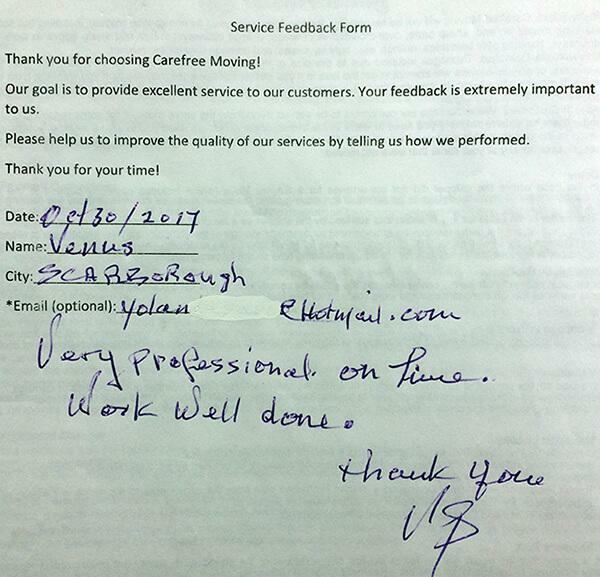 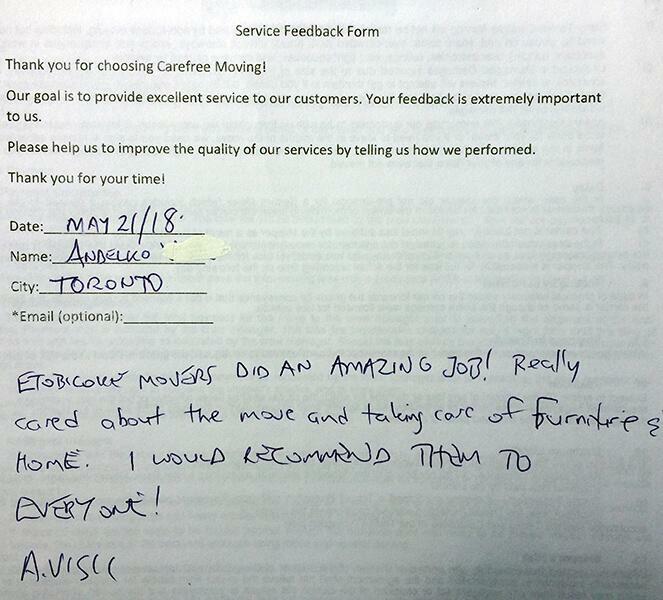 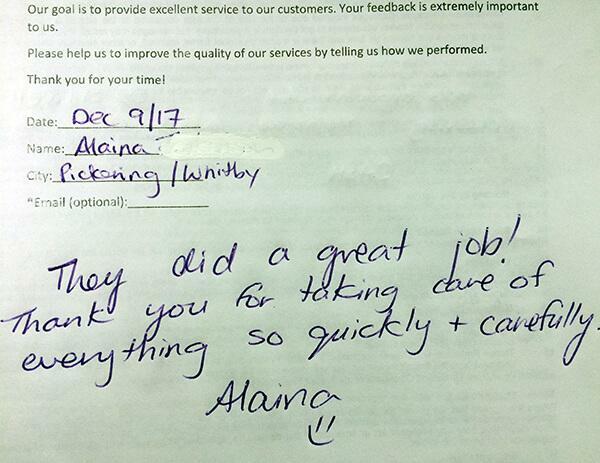 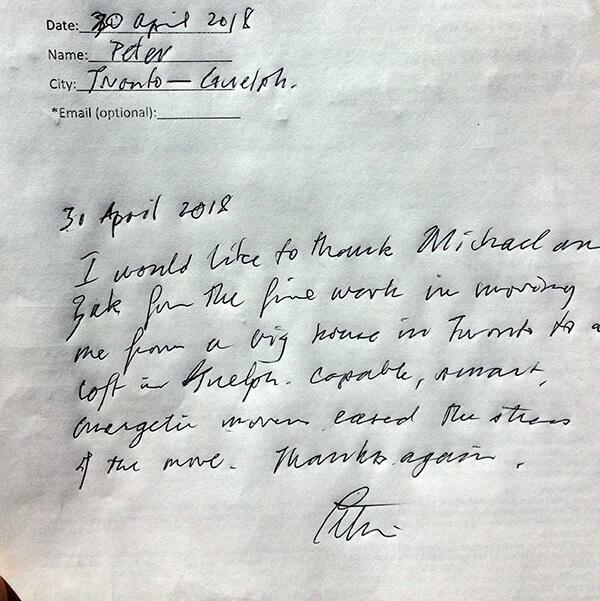 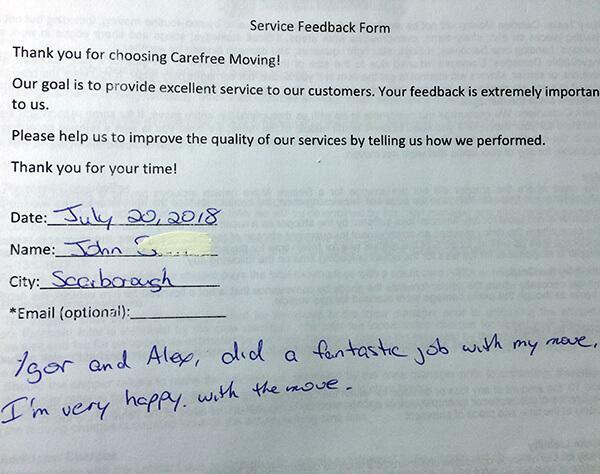 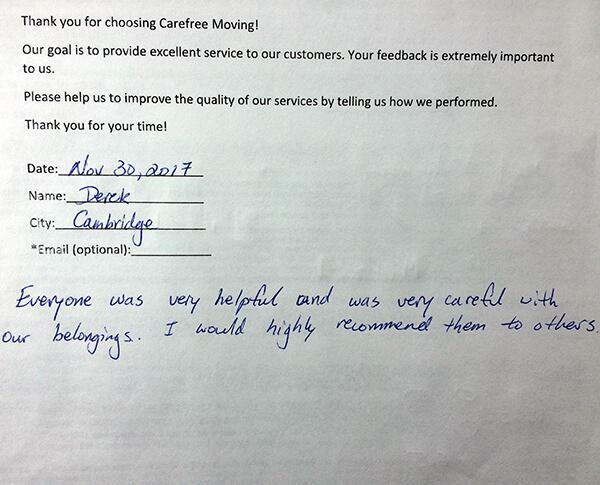 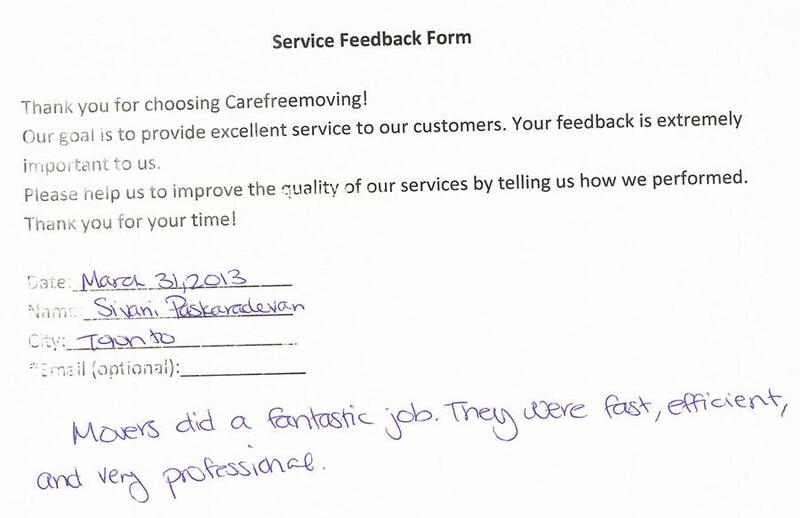 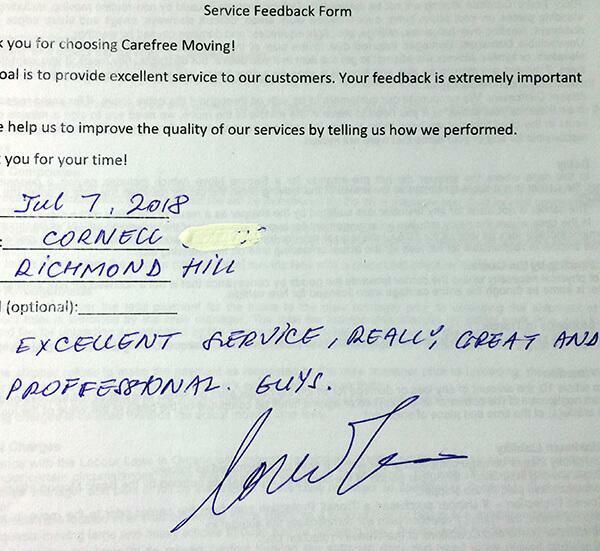 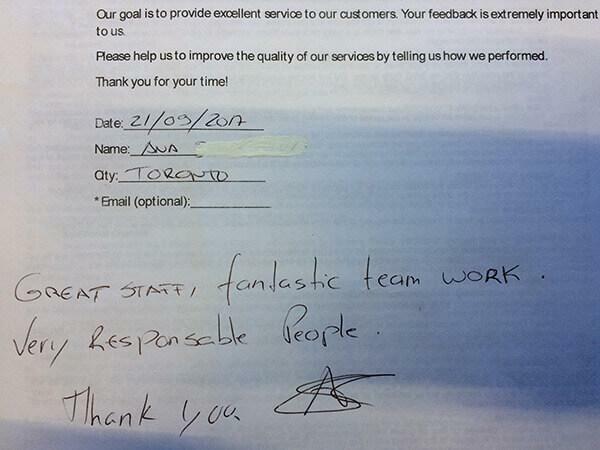 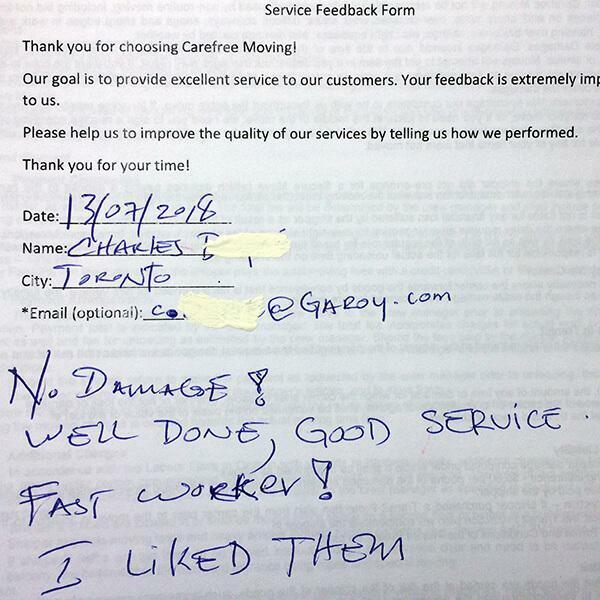 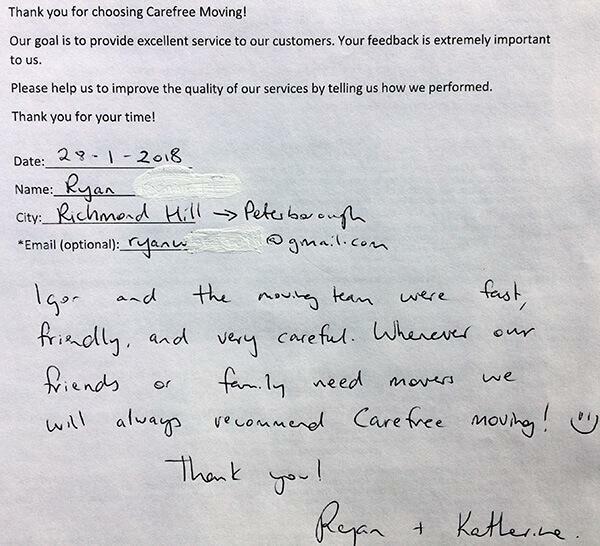 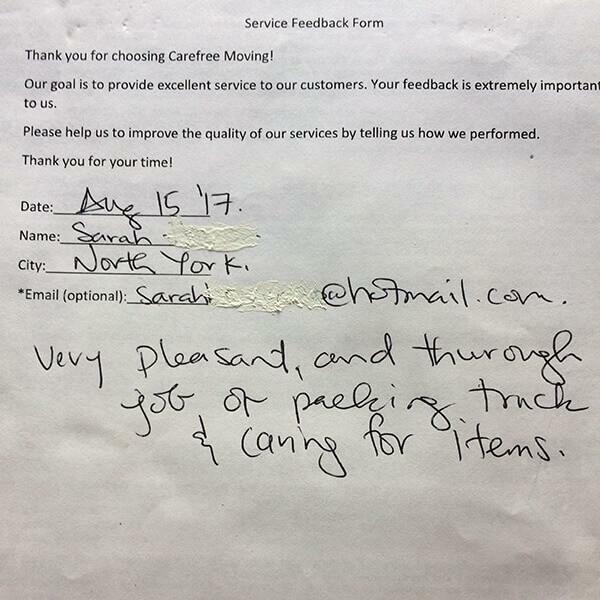 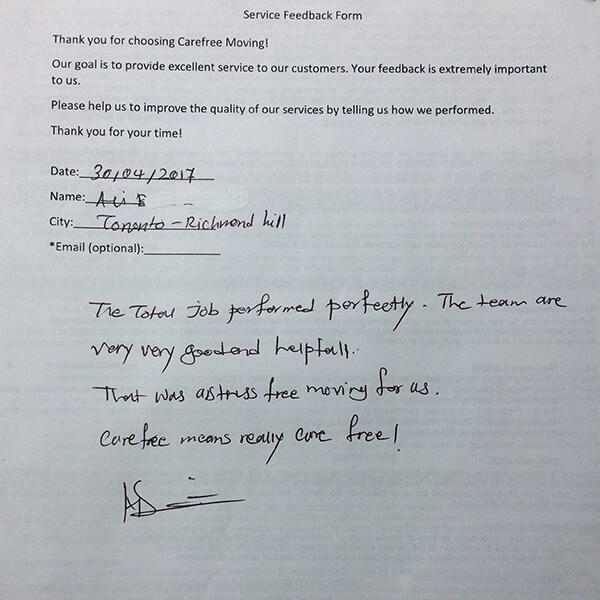 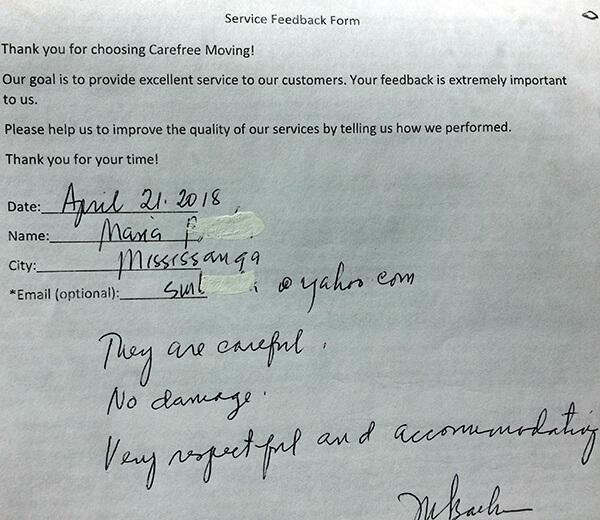 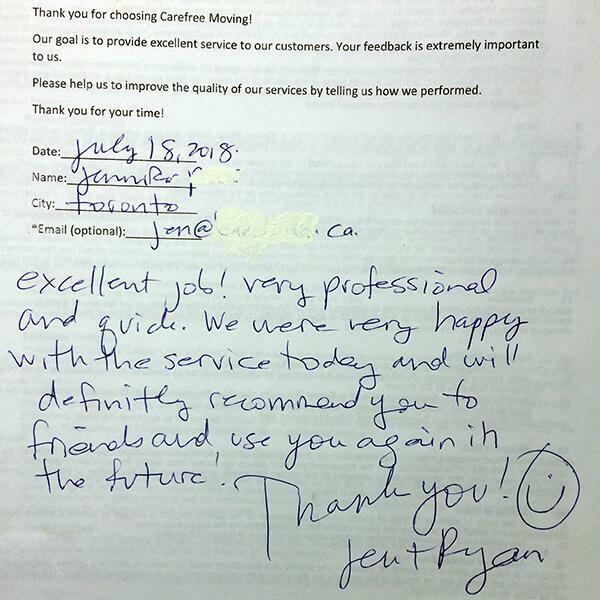 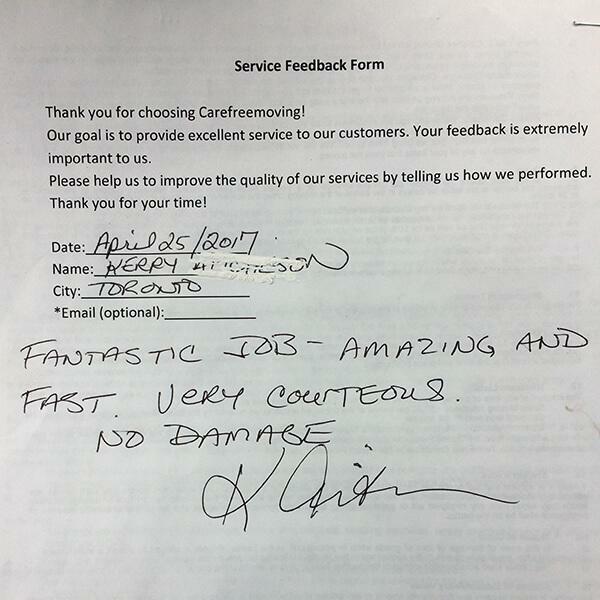 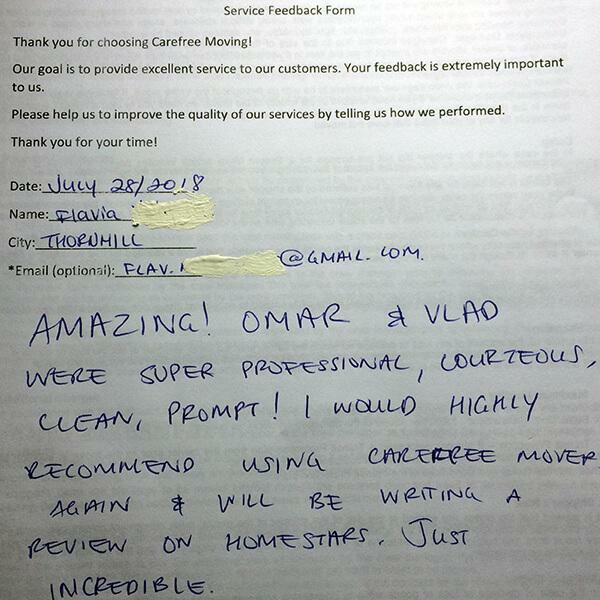 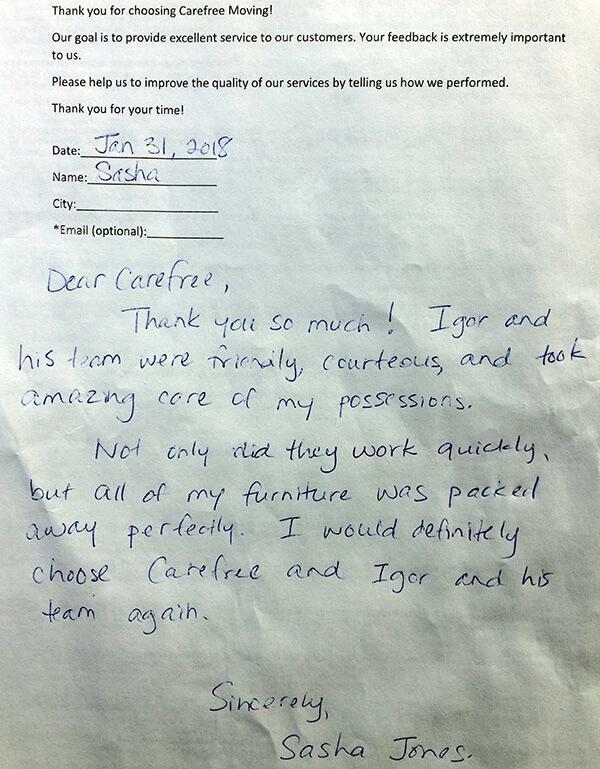 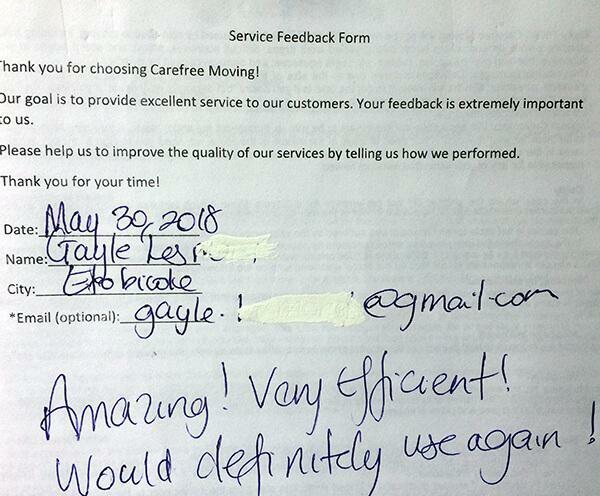 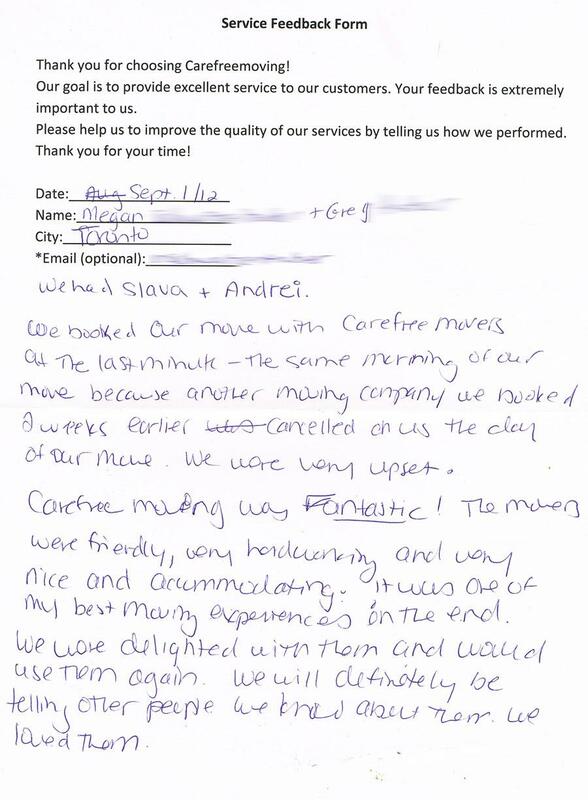 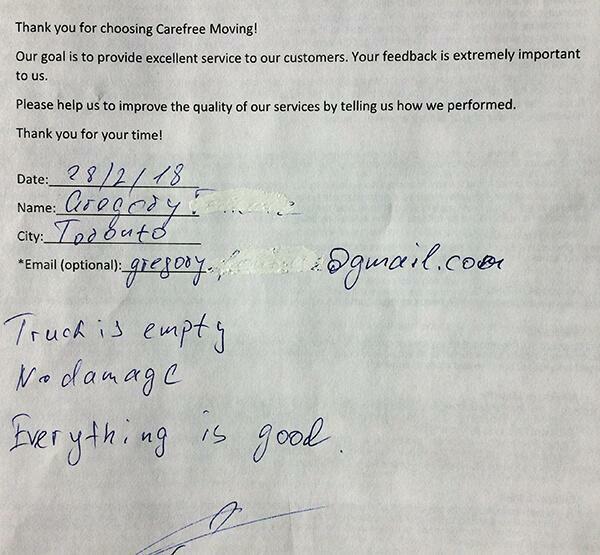 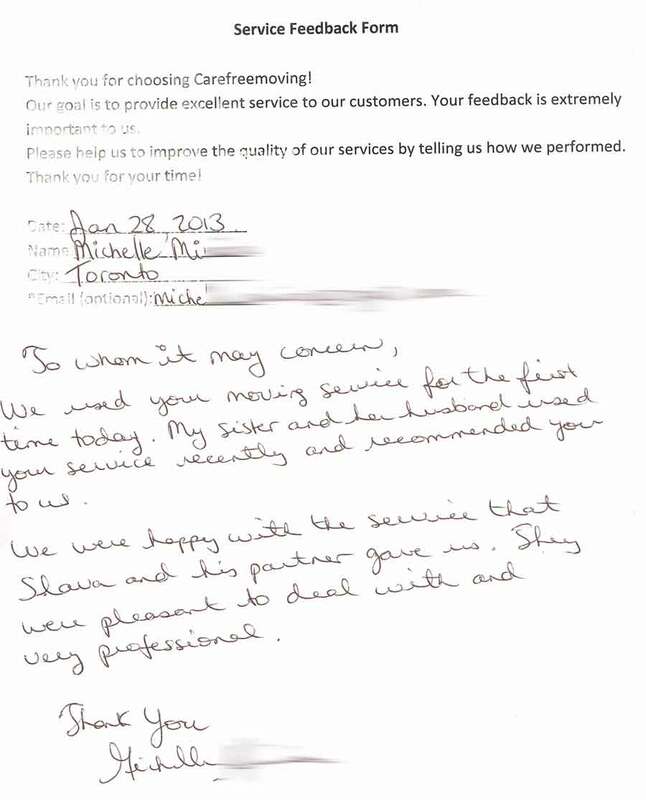 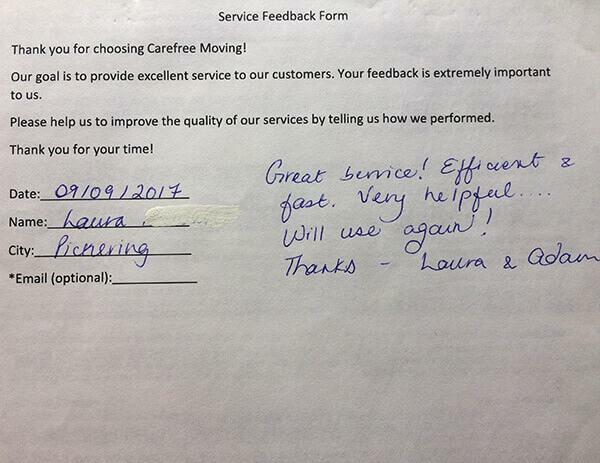 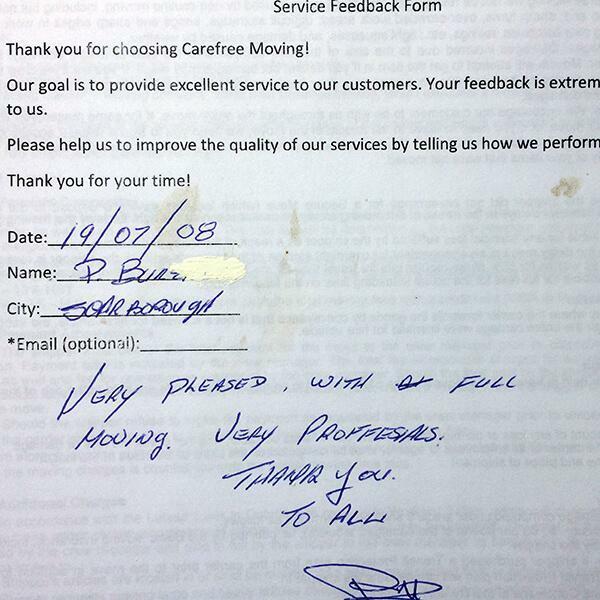 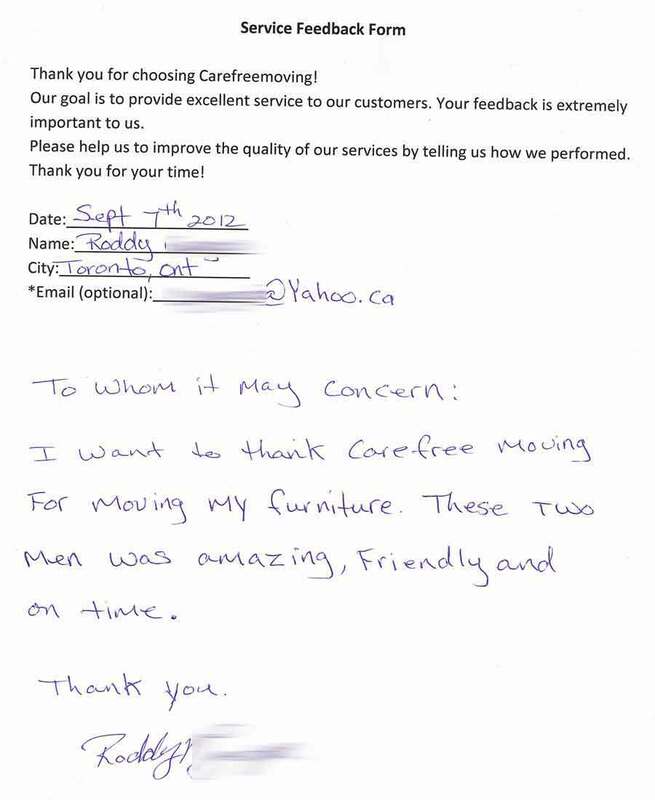 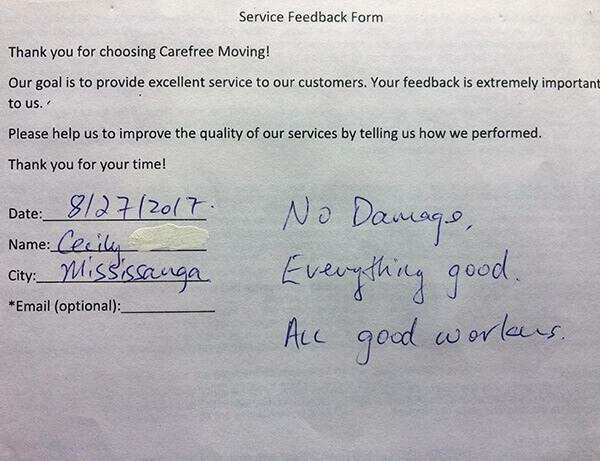 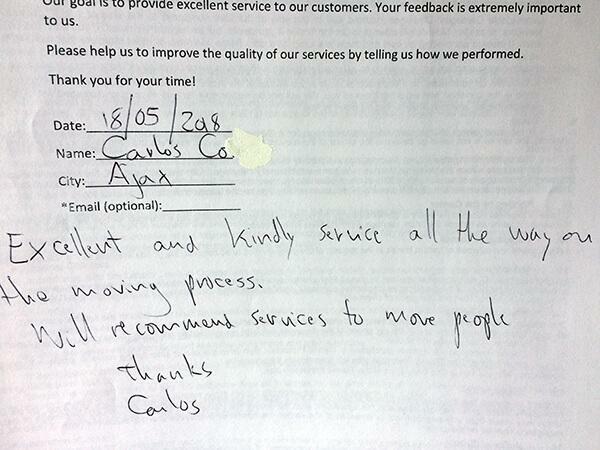 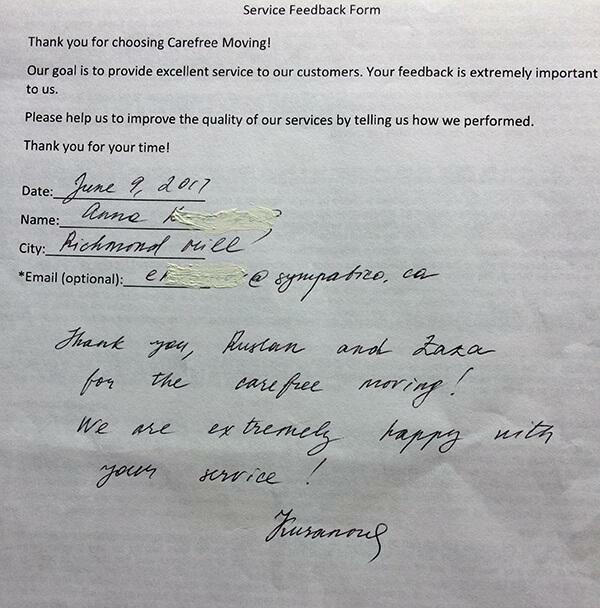 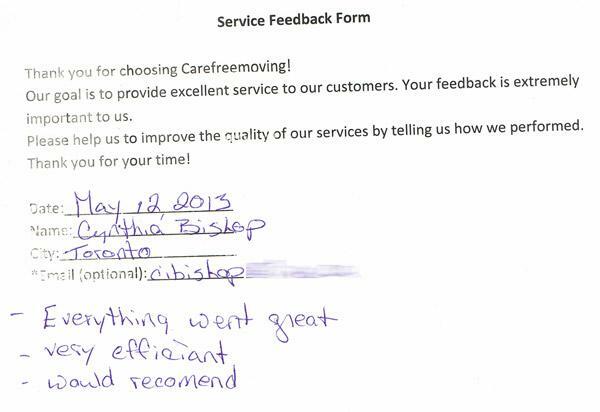 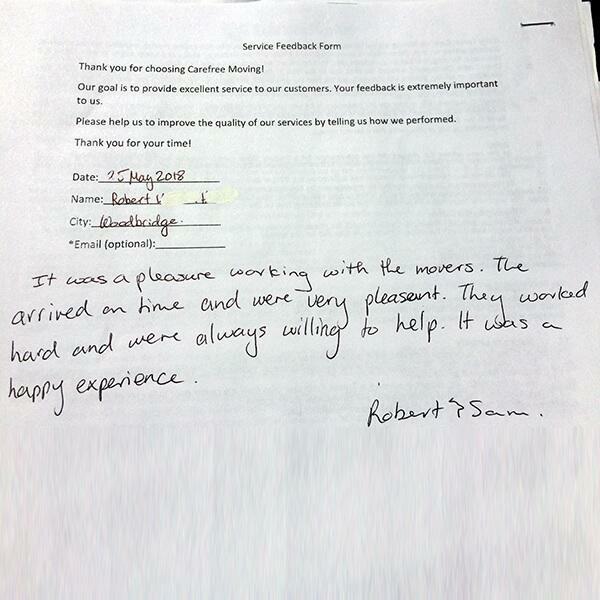 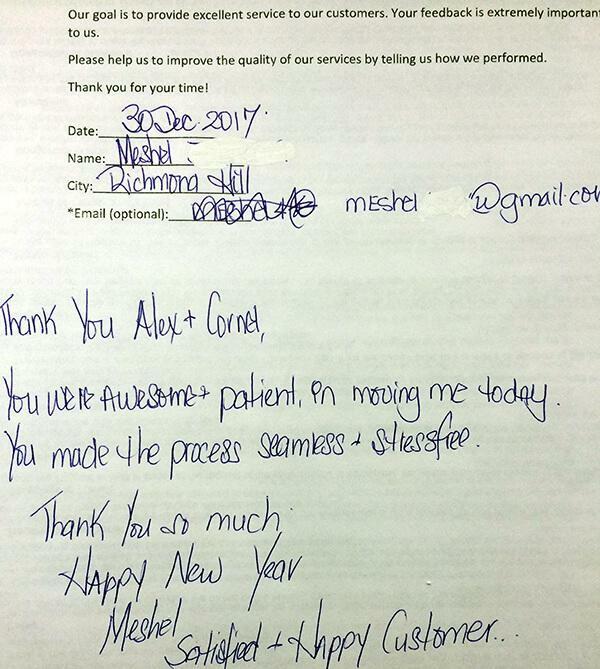 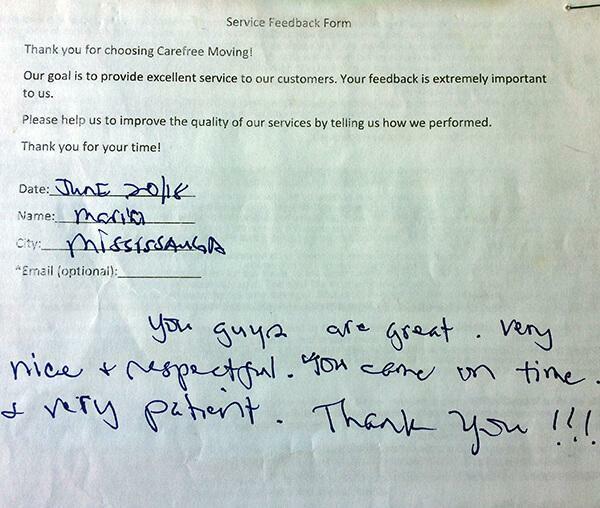 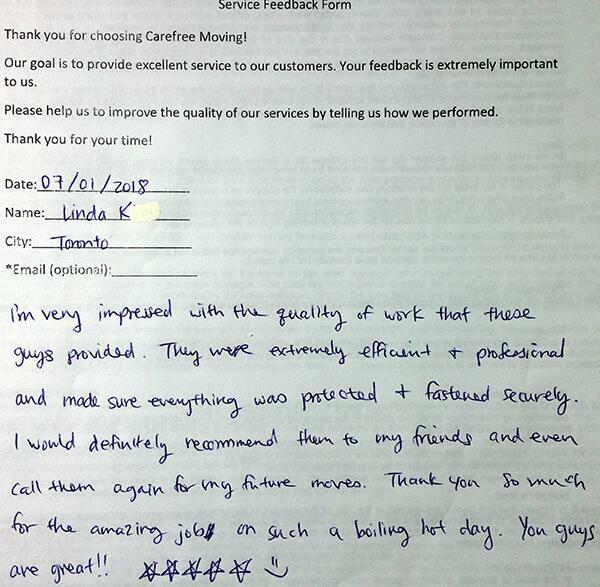 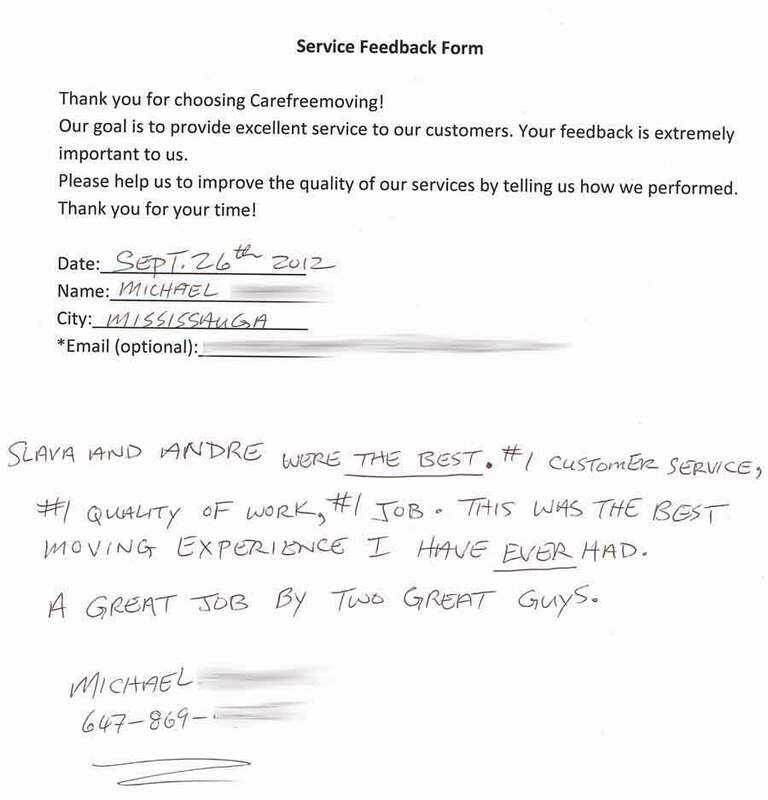 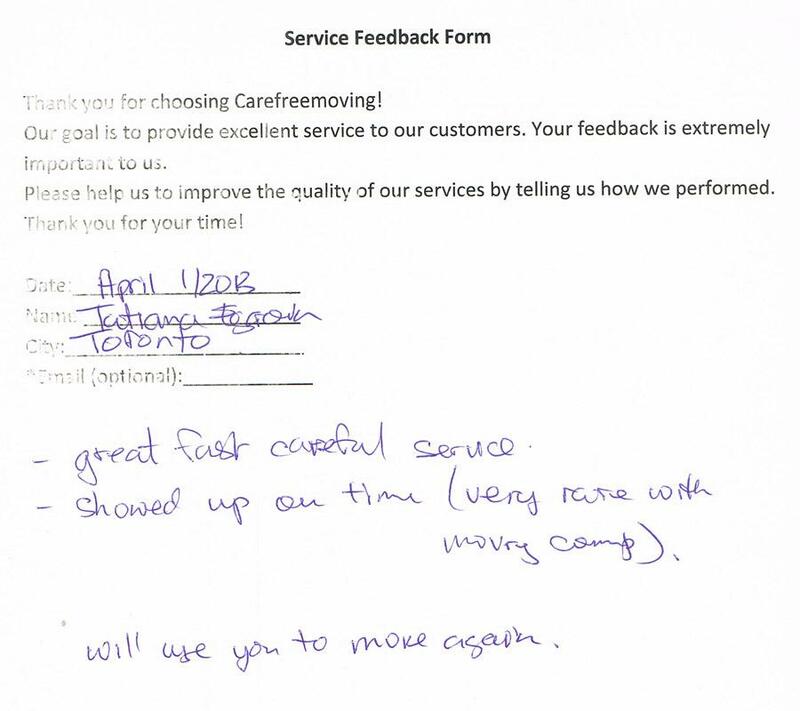 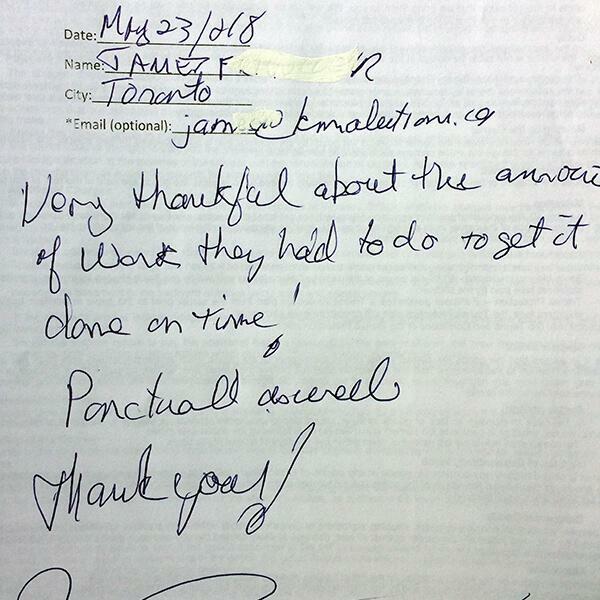 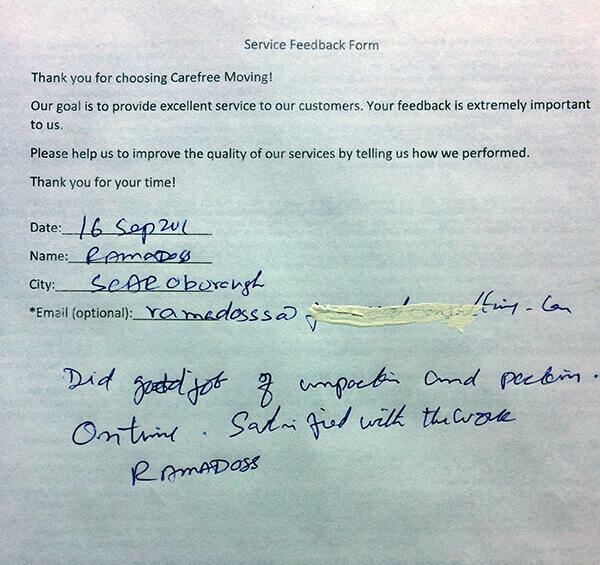 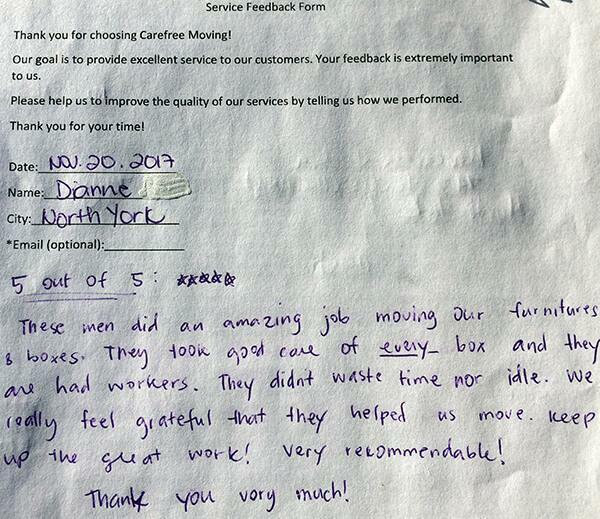 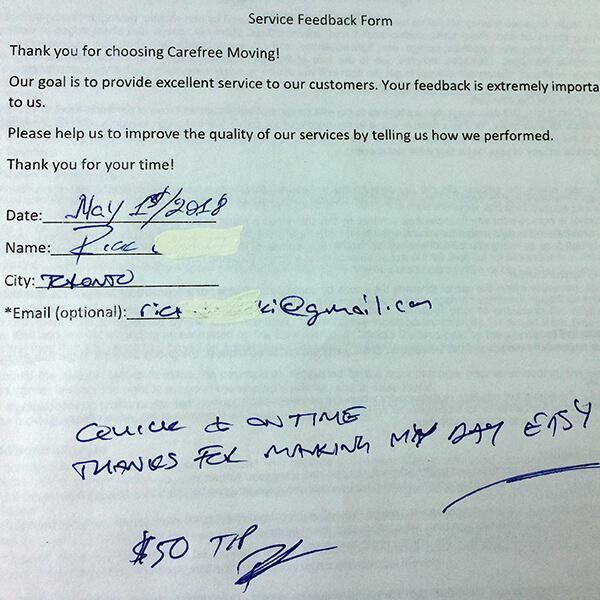 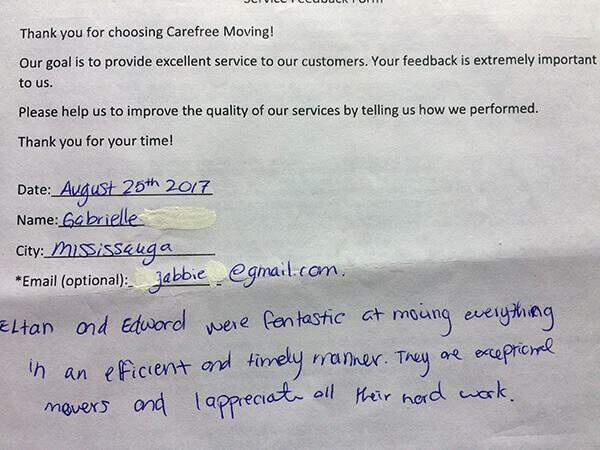 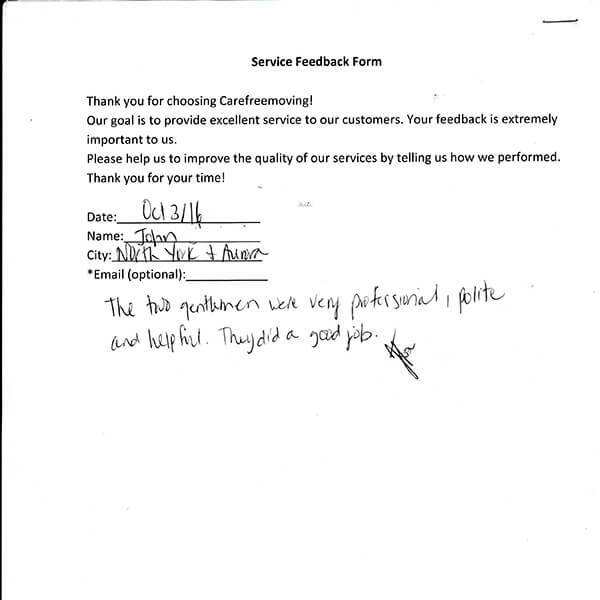 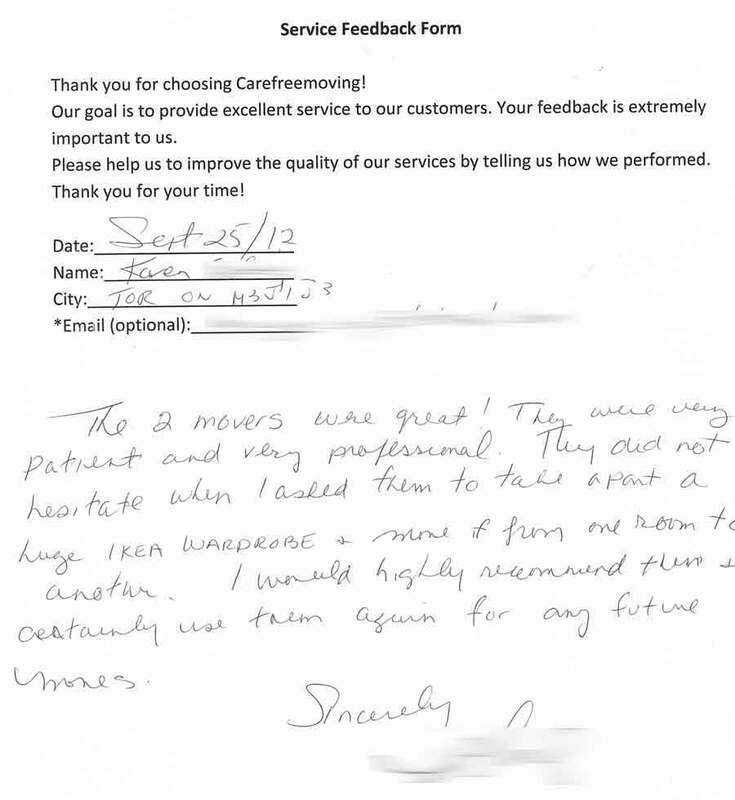 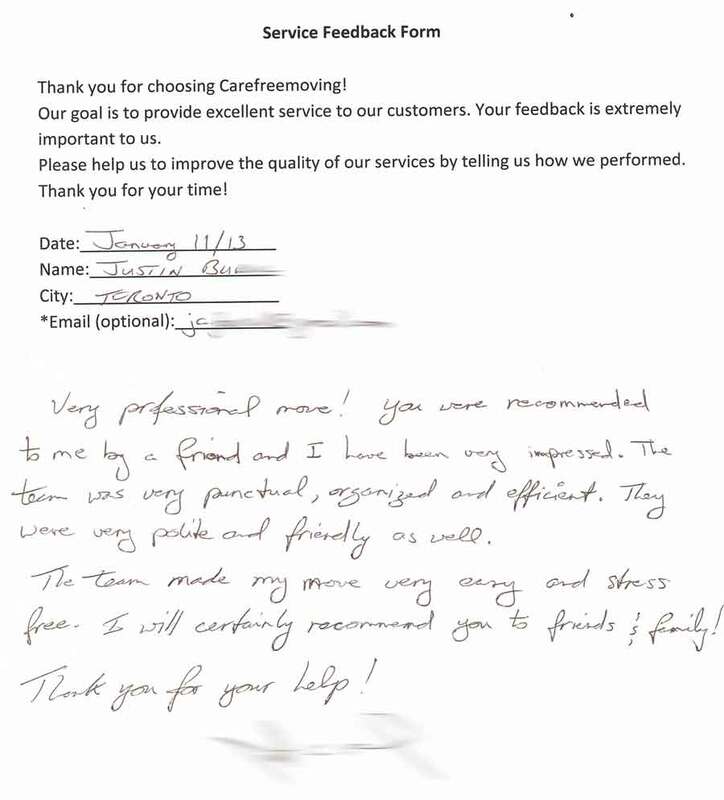 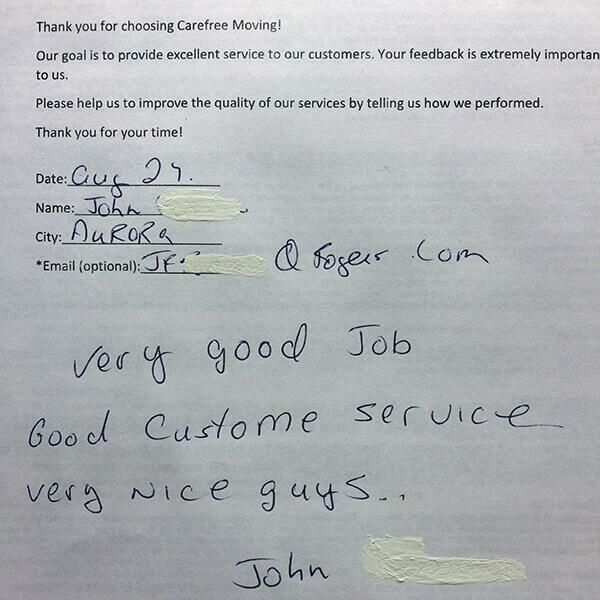 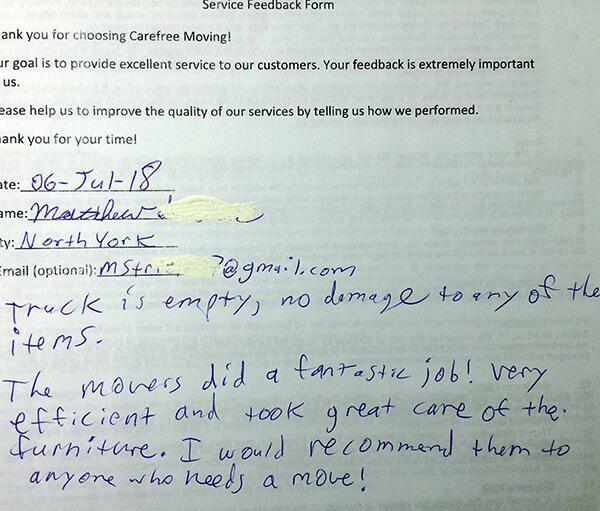 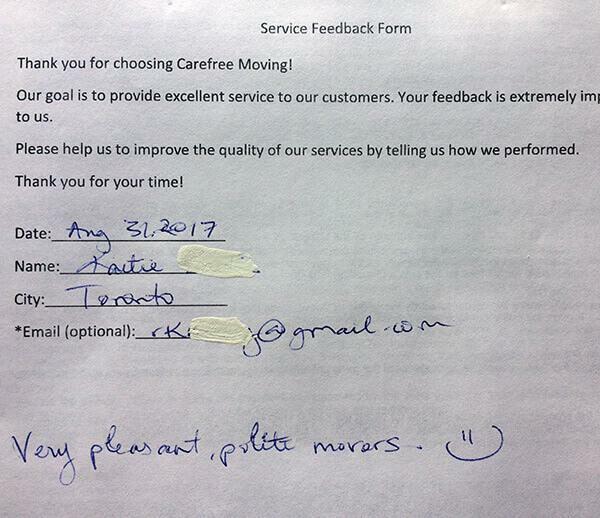 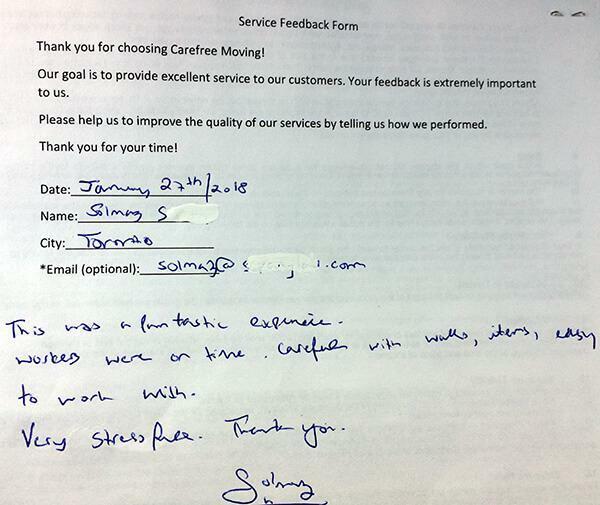 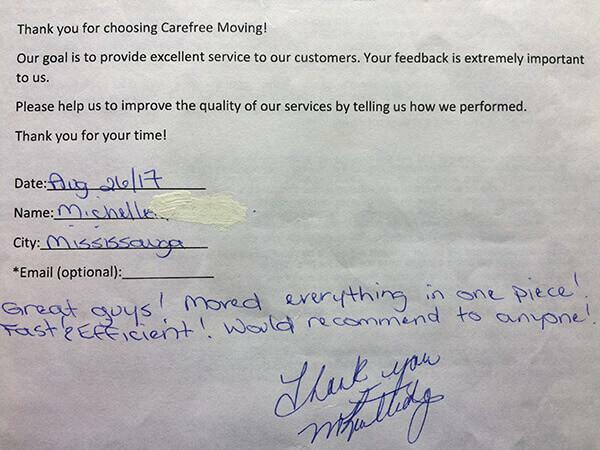 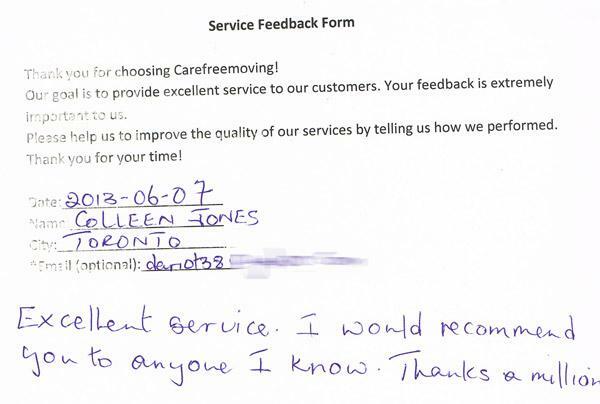 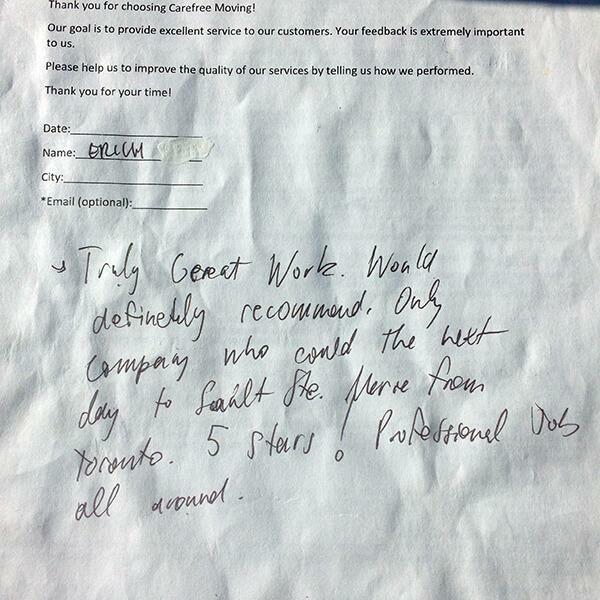 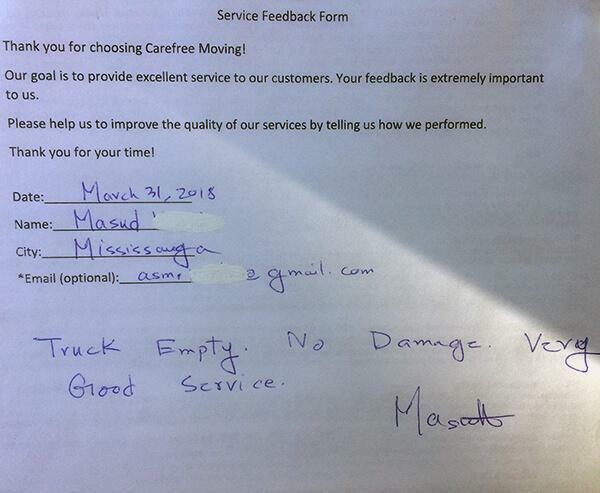 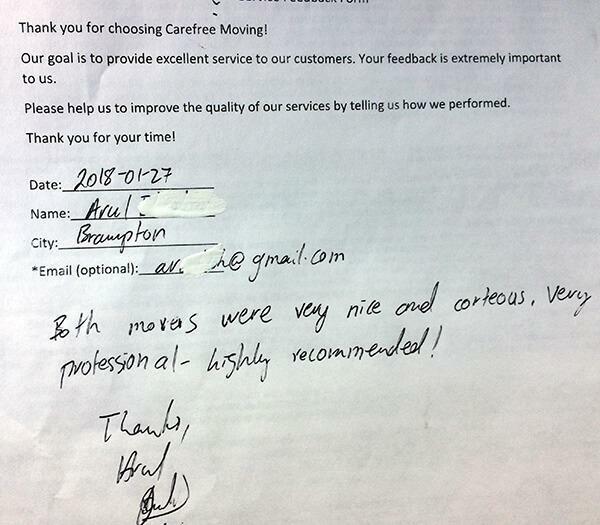 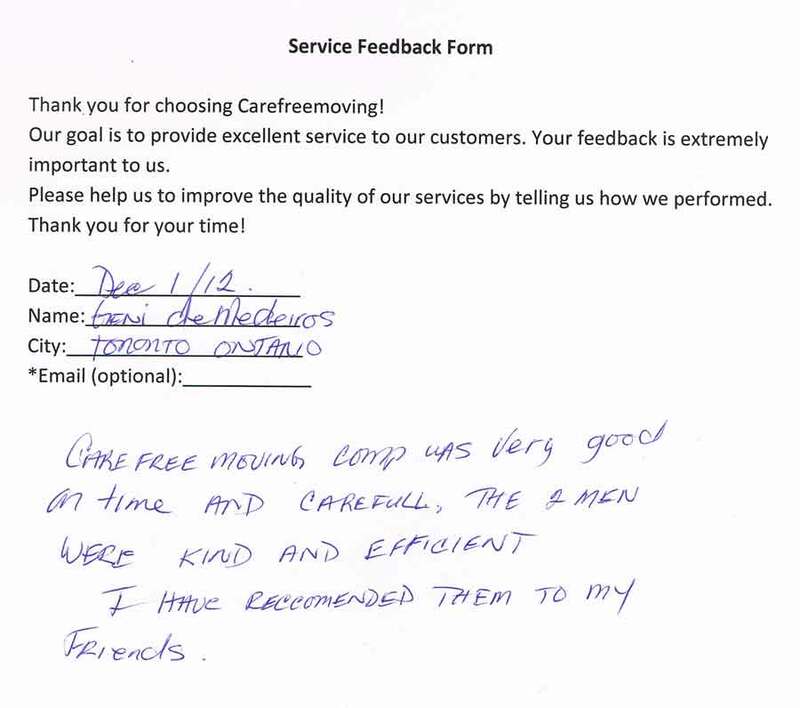 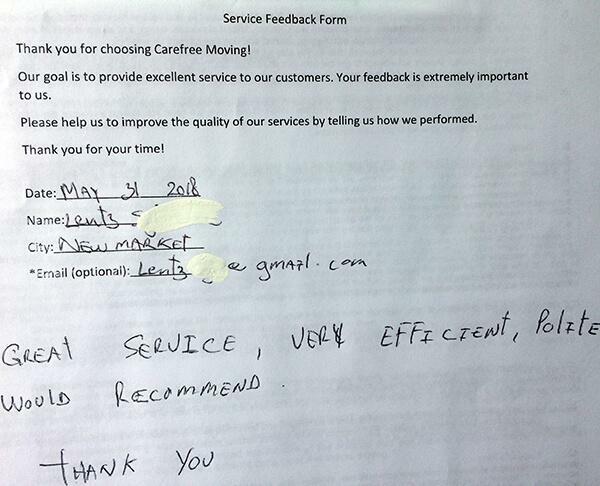 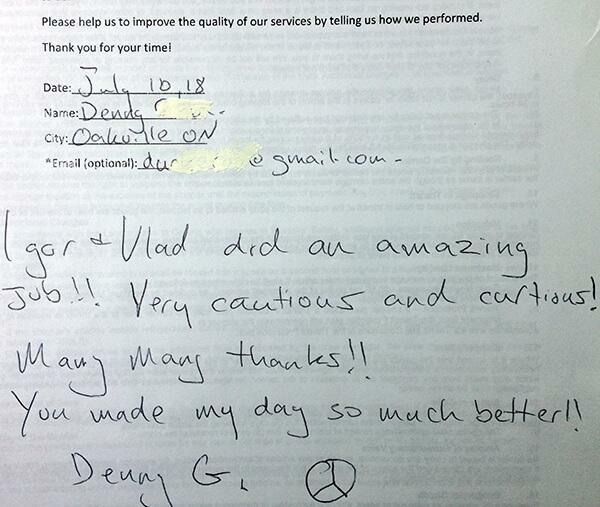 Welcome to Carefree Moving – one of the most trustworthy moving companies Toronto! 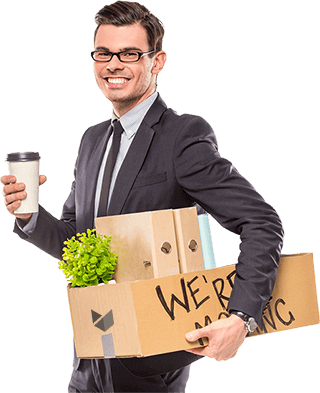 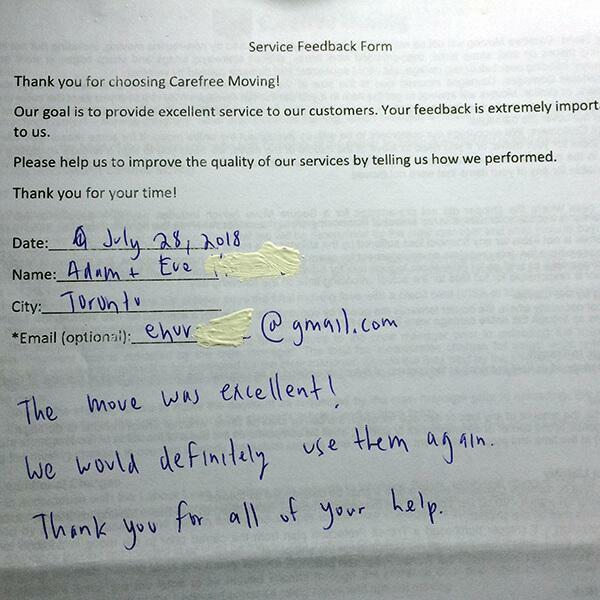 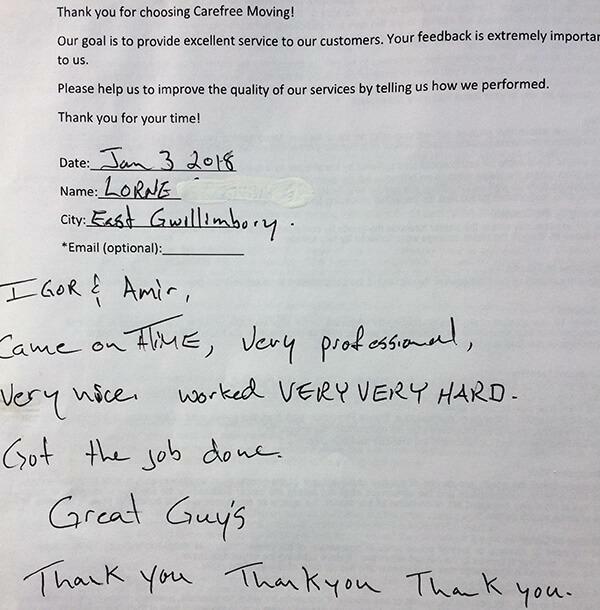 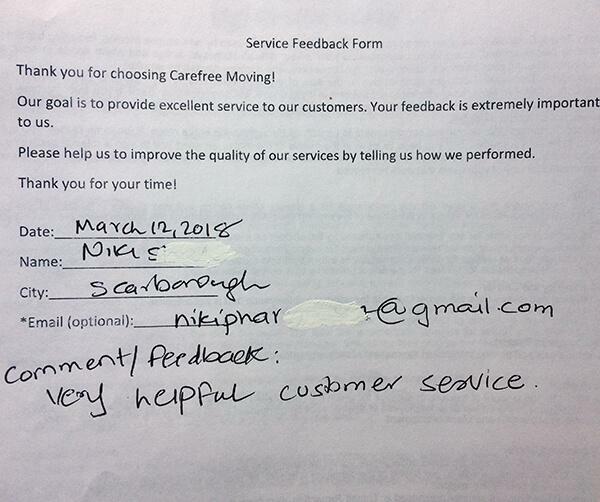 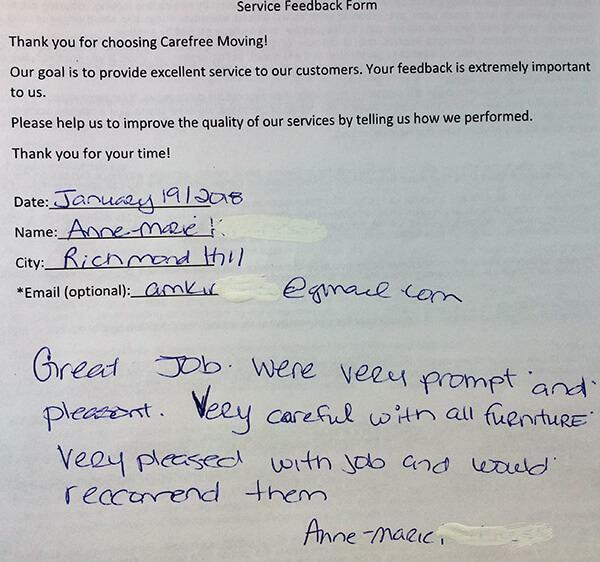 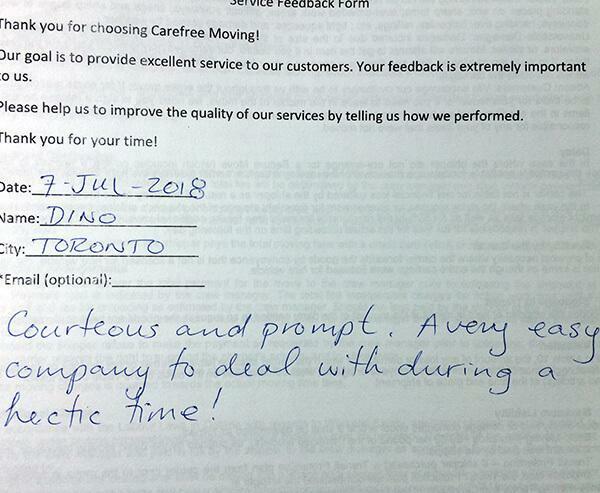 Carefree Moving is a Toronto Moving Company, which specializes in all types of moving services: Residential Moving, Office Moving and Long Distance Moving. 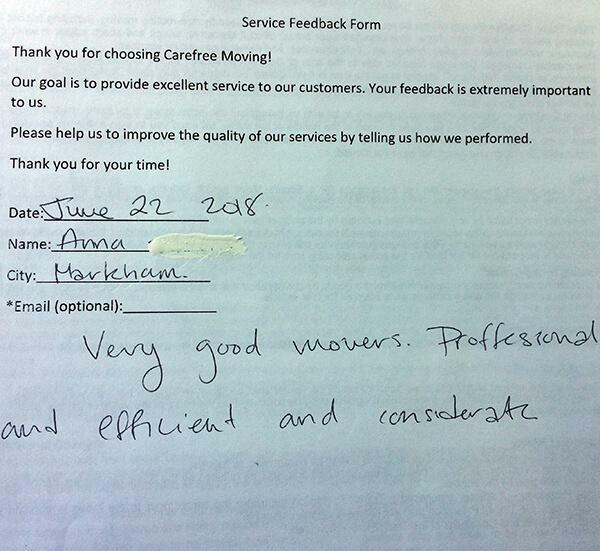 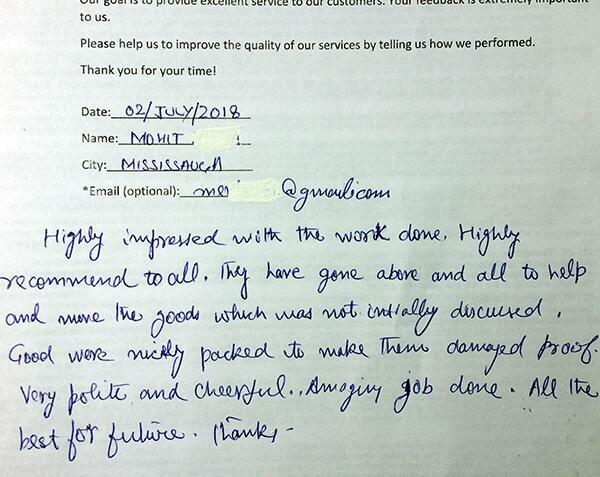 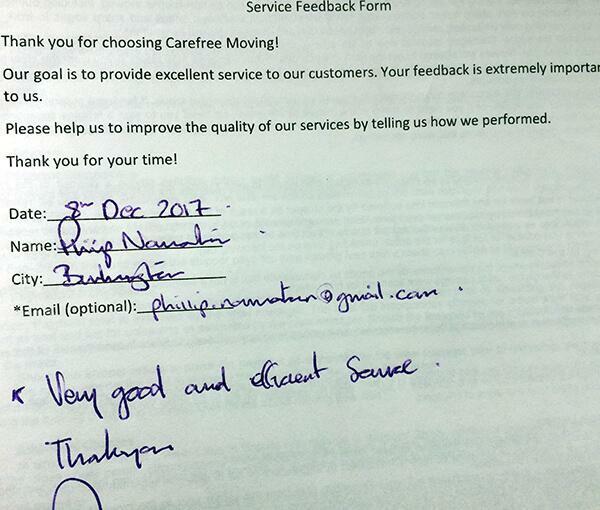 We have successfully worked with thousands of people, offering our clients professional, high quality relocation services for a very affordable price. 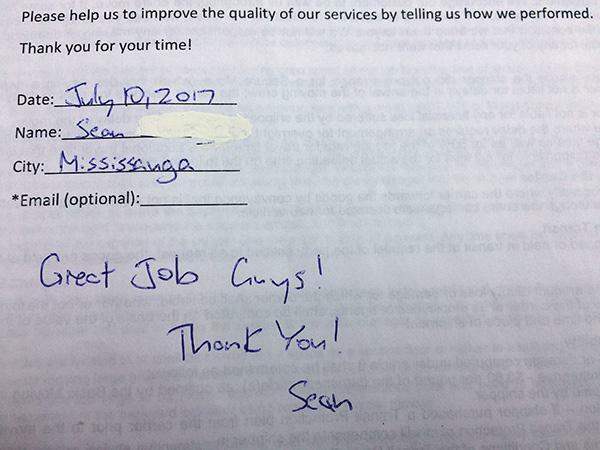 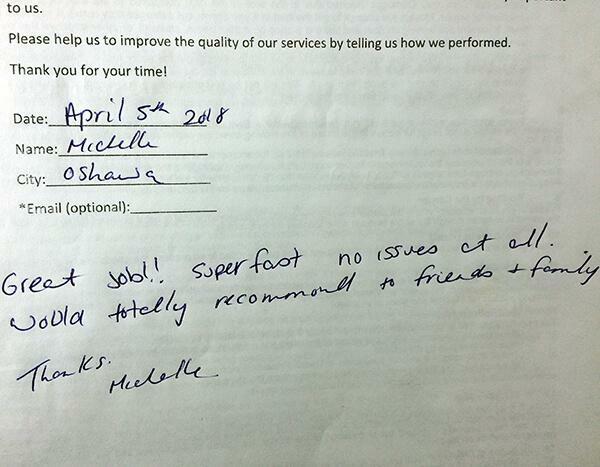 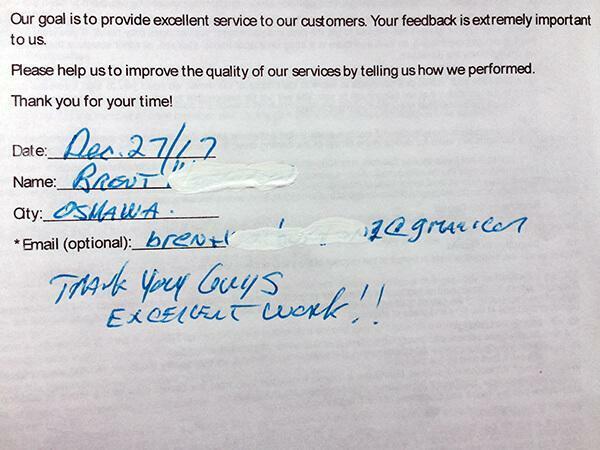 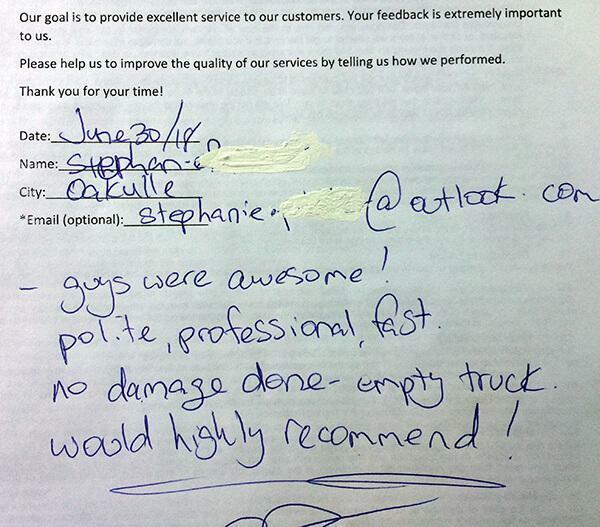 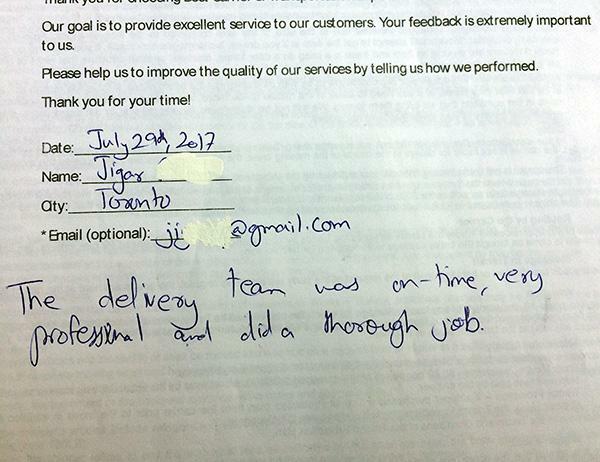 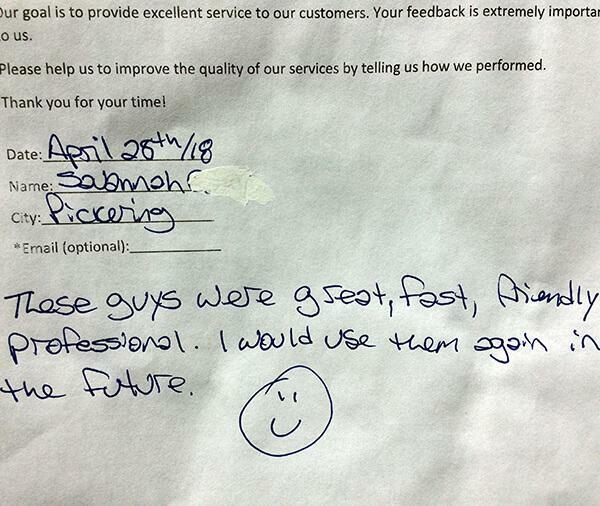 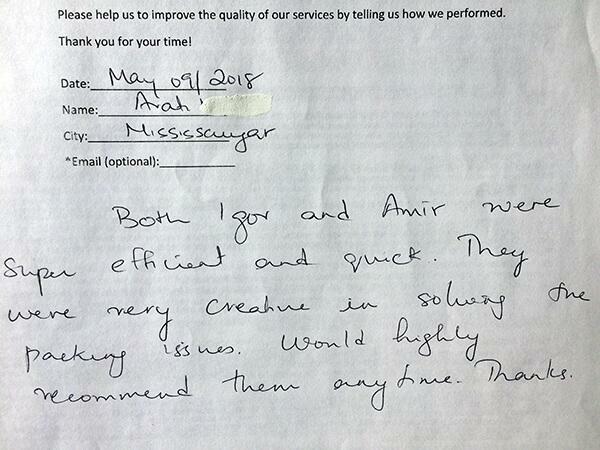 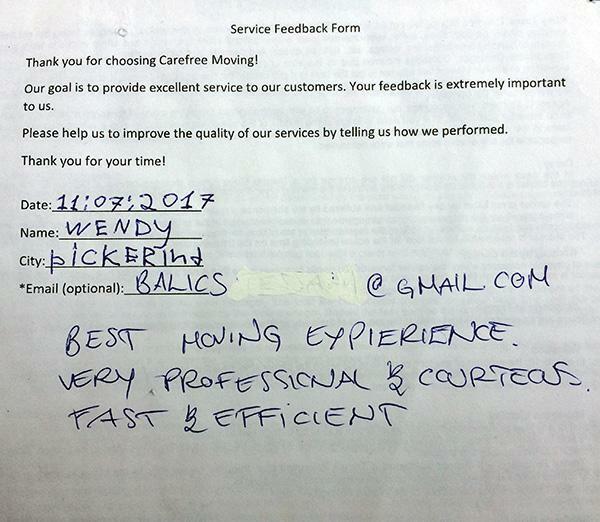 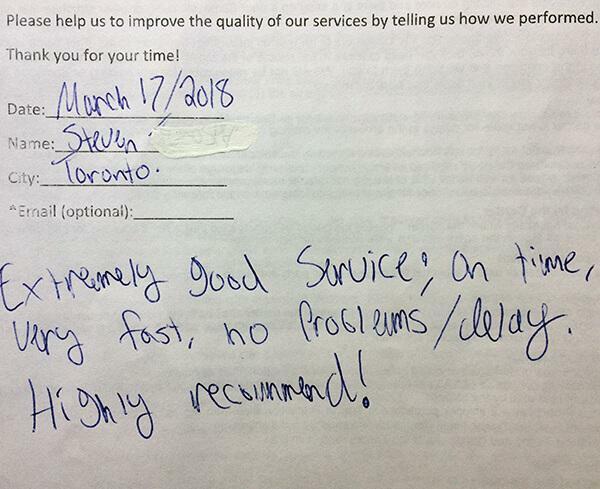 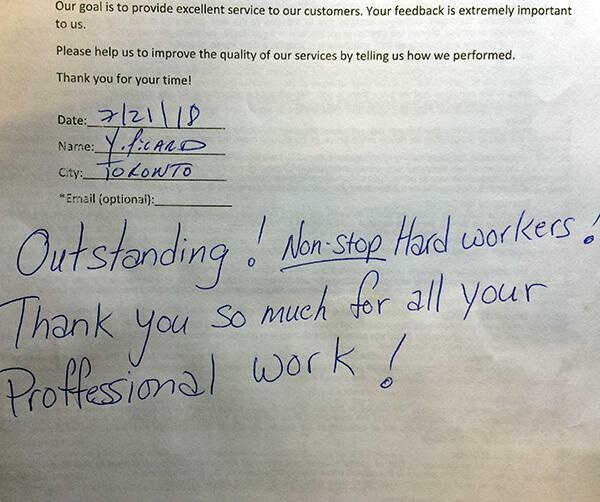 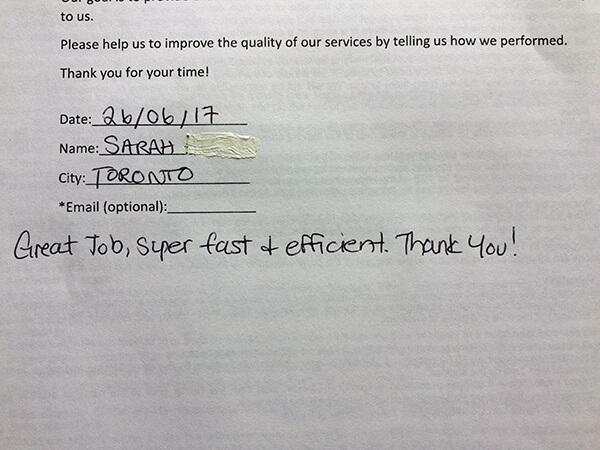 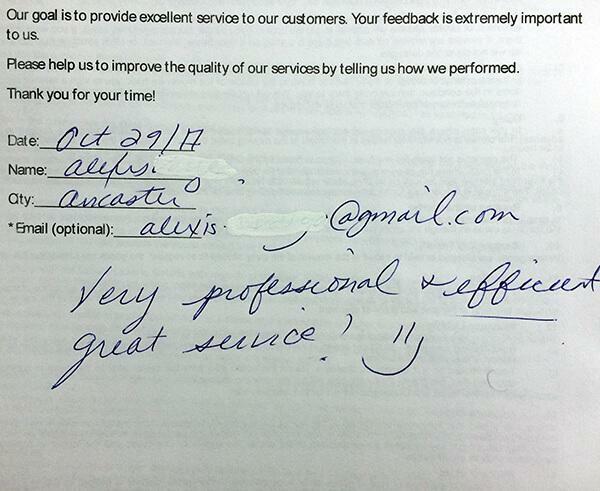 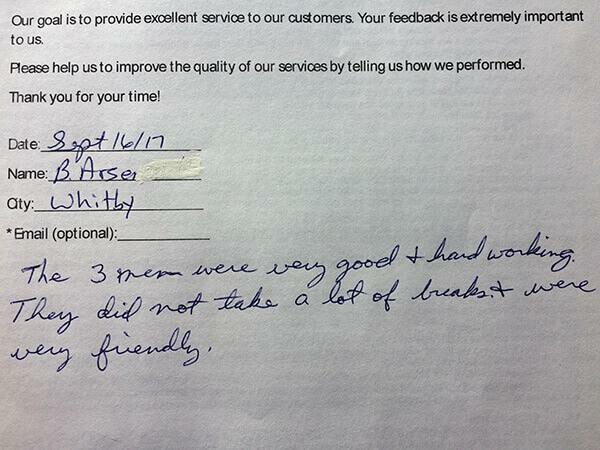 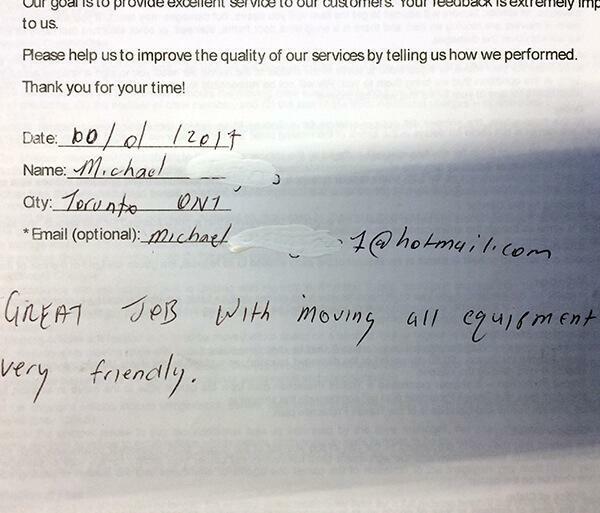 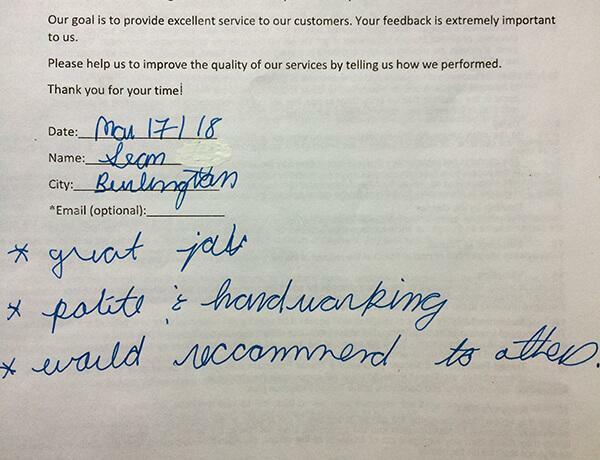 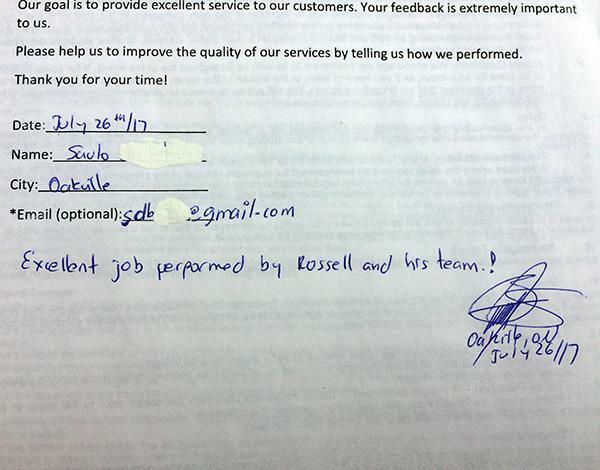 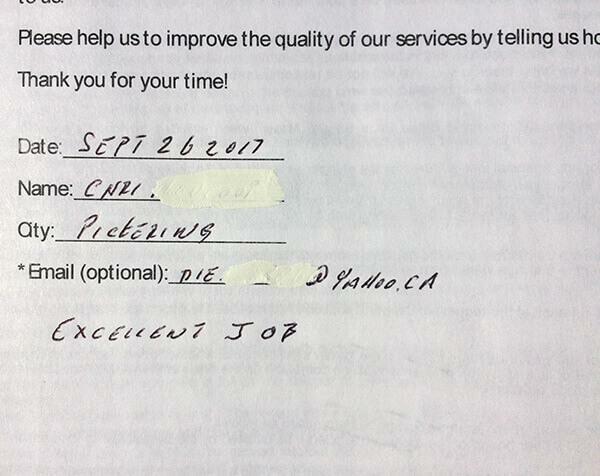 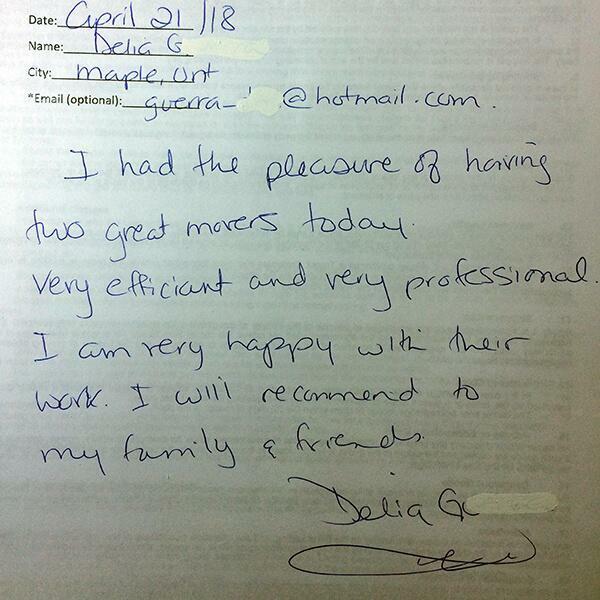 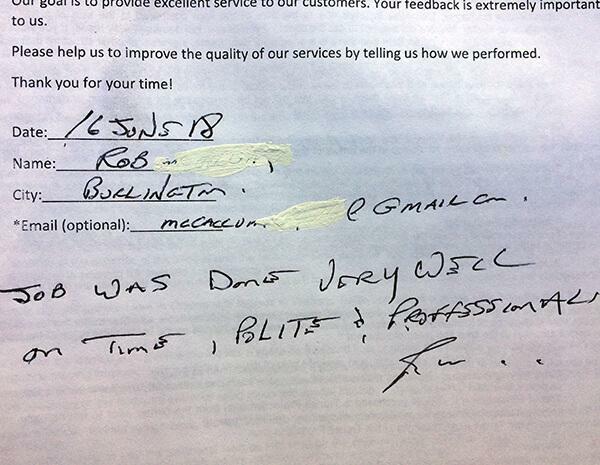 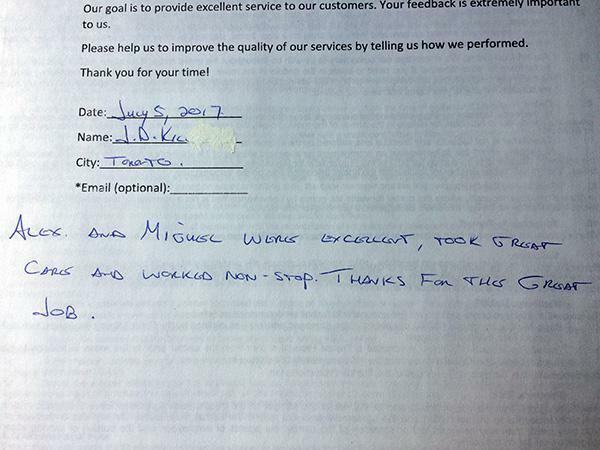 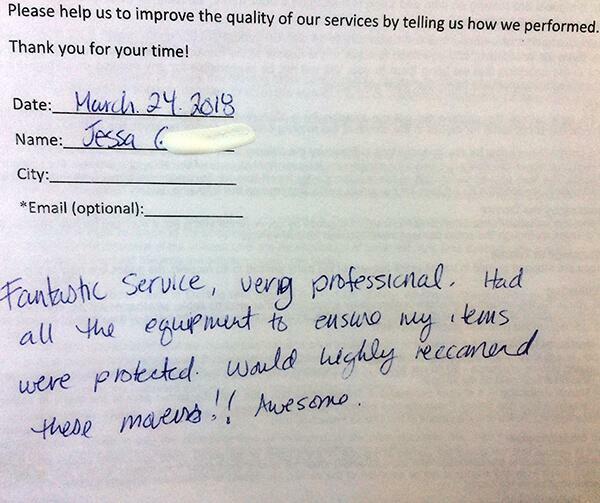 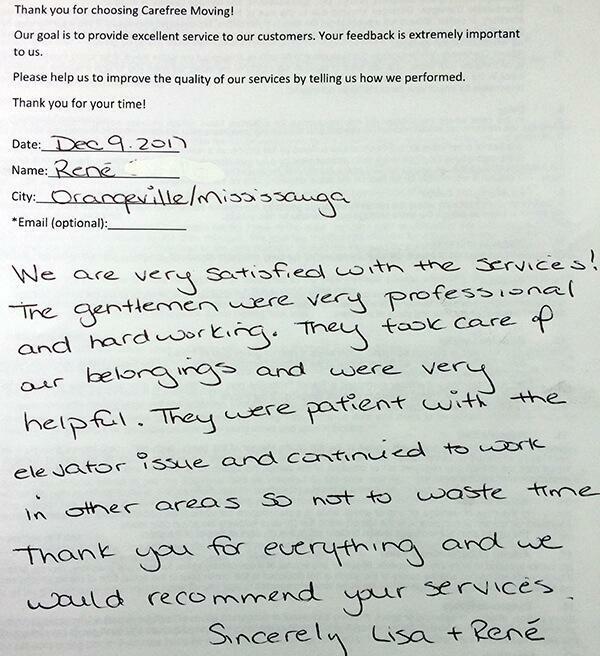 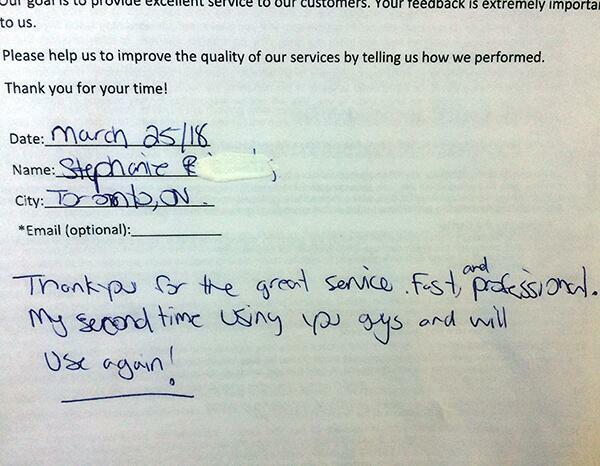 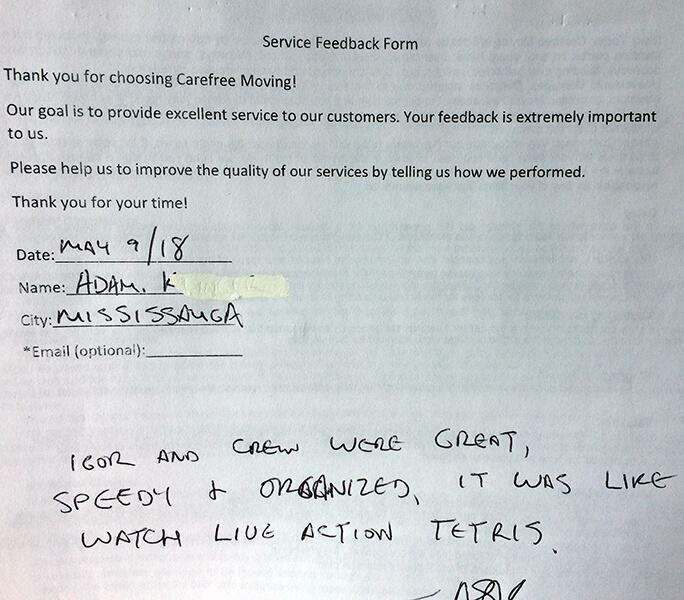 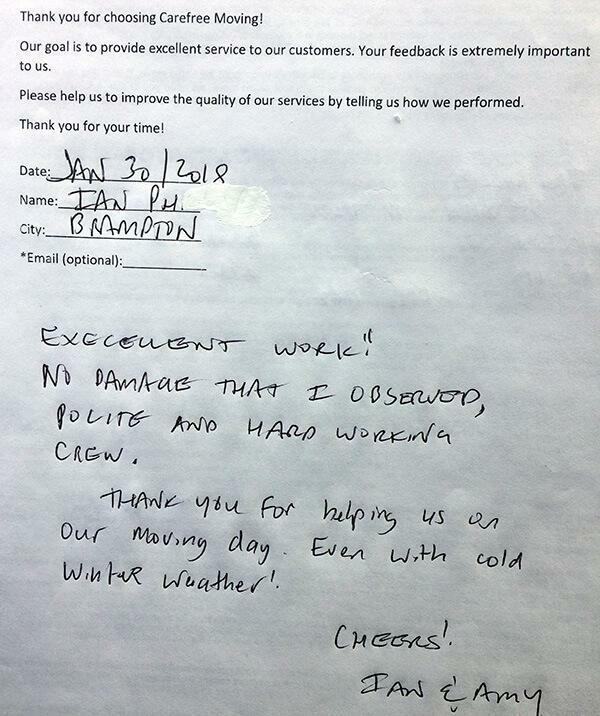 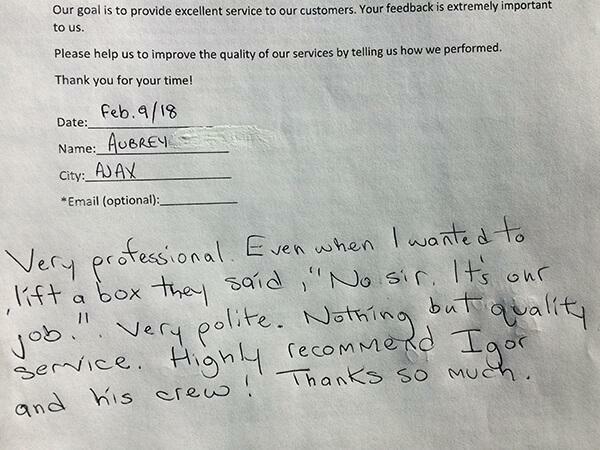 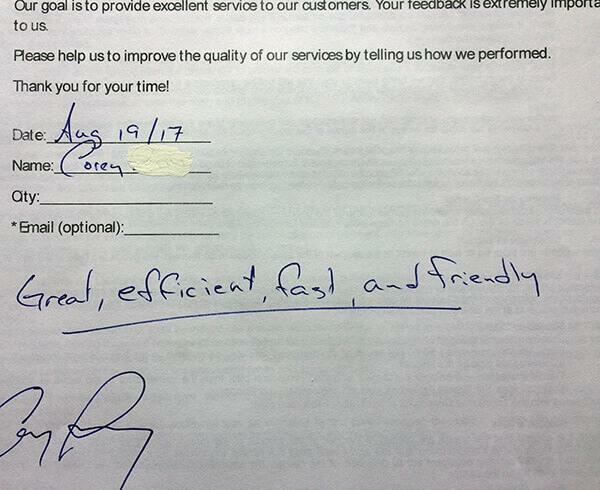 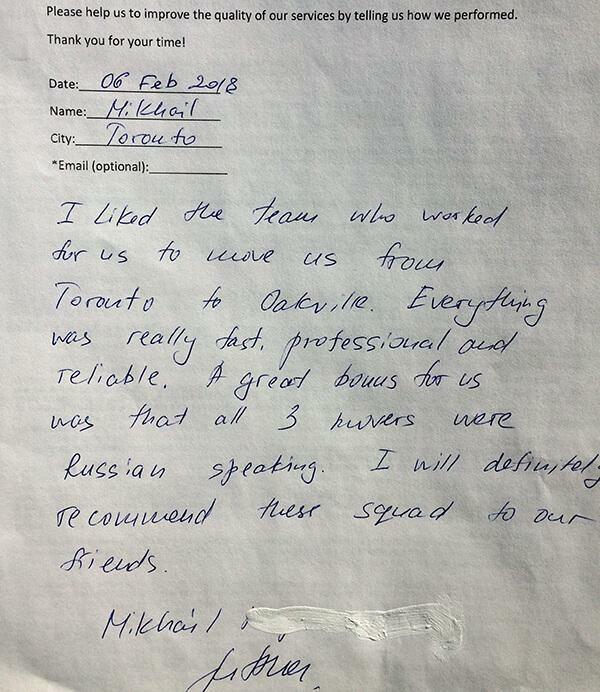 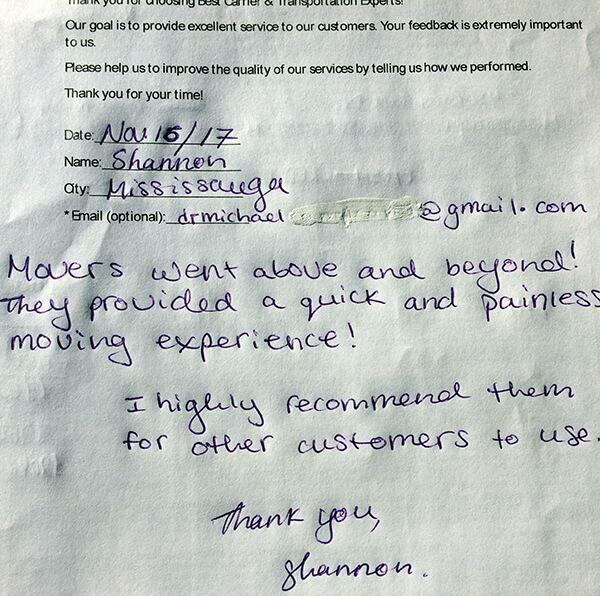 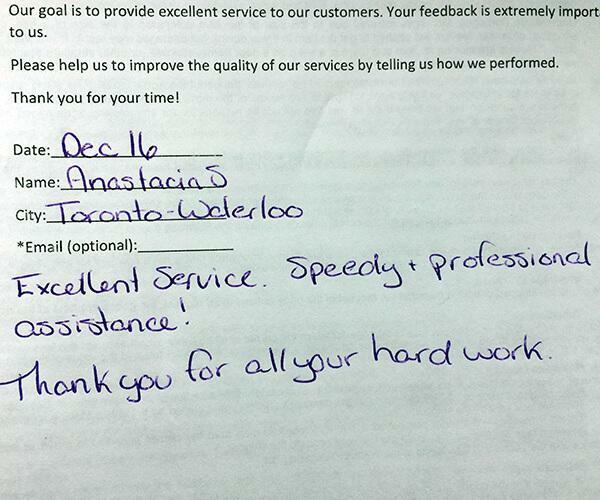 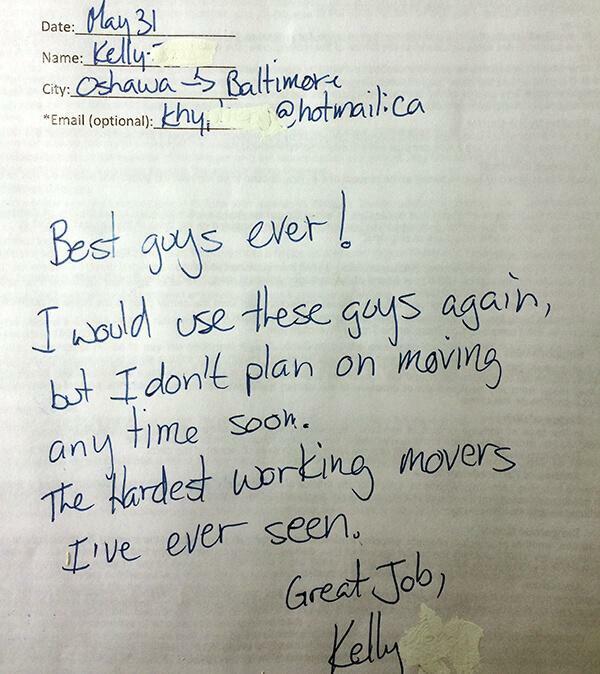 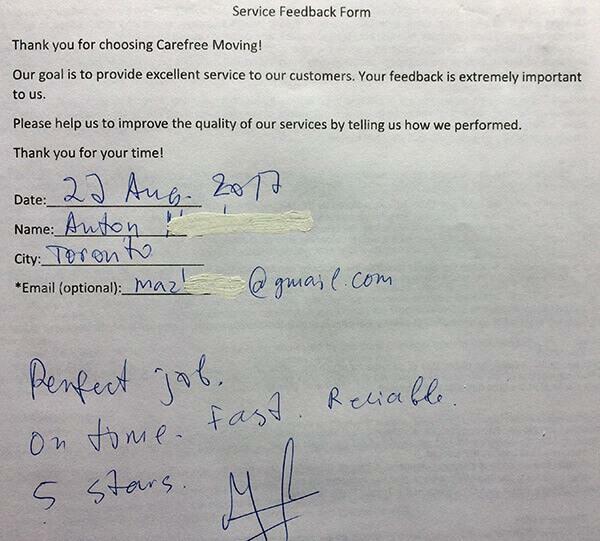 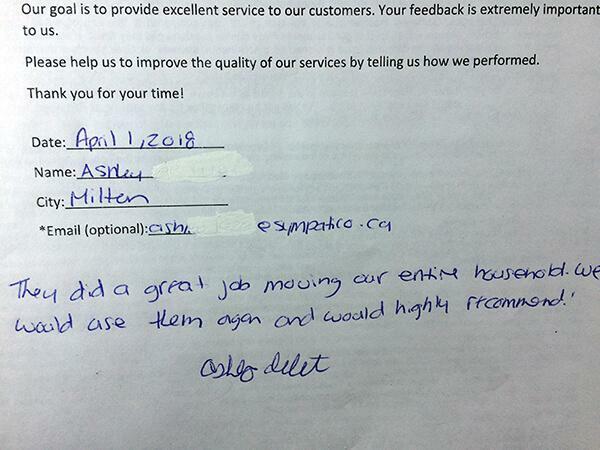 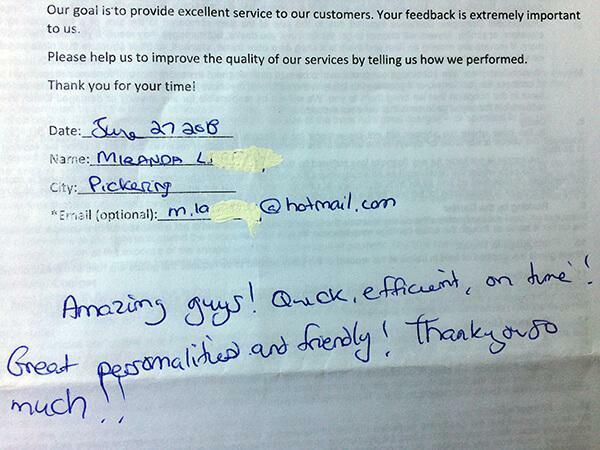 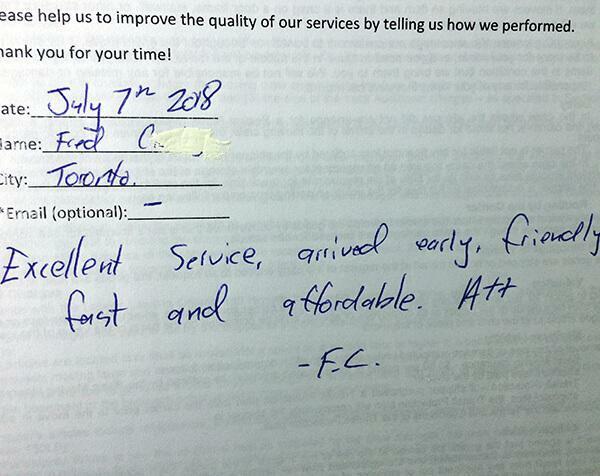 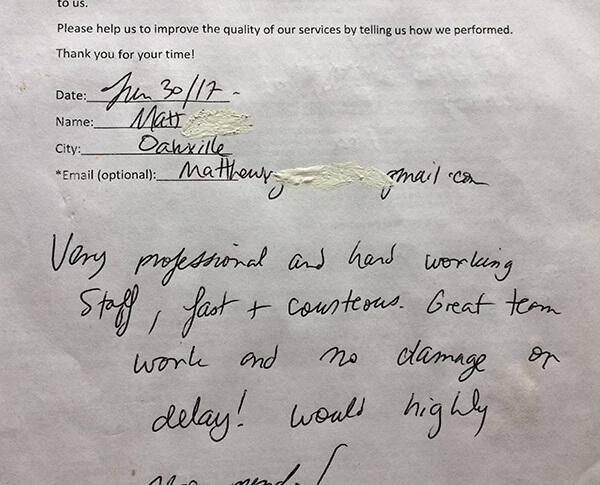 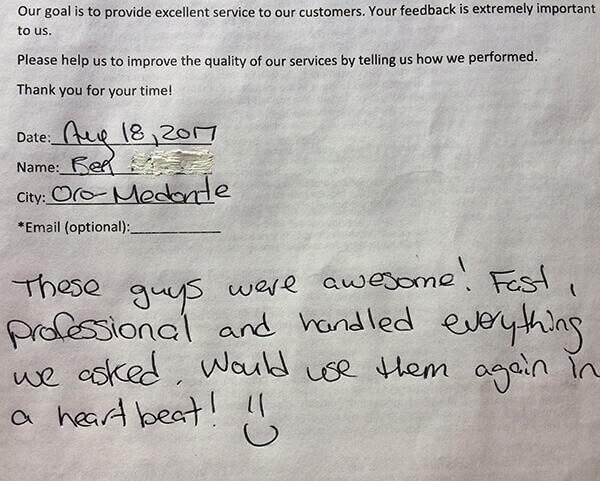 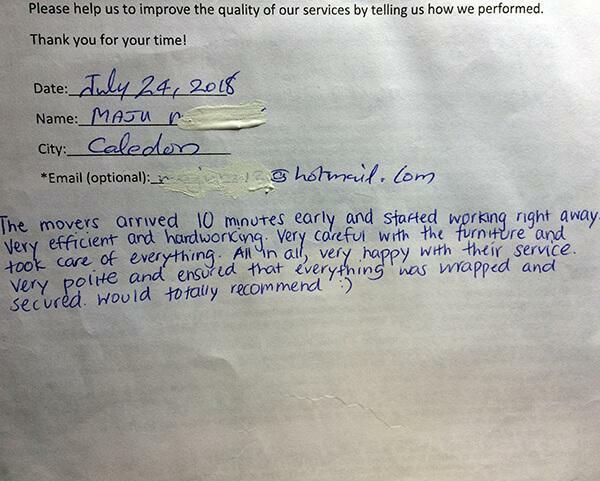 As with most Toronto moving companies we charge a flat hourly rate for labor. 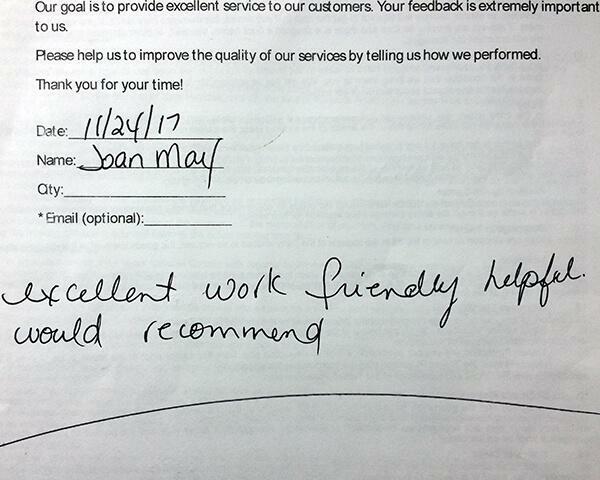 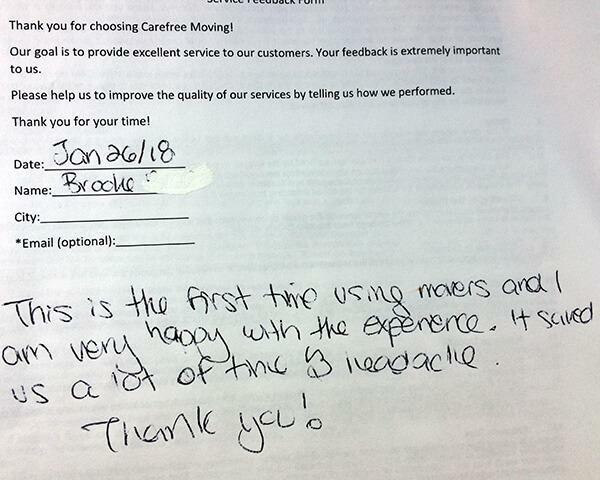 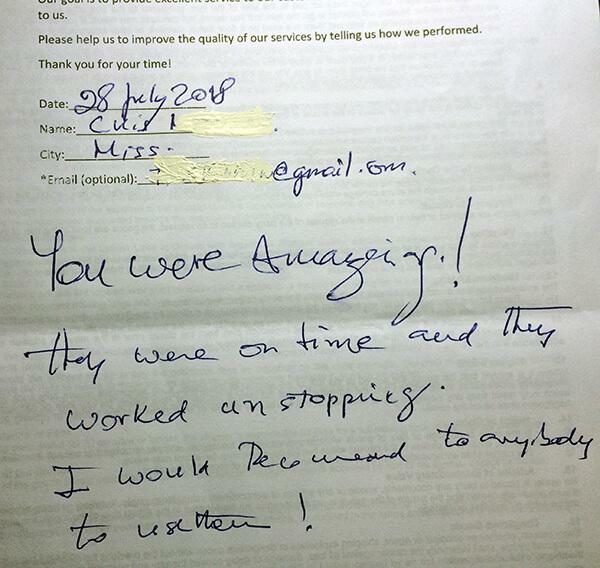 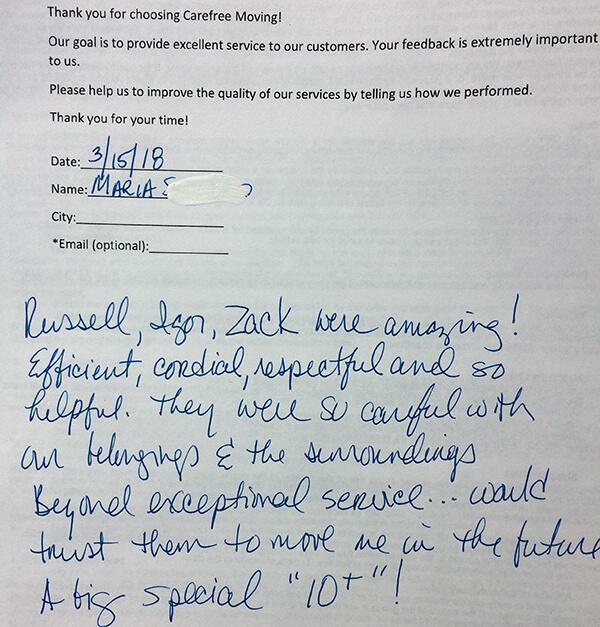 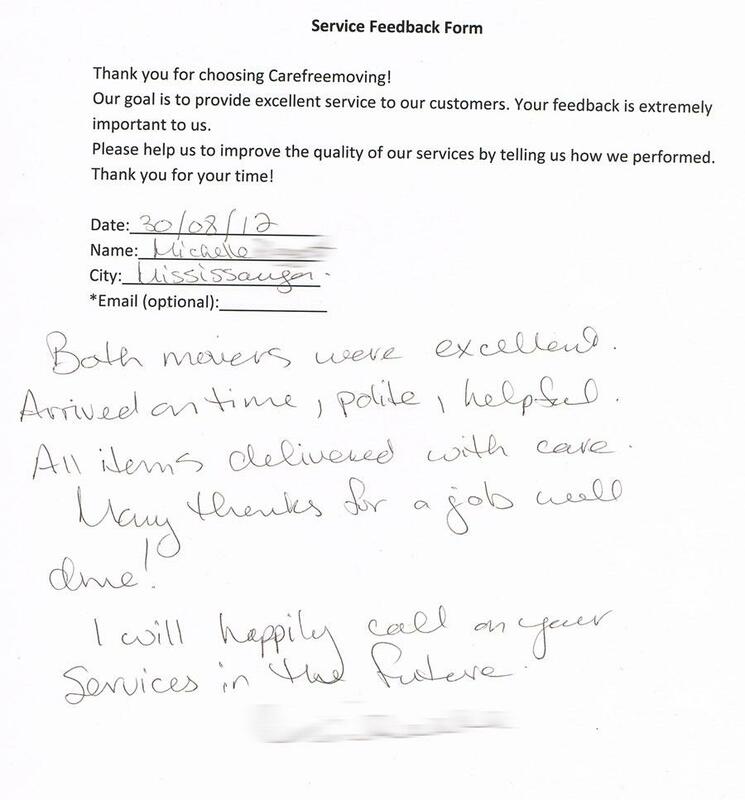 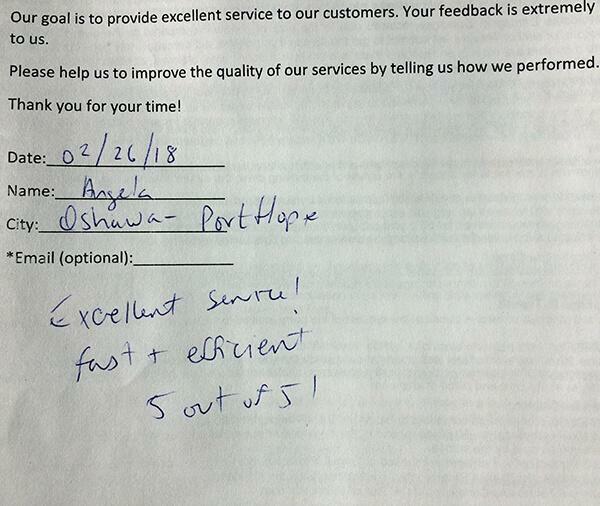 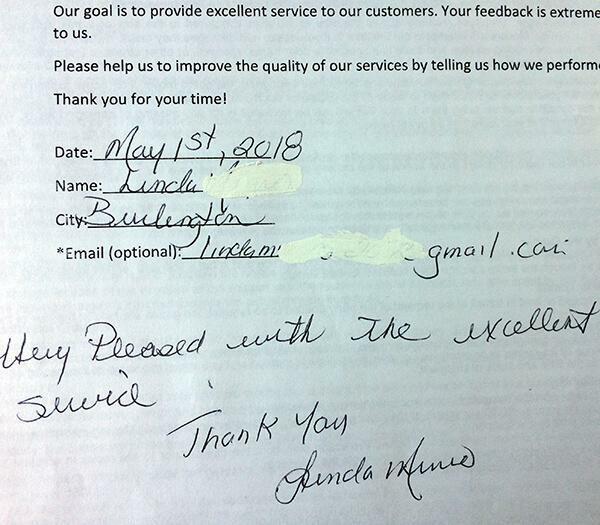 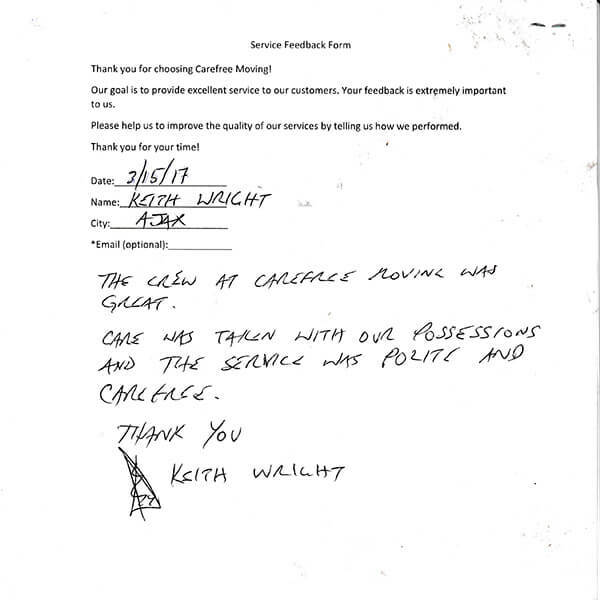 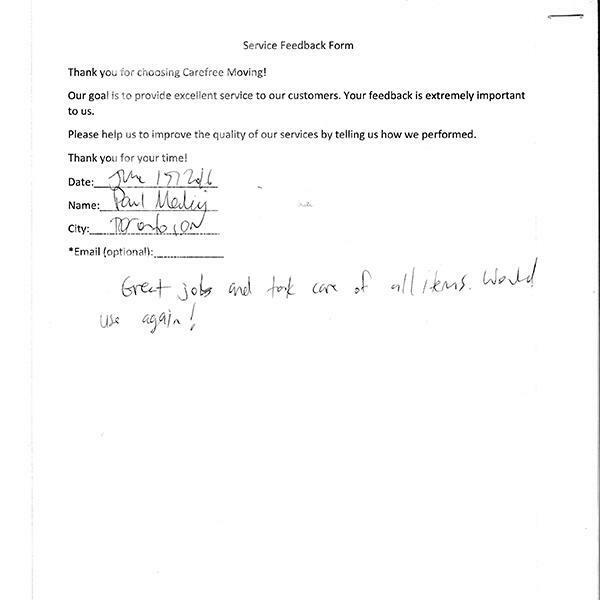 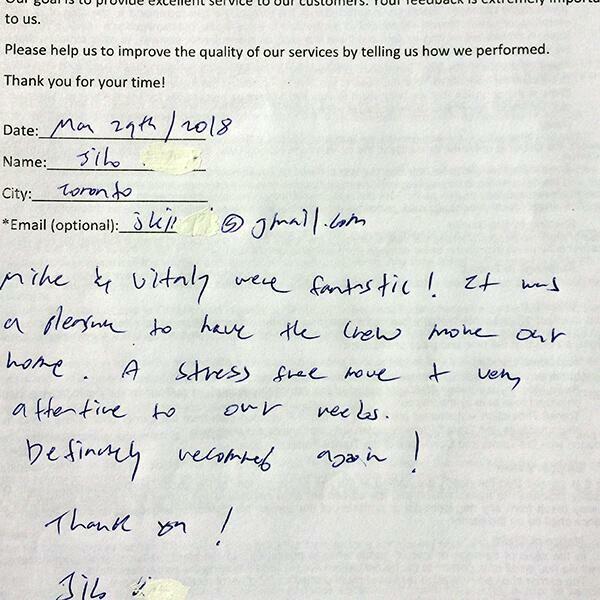 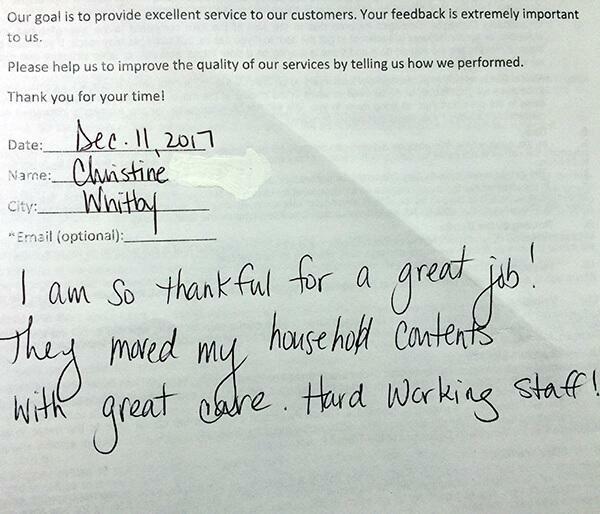 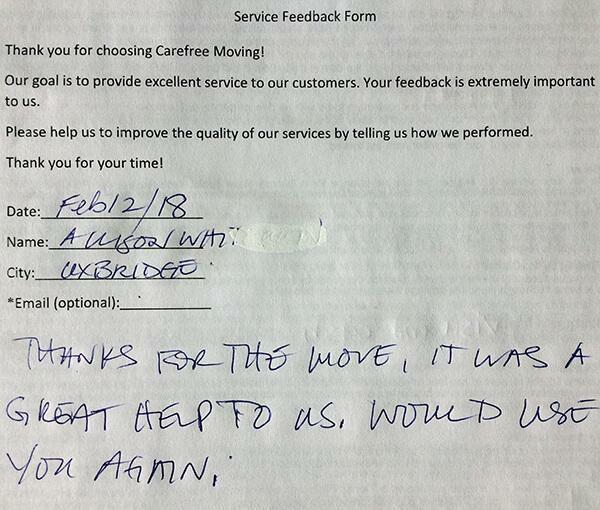 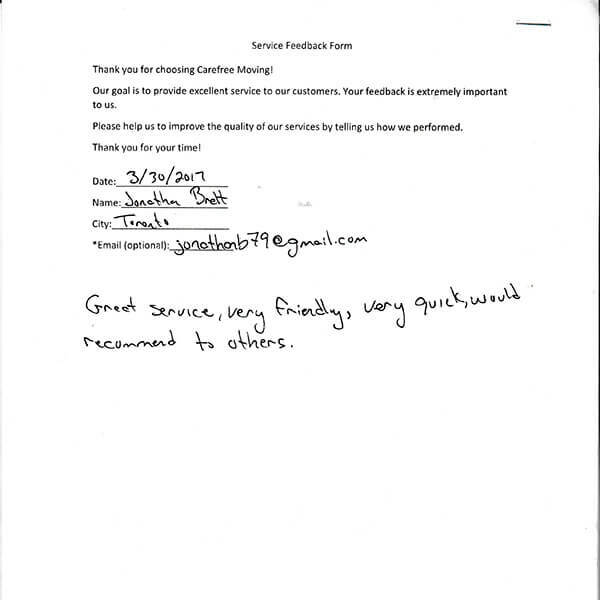 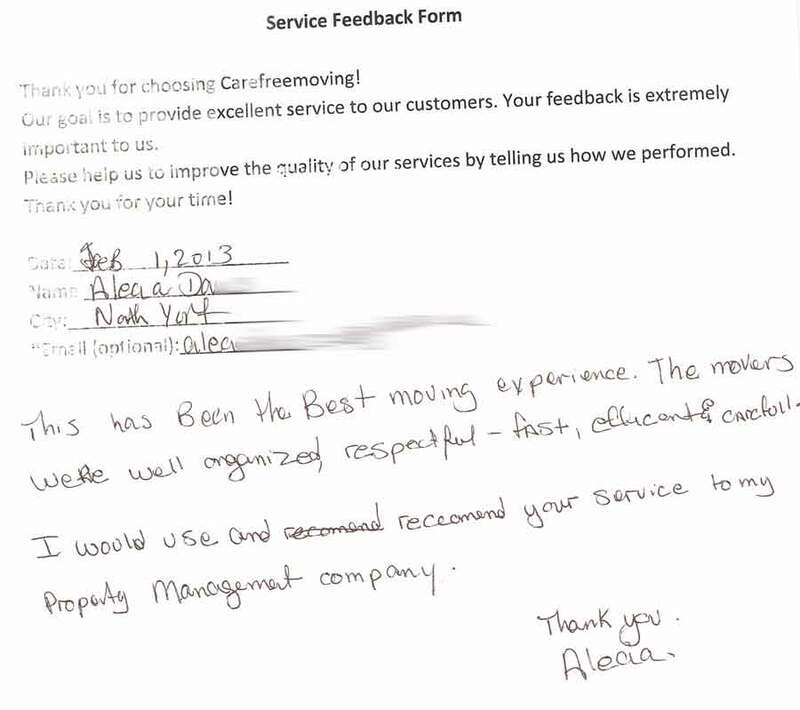 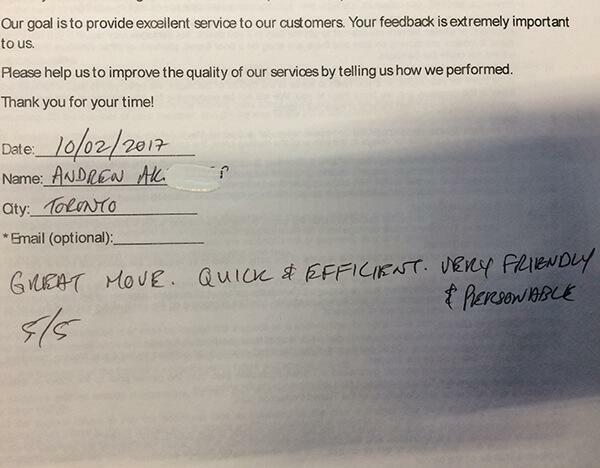 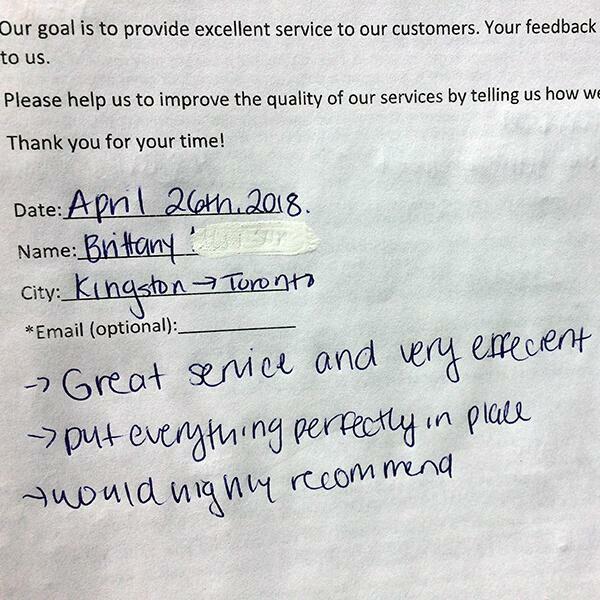 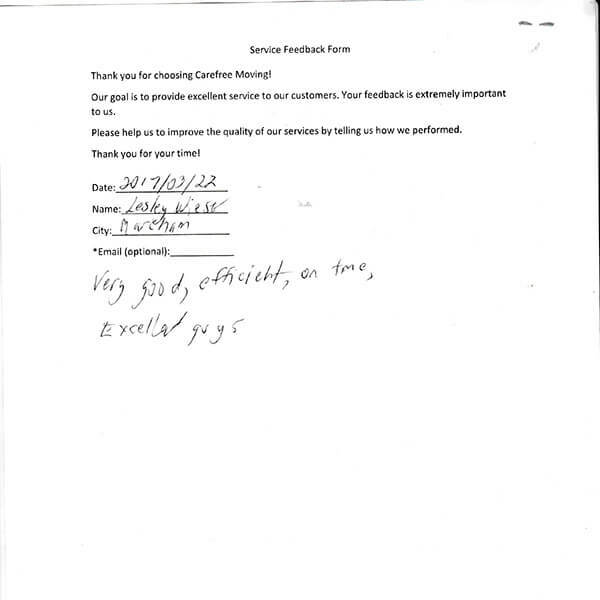 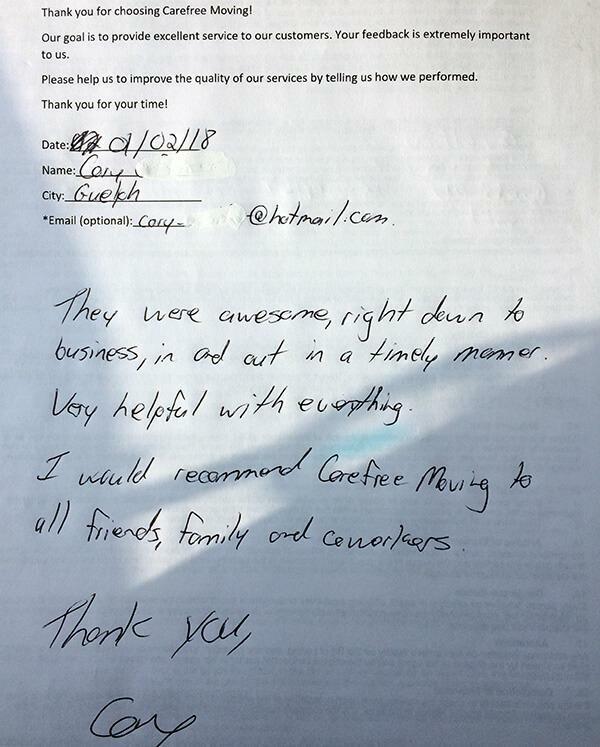 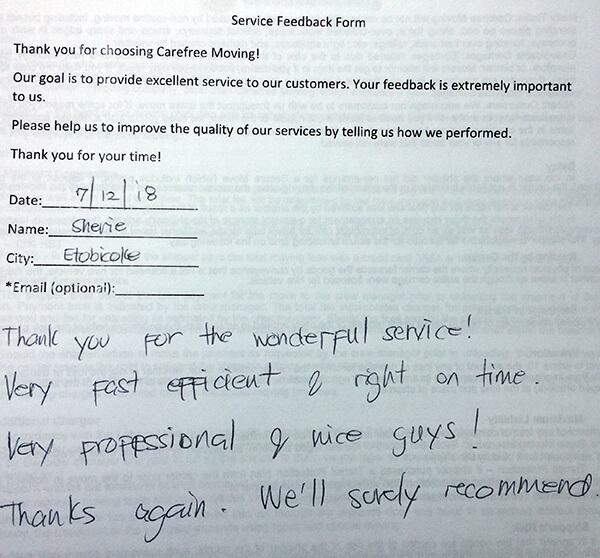 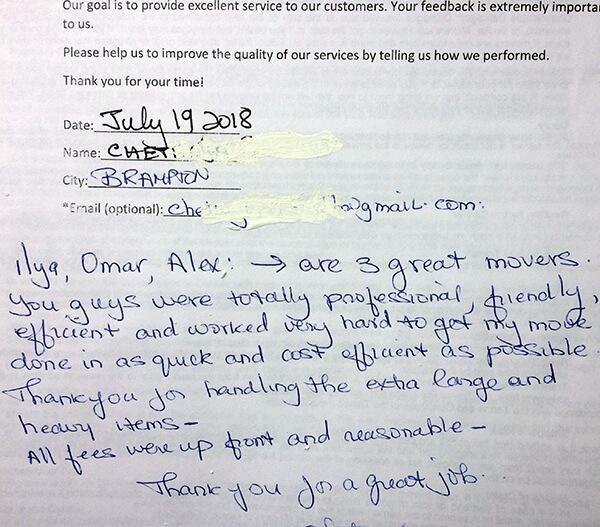 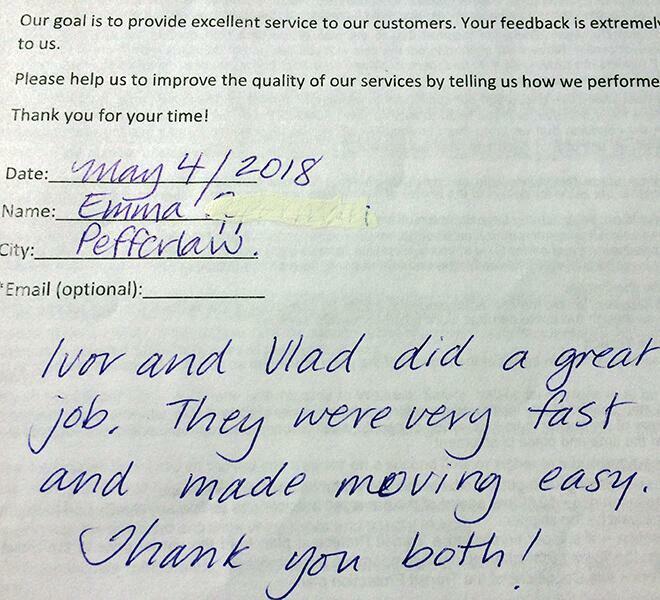 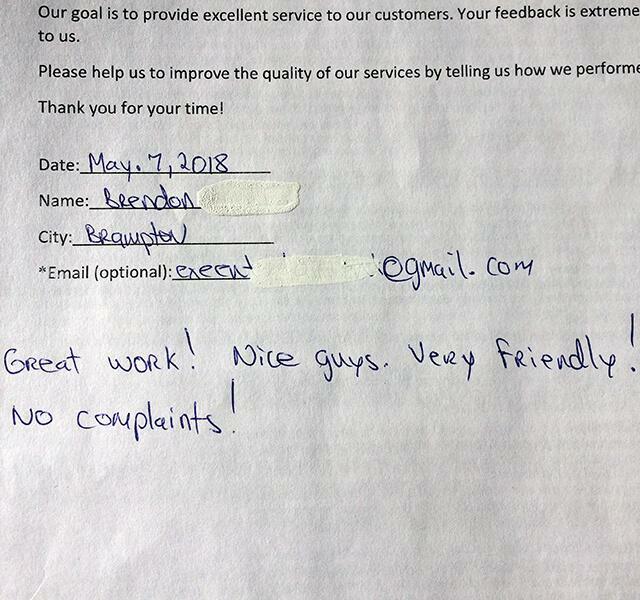 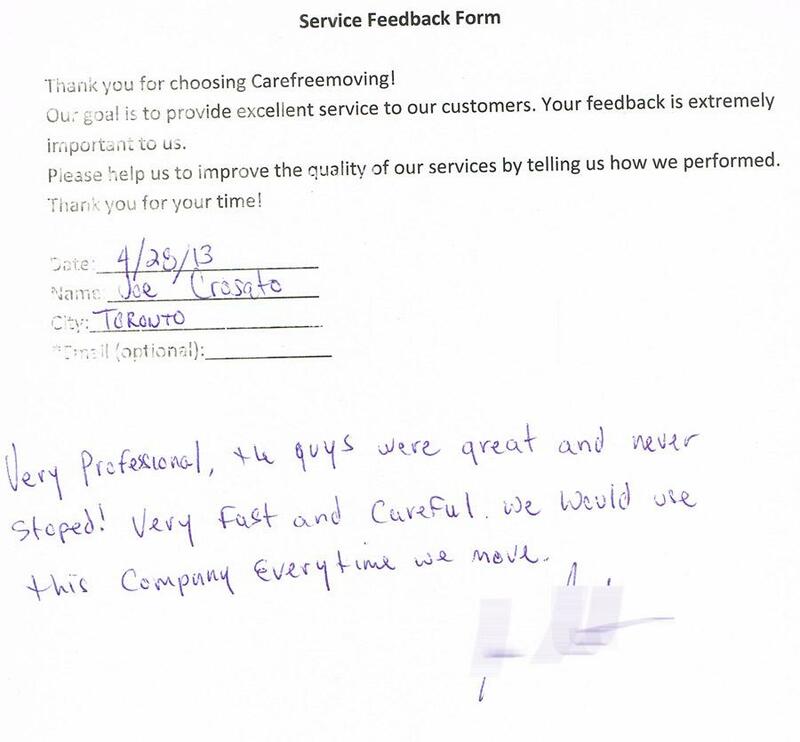 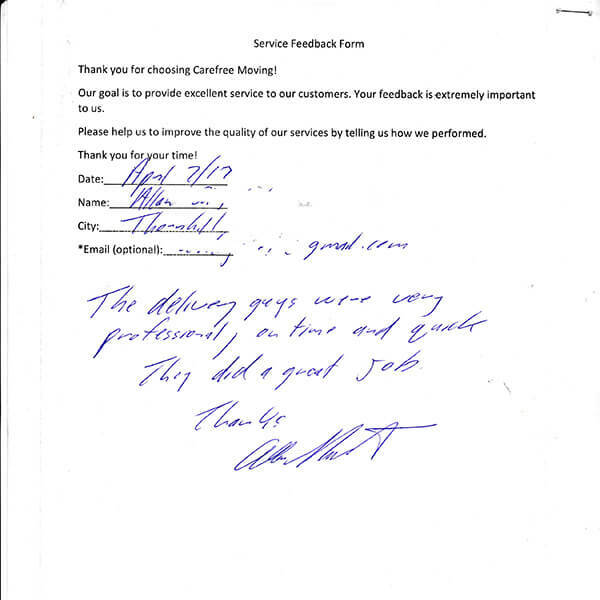 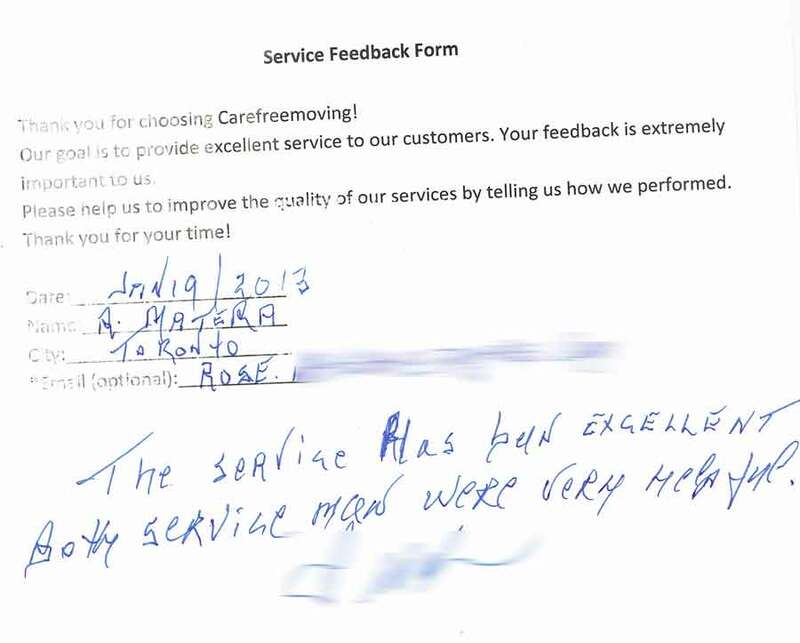 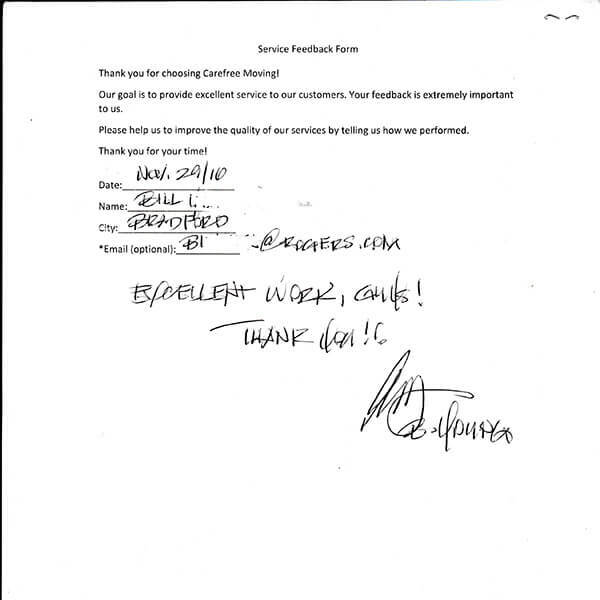 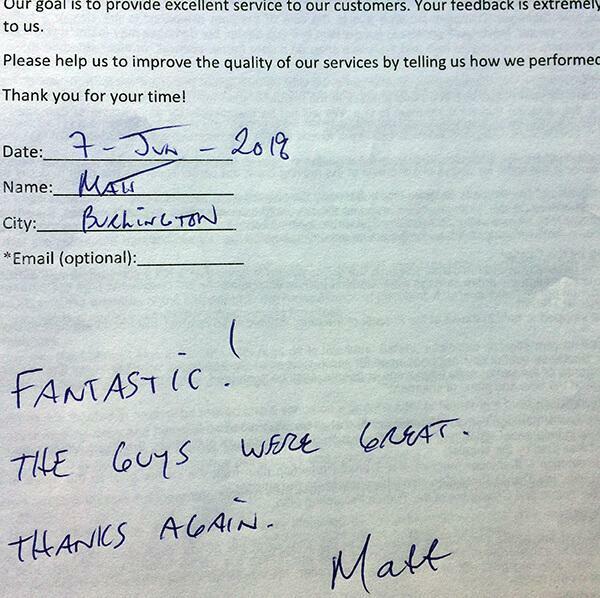 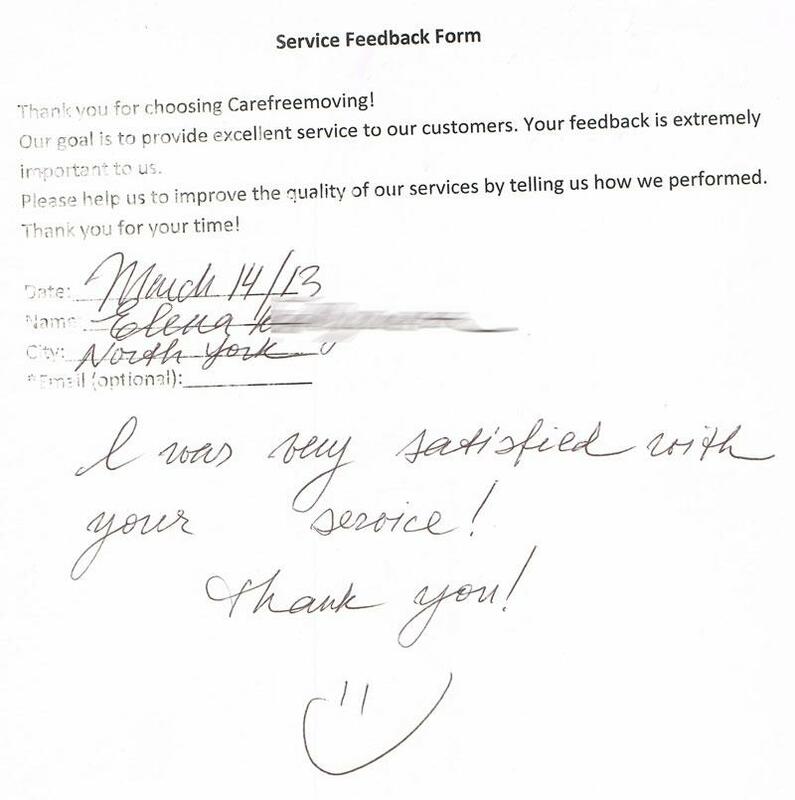 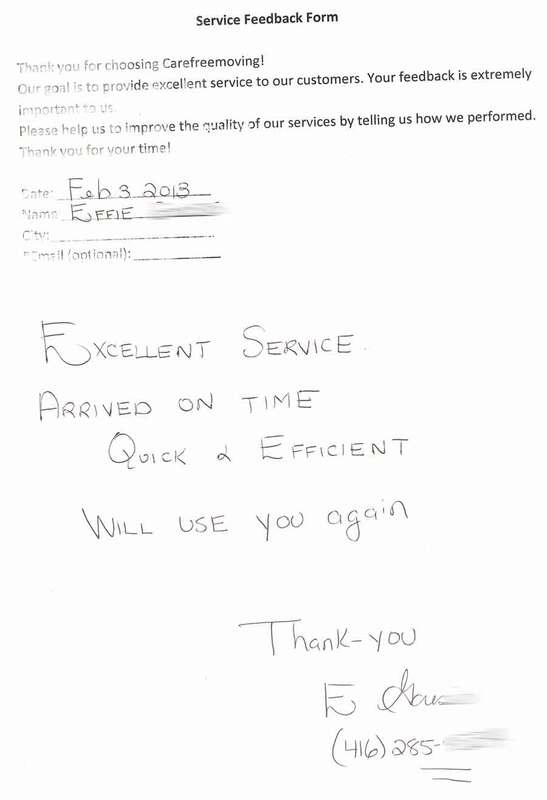 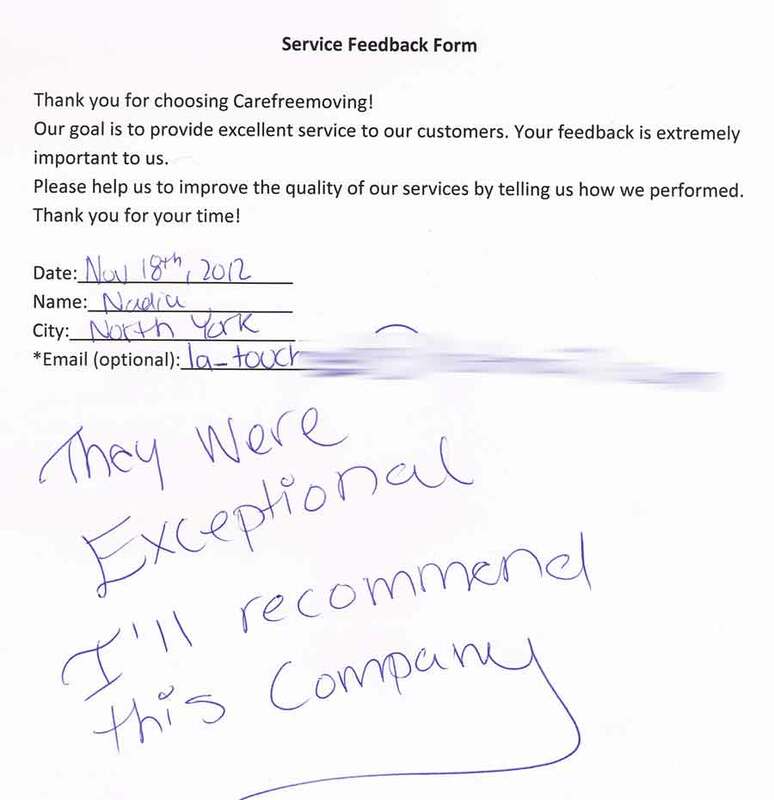 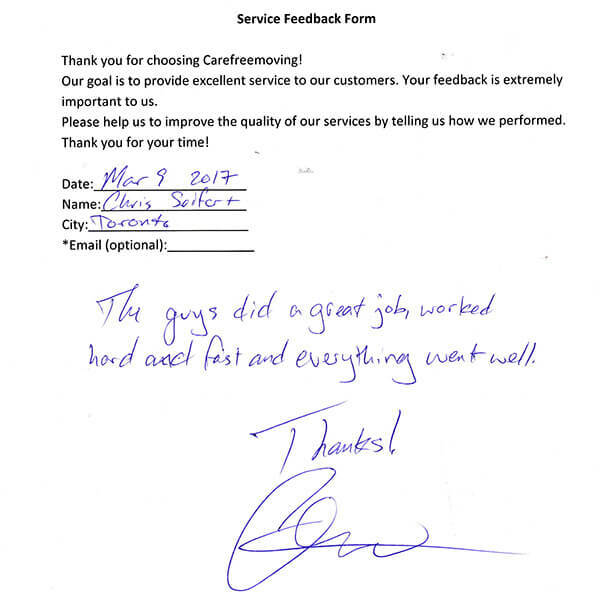 Our moving rates are competitive with other local and long distance movers and we are not used to surprise our clients with unexpected charges, that weren't discussed prior to the agreement. 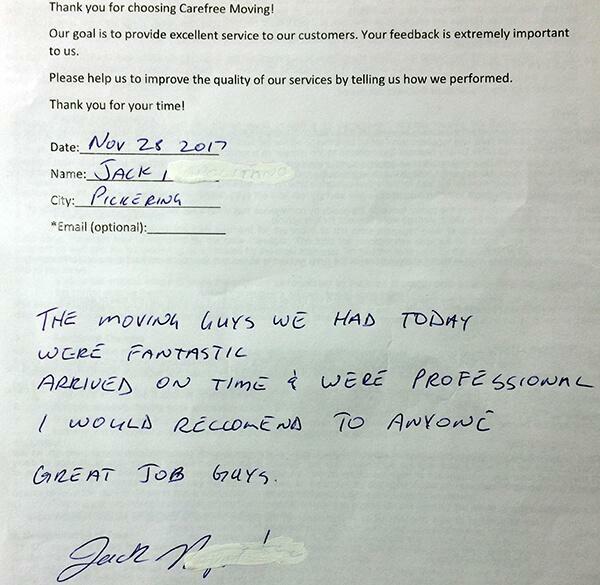 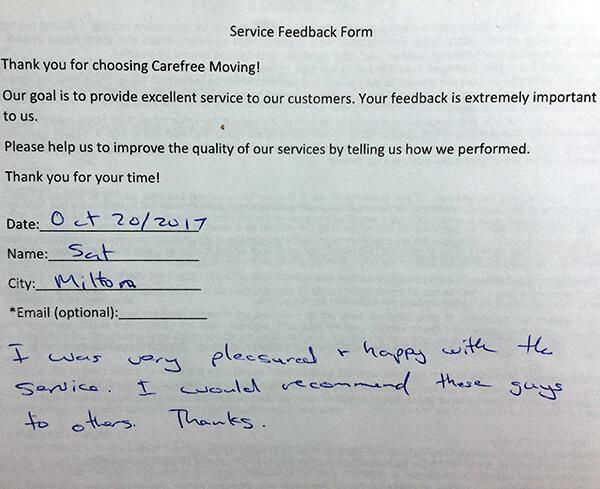 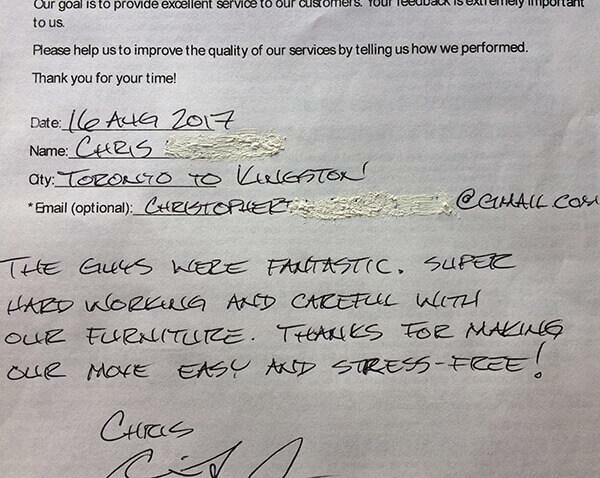 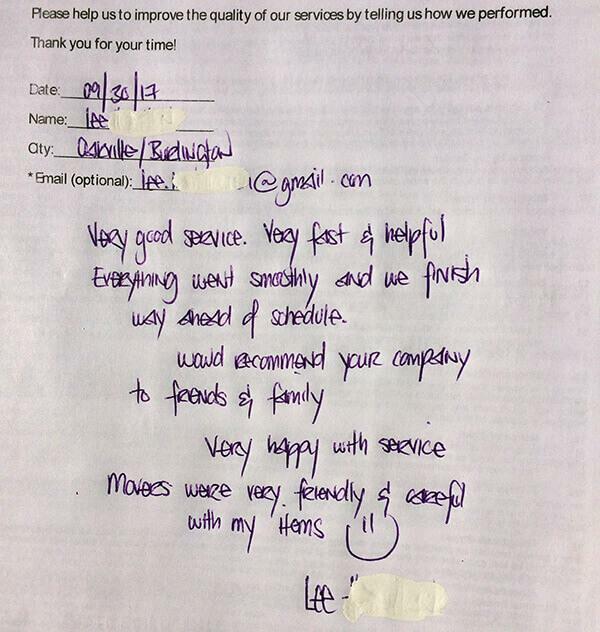 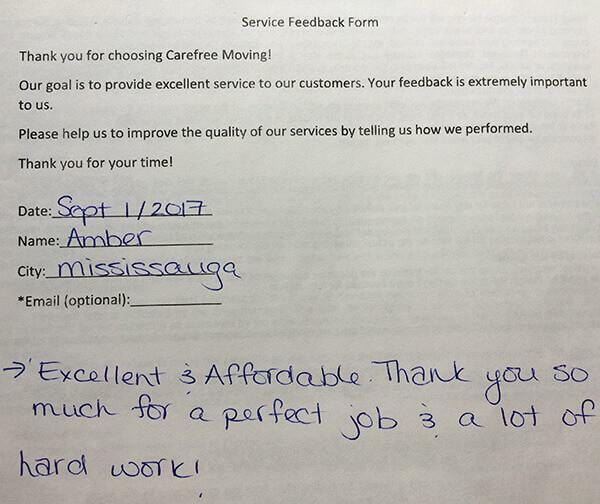 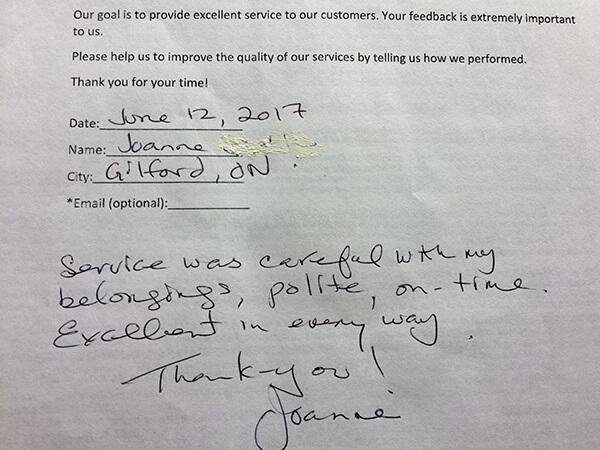 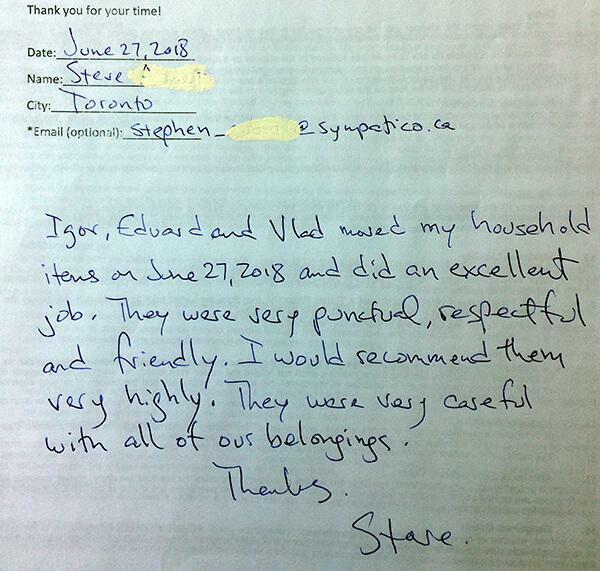 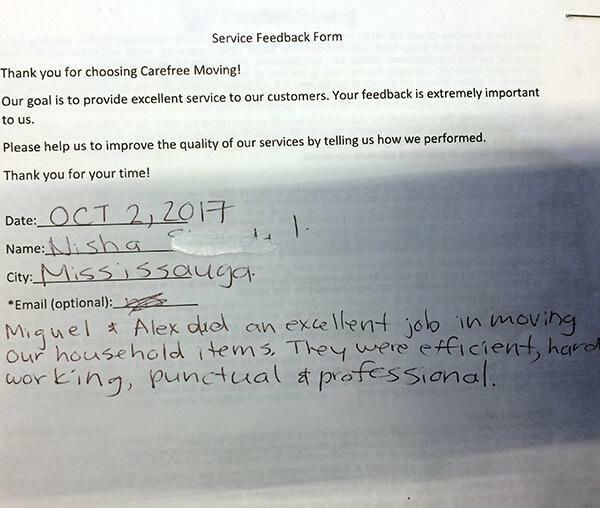 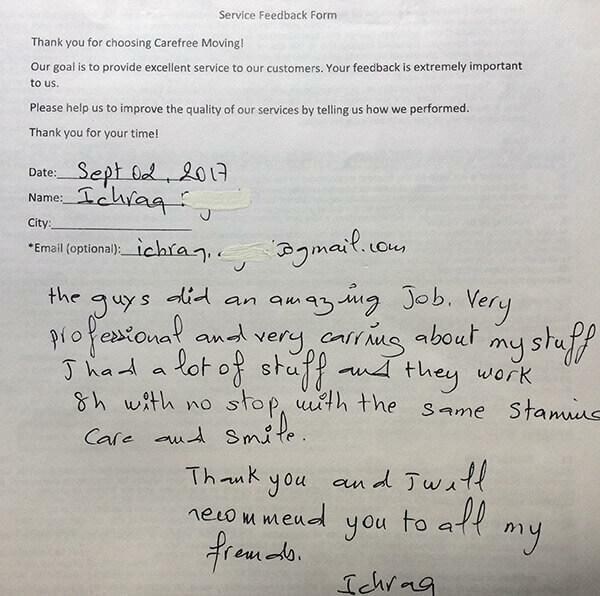 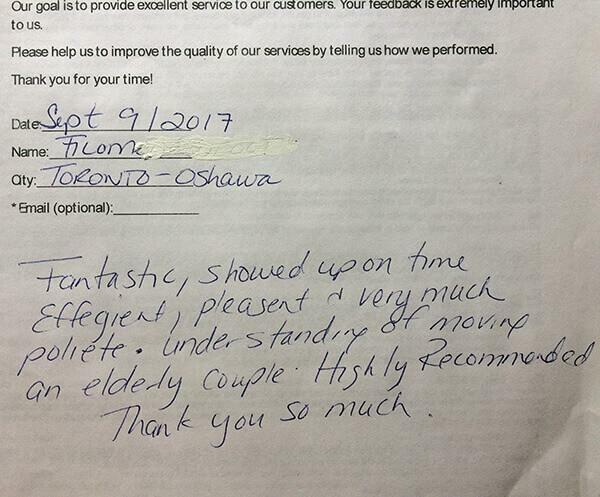 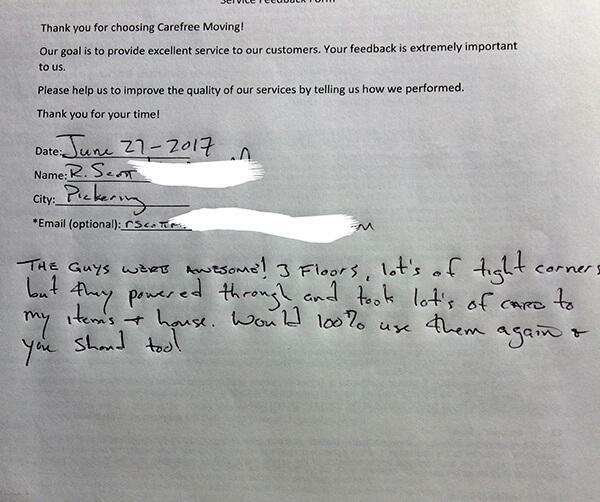 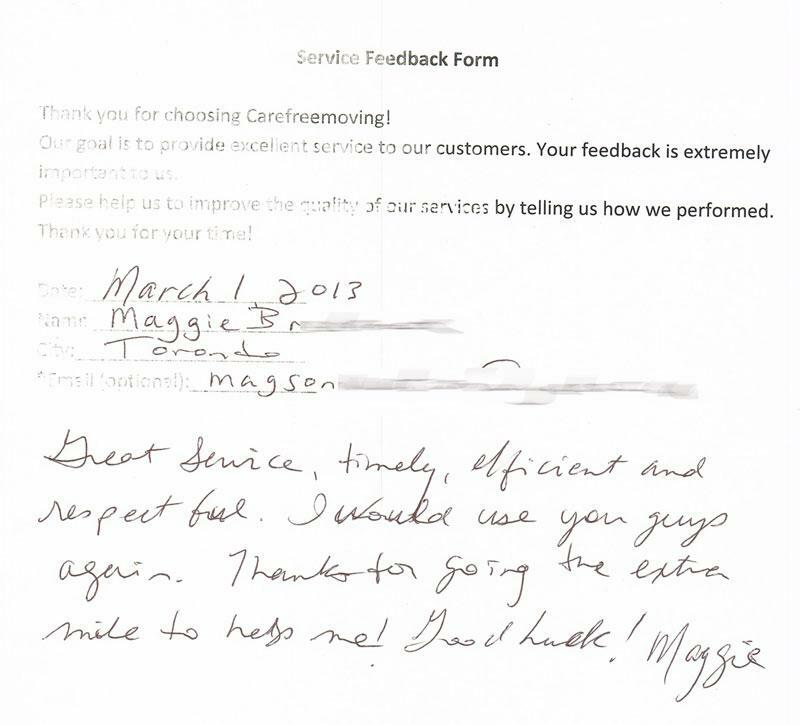 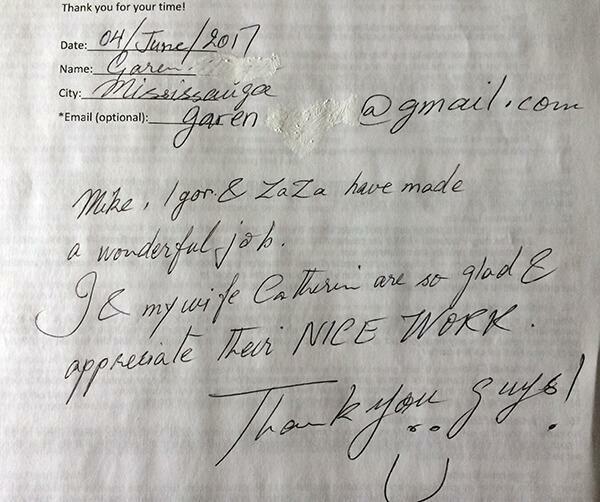 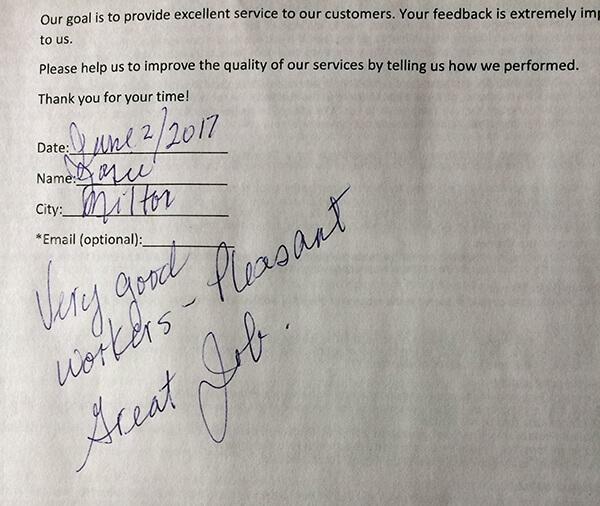 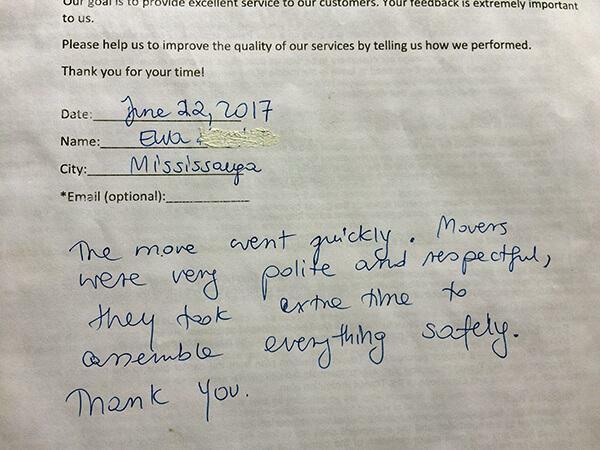 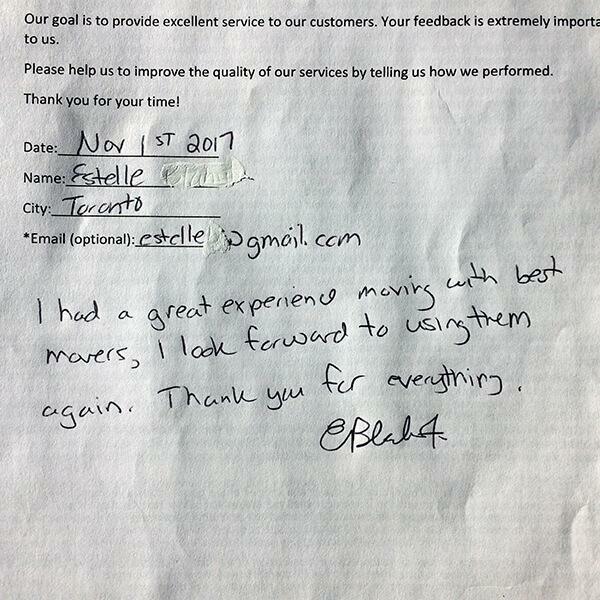 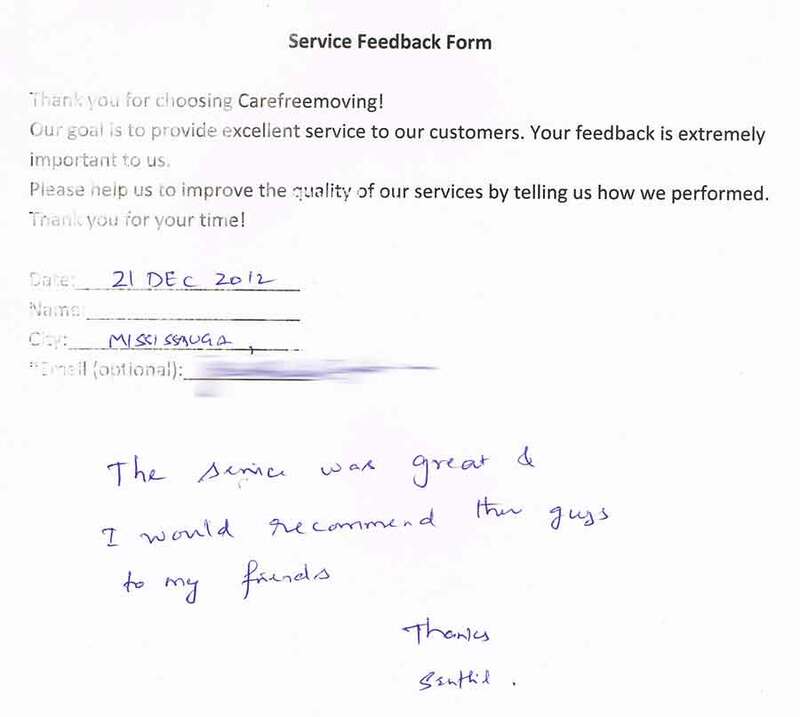 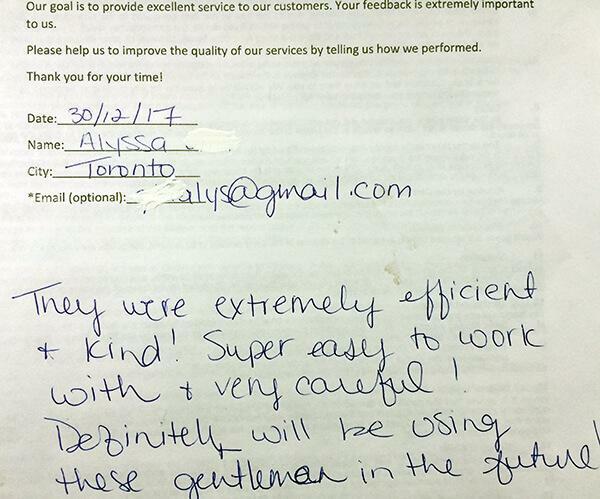 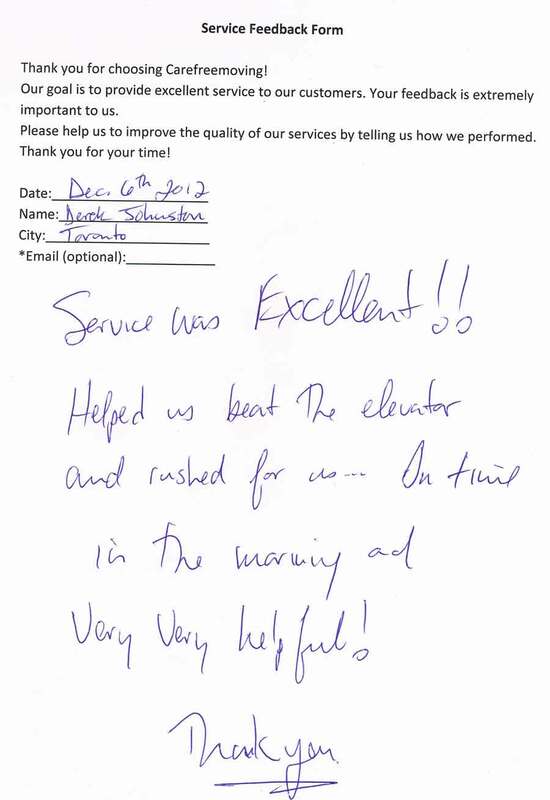 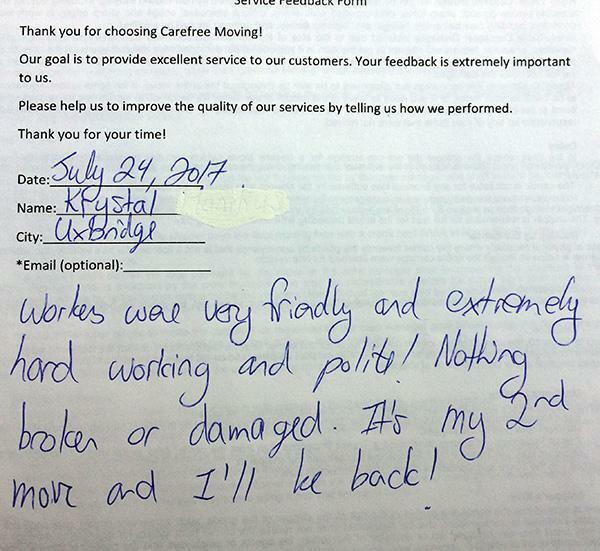 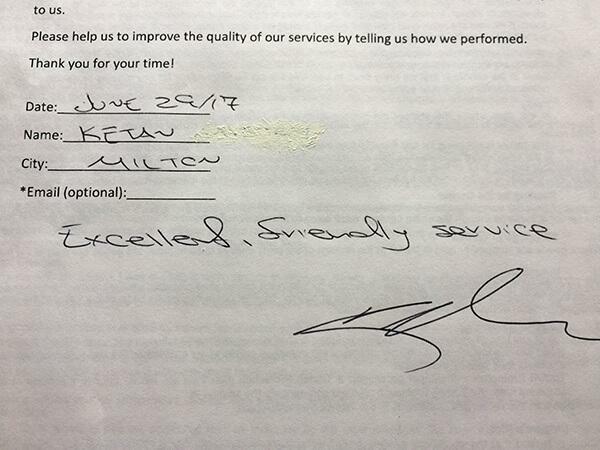 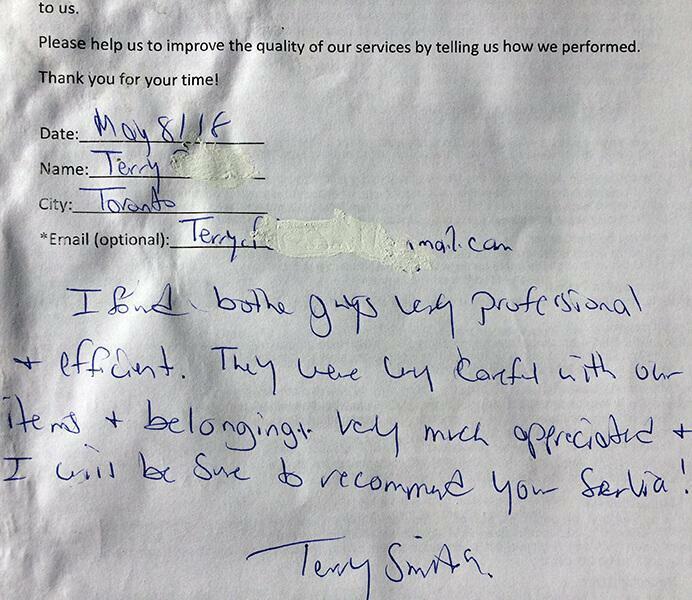 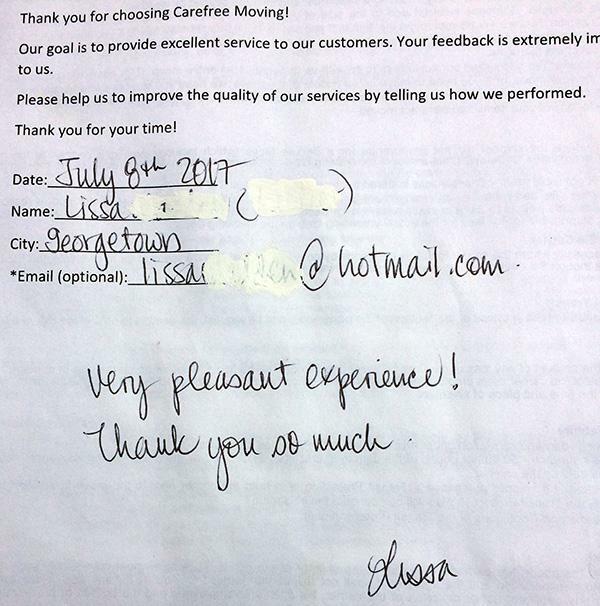 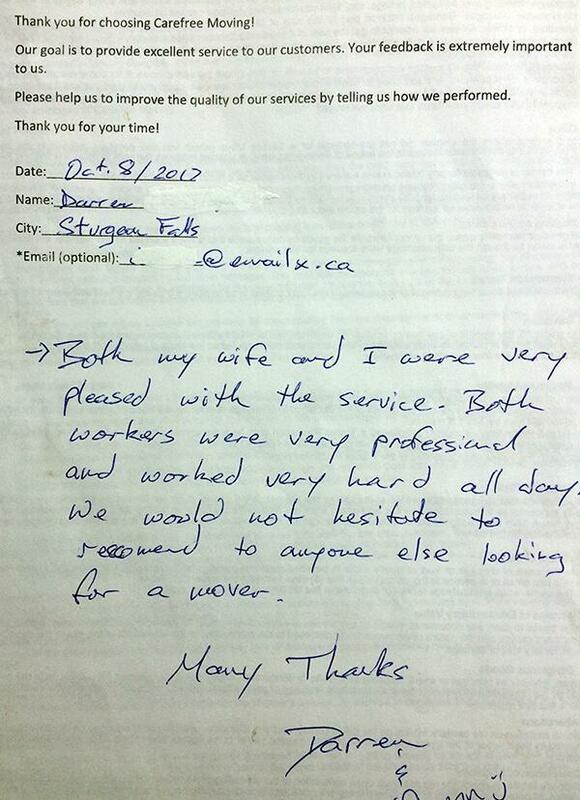 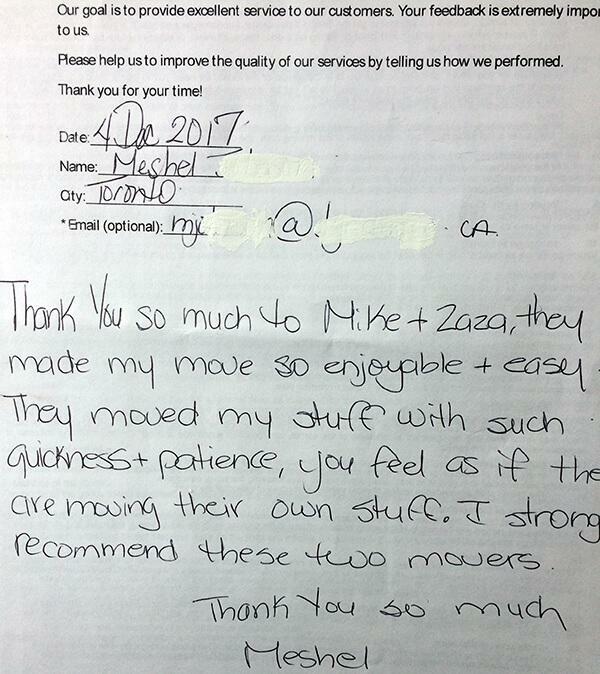 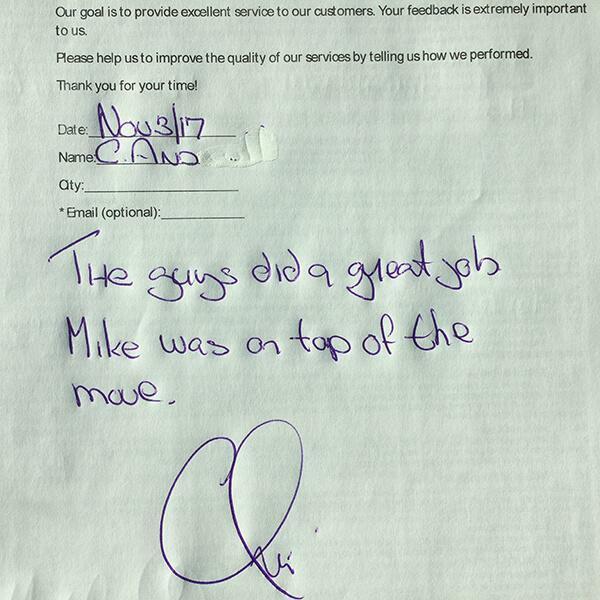 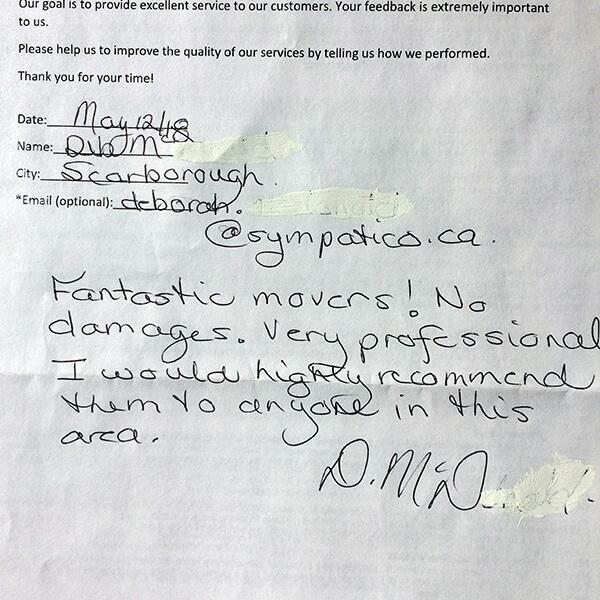 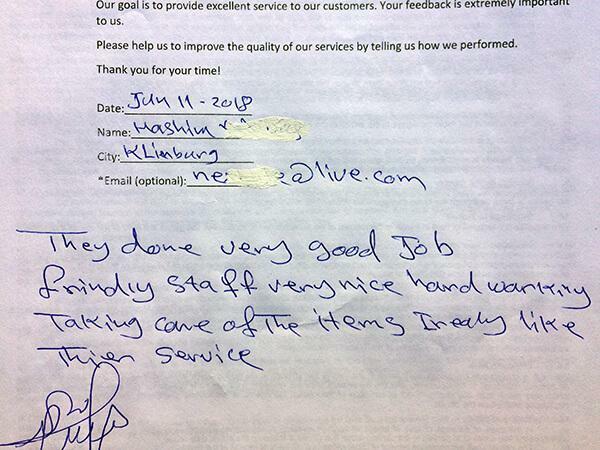 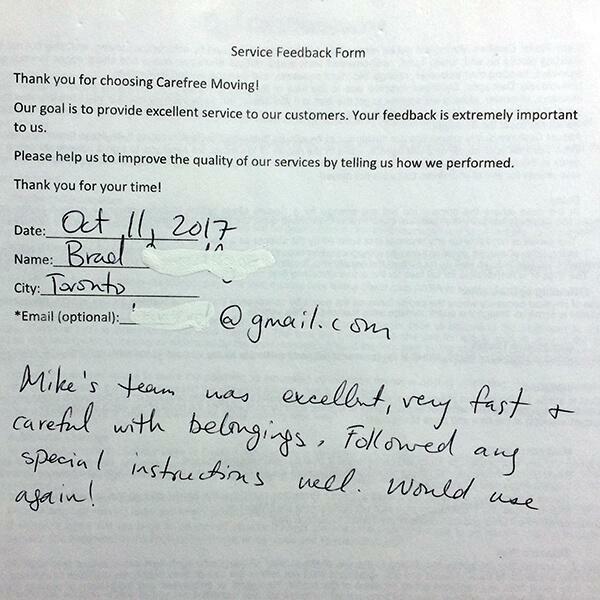 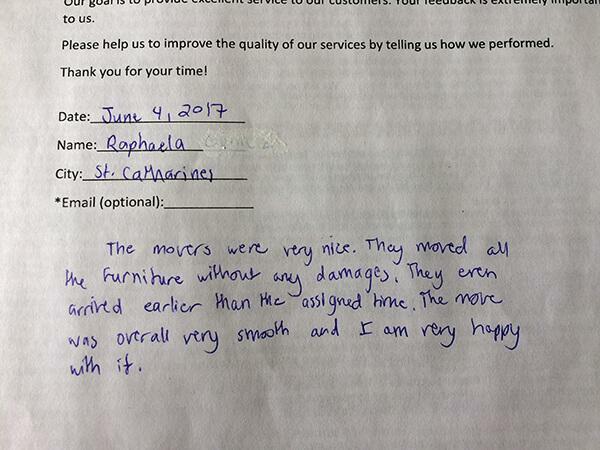 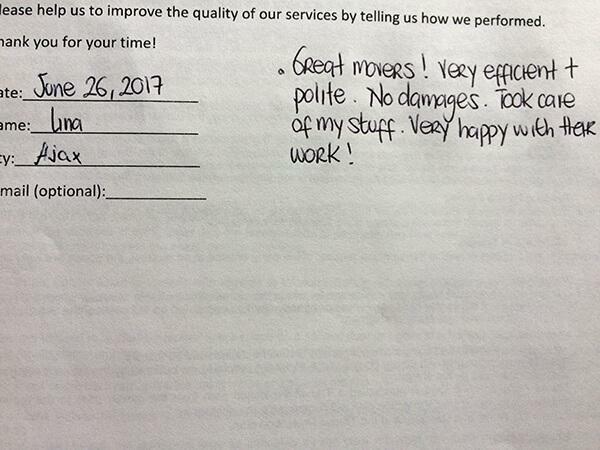 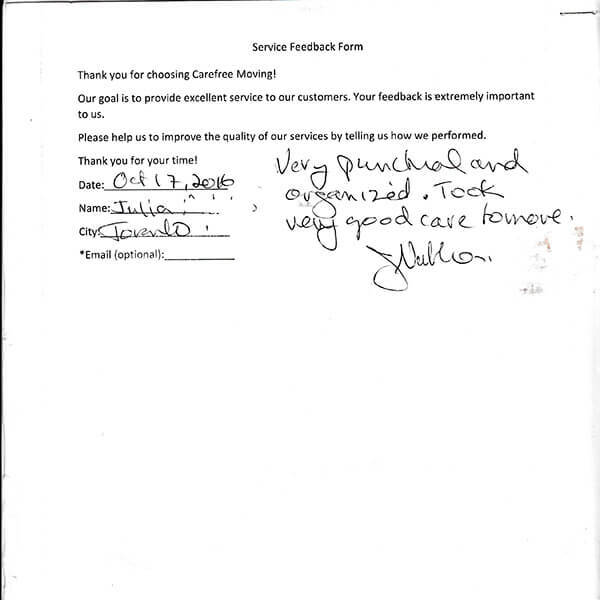 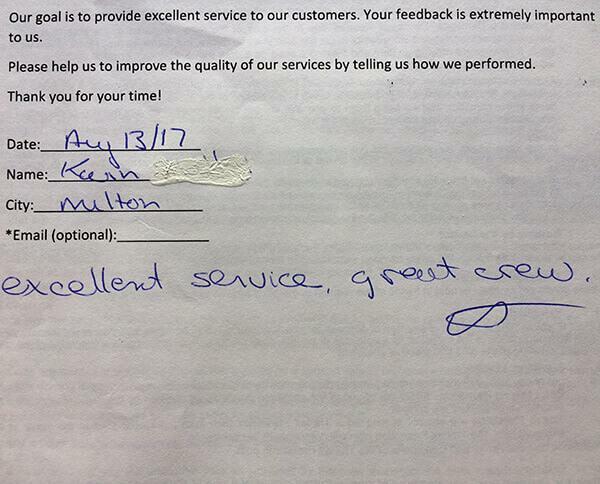 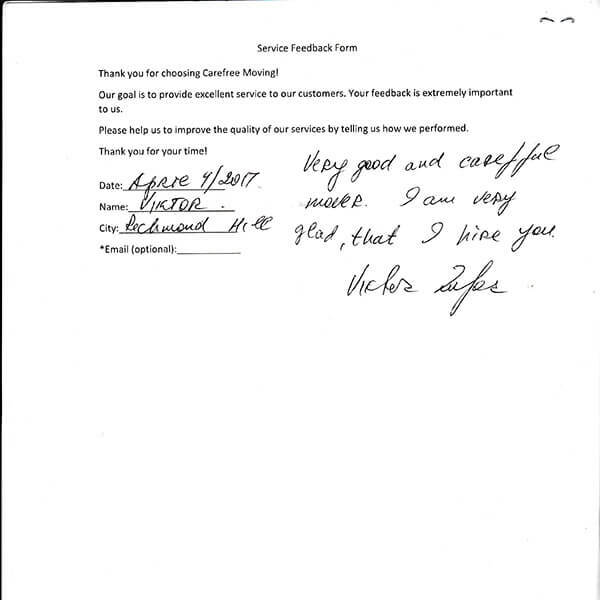 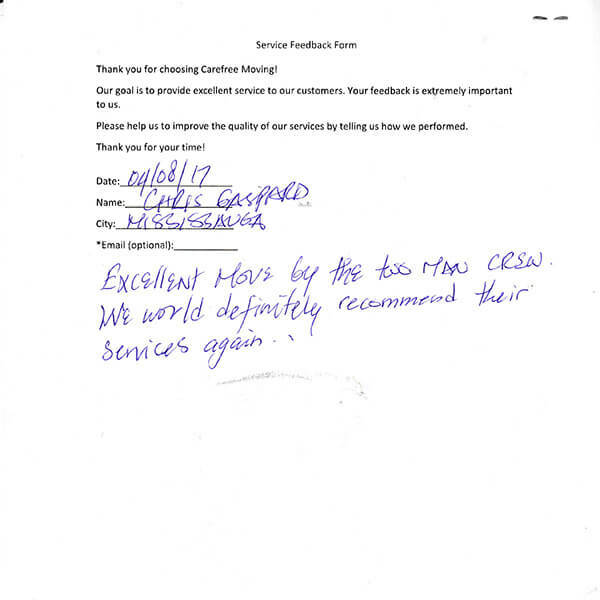 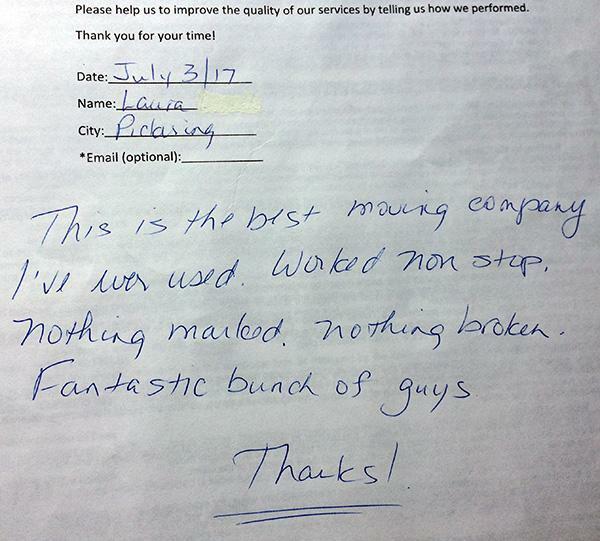 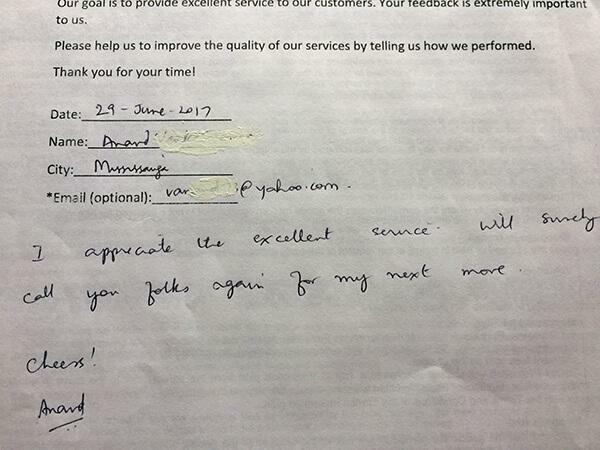 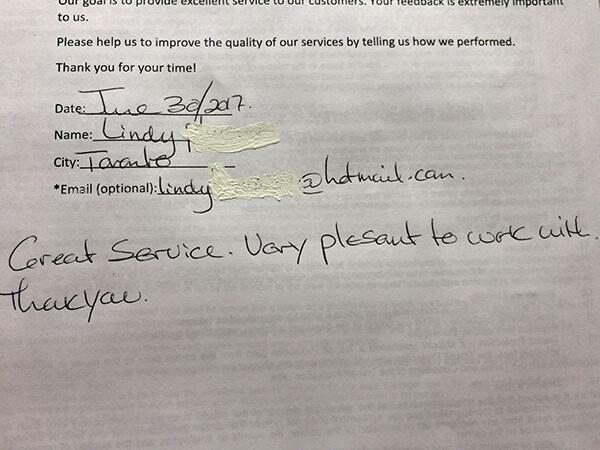 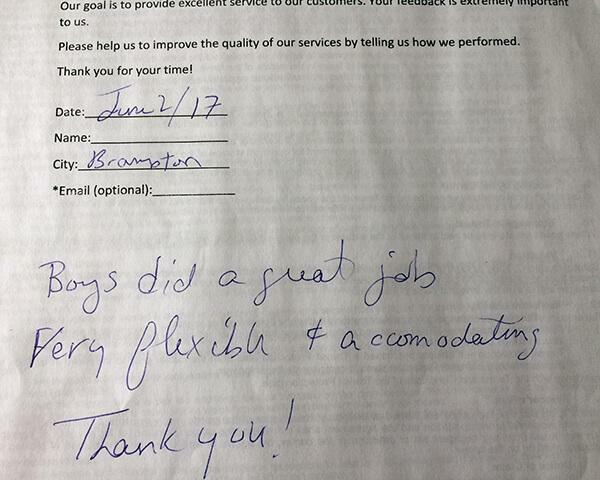 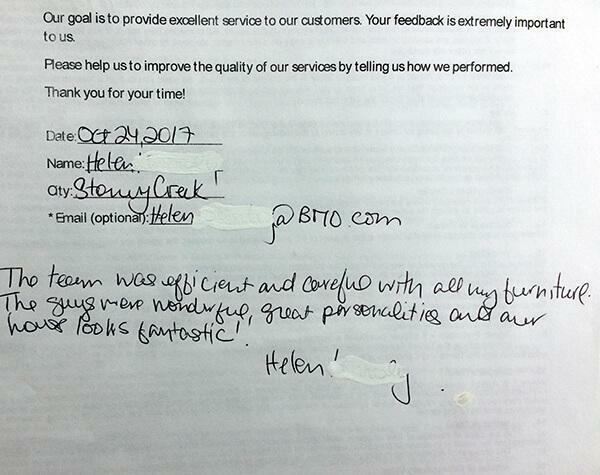 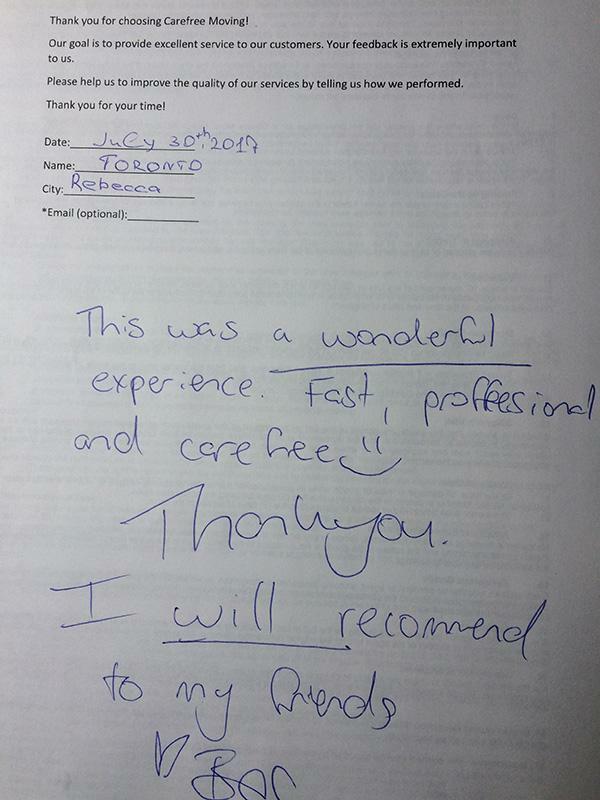 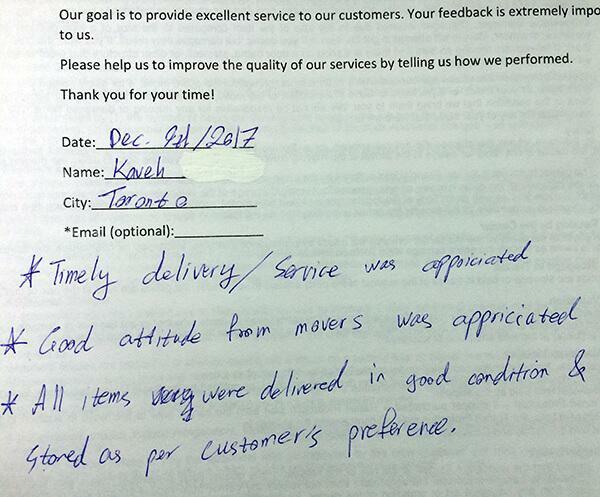 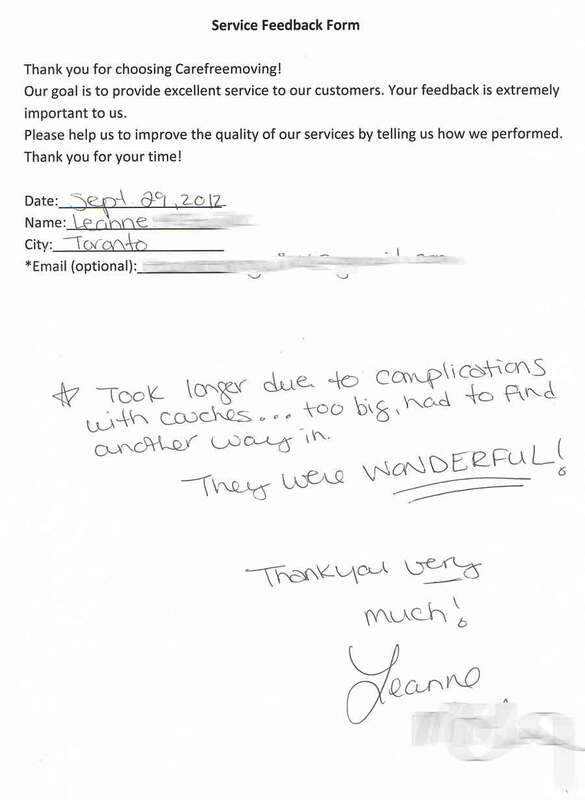 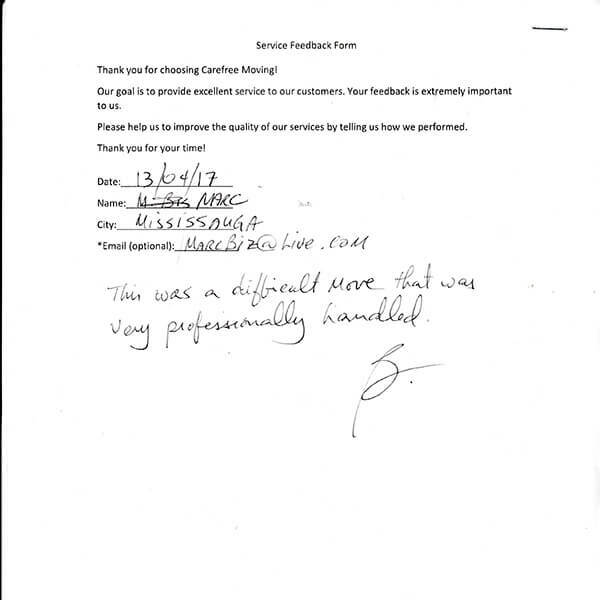 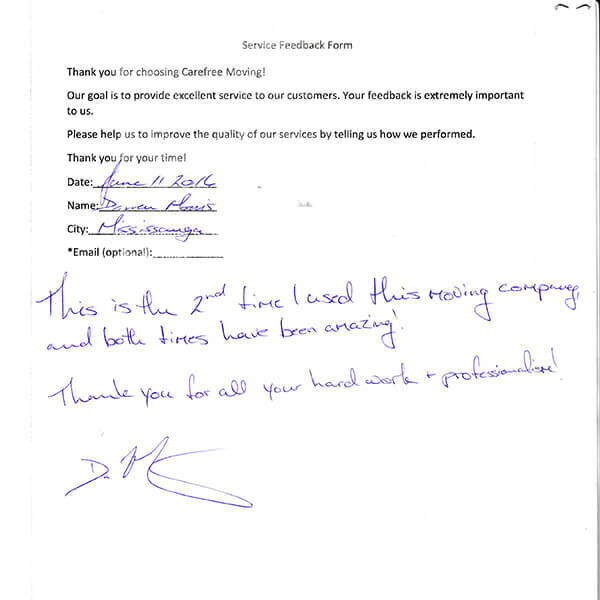 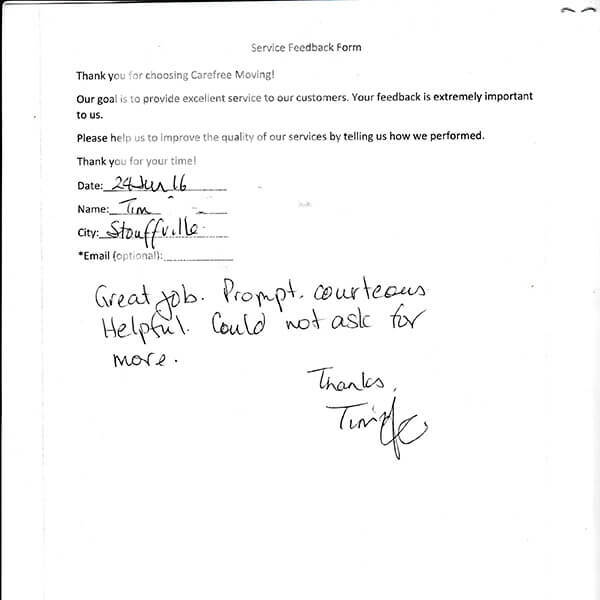 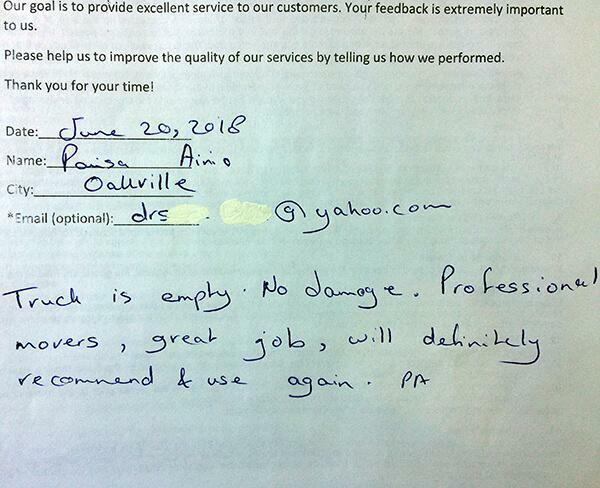 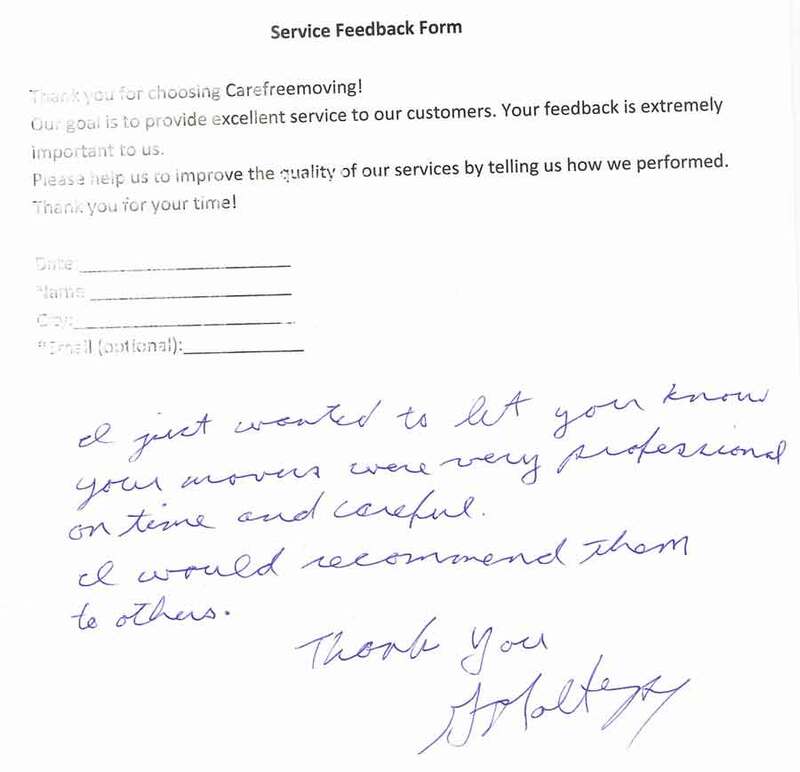 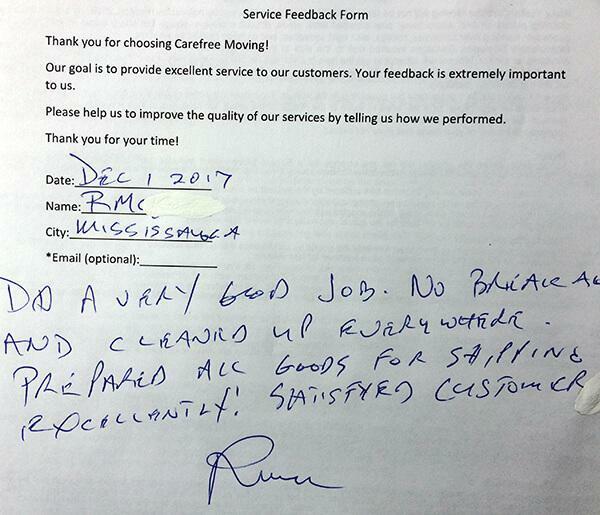 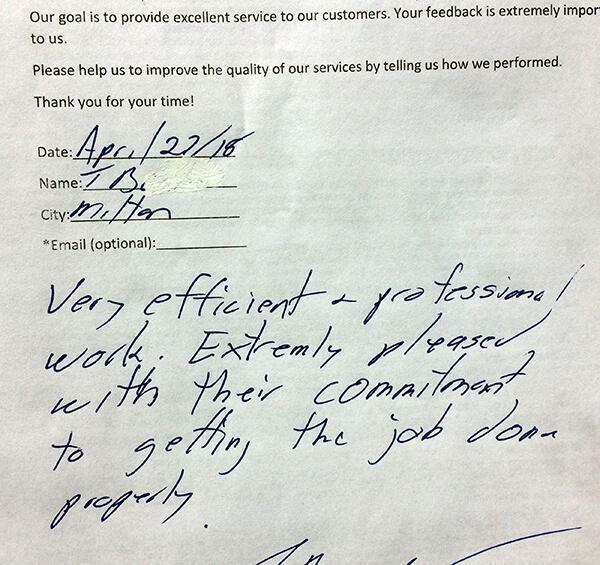 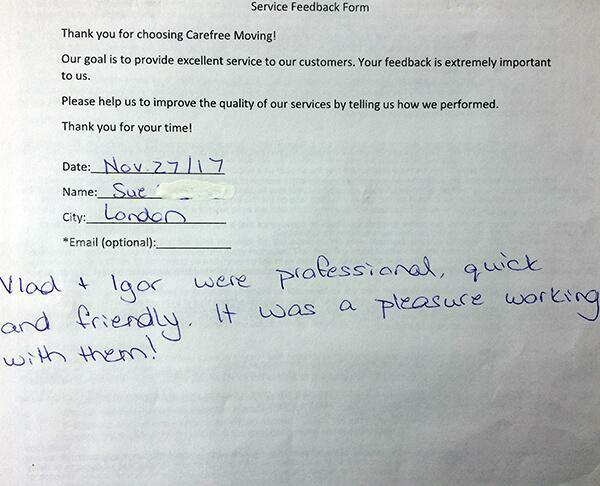 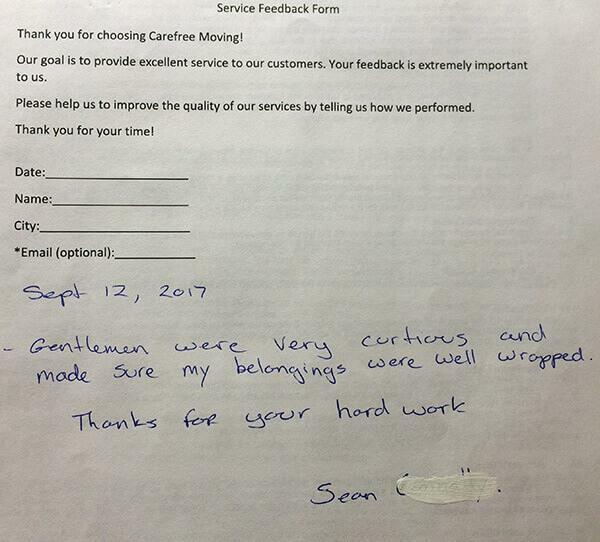 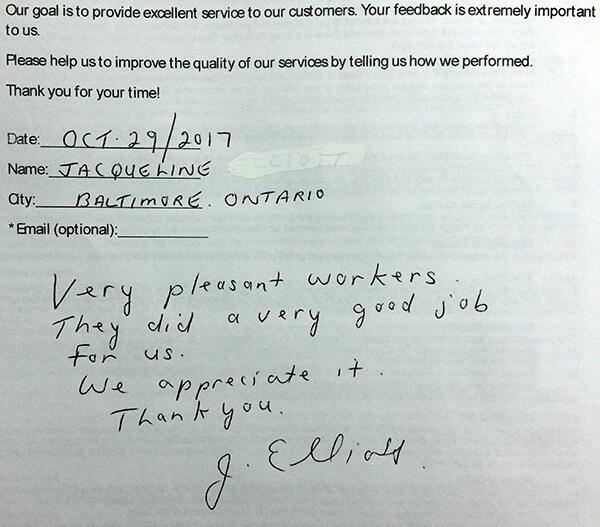 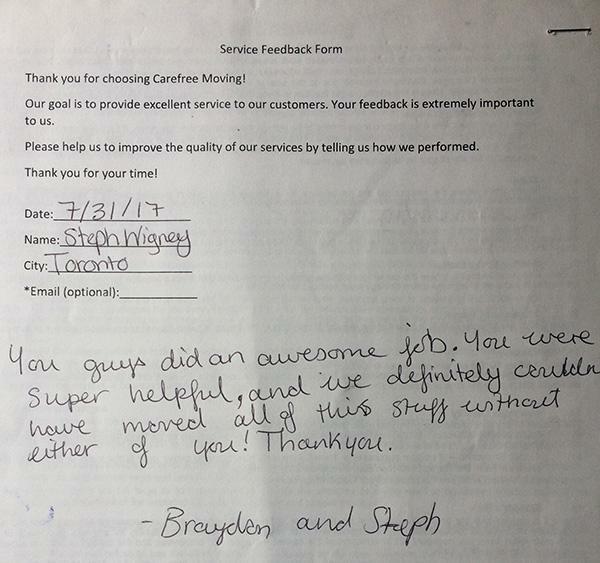 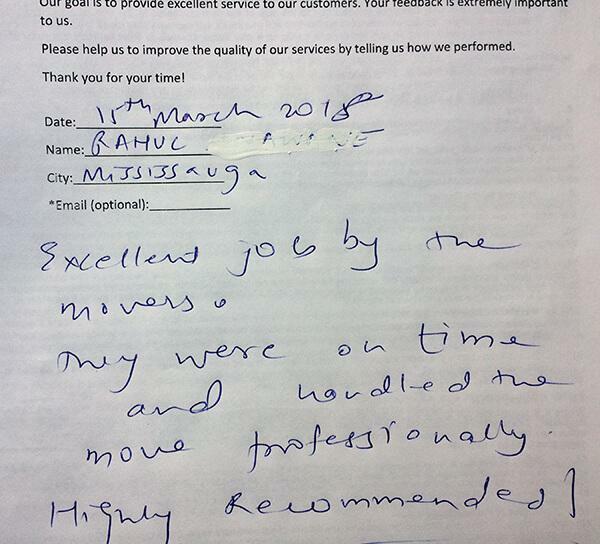 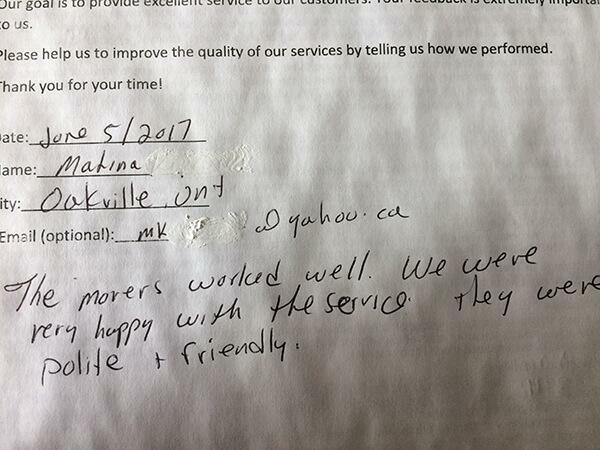 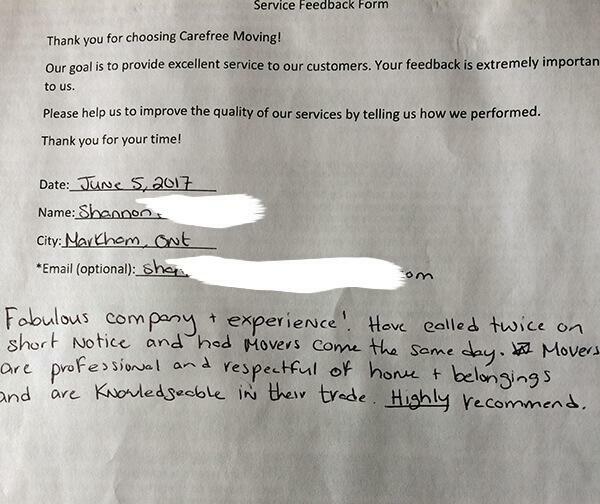 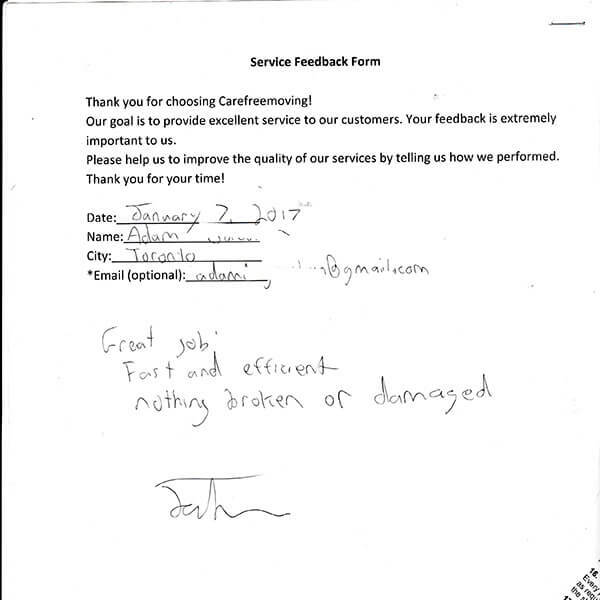 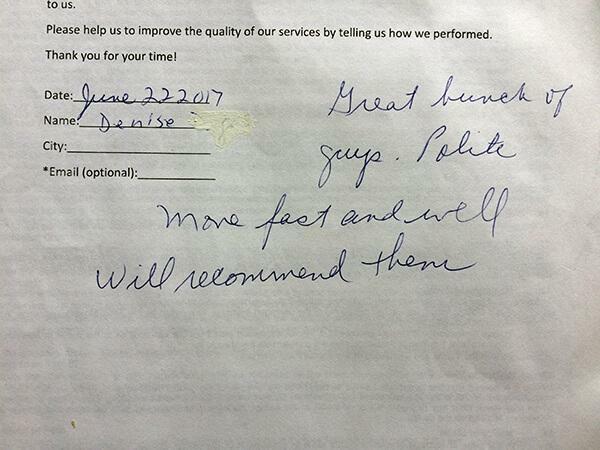 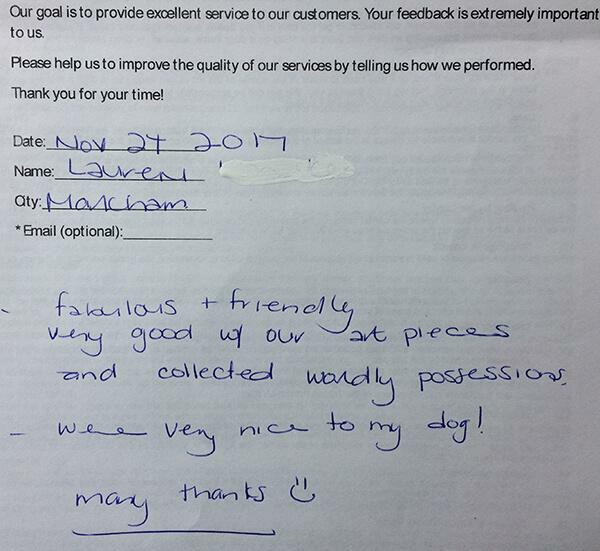 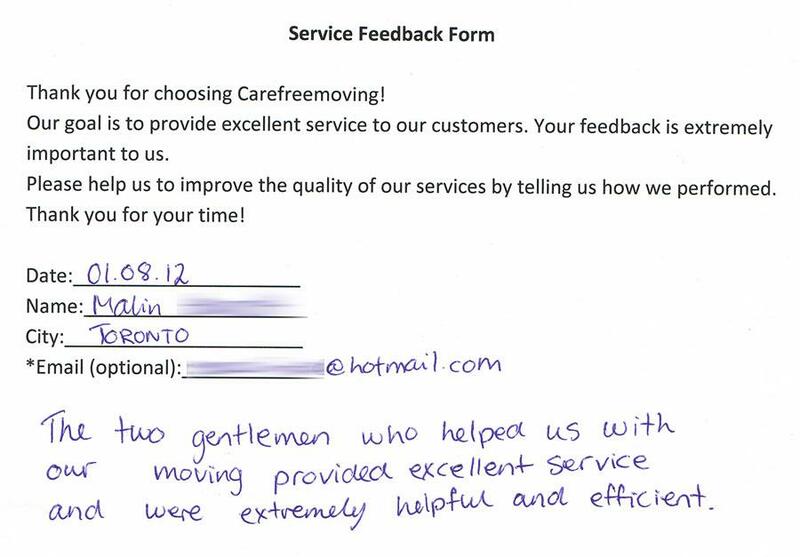 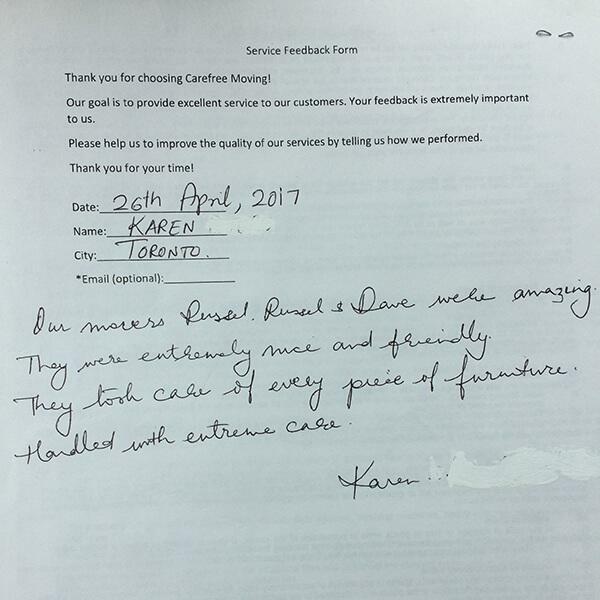 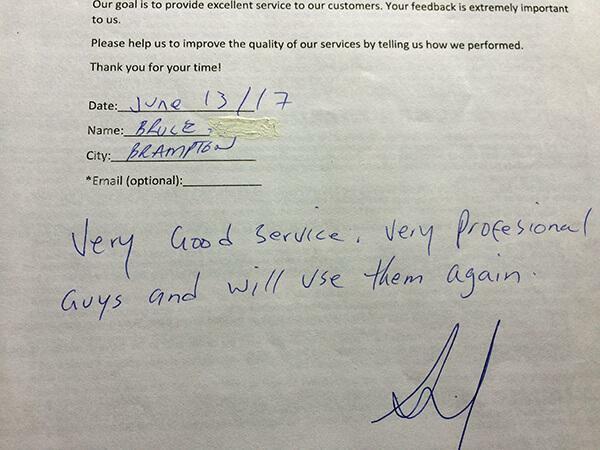 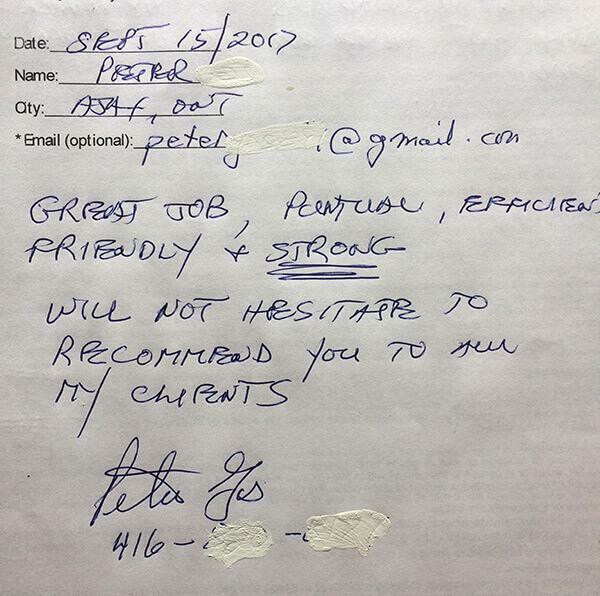 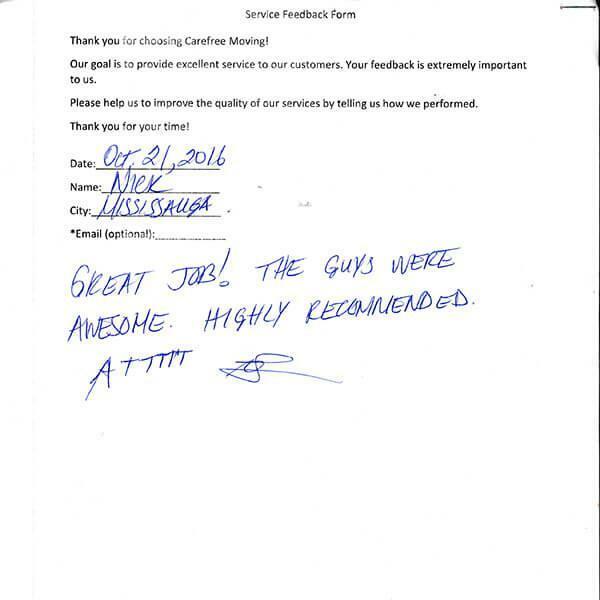 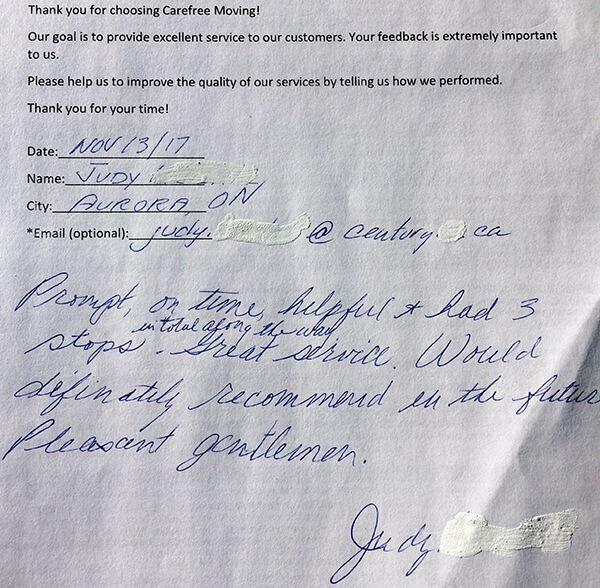 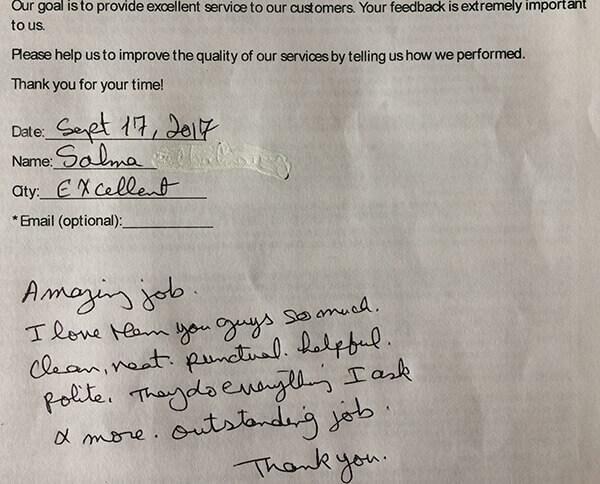 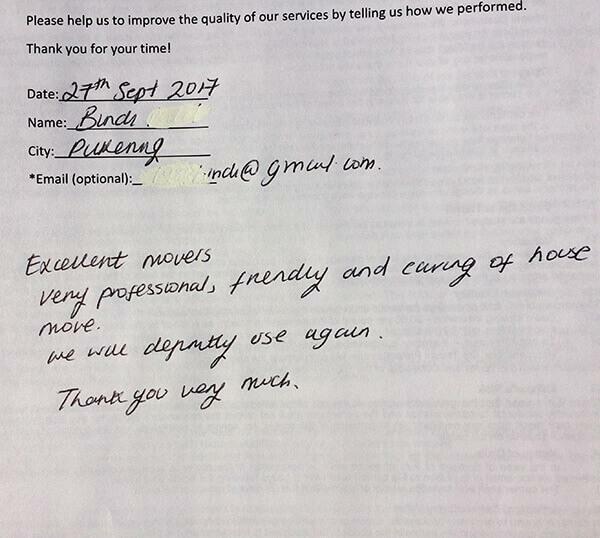 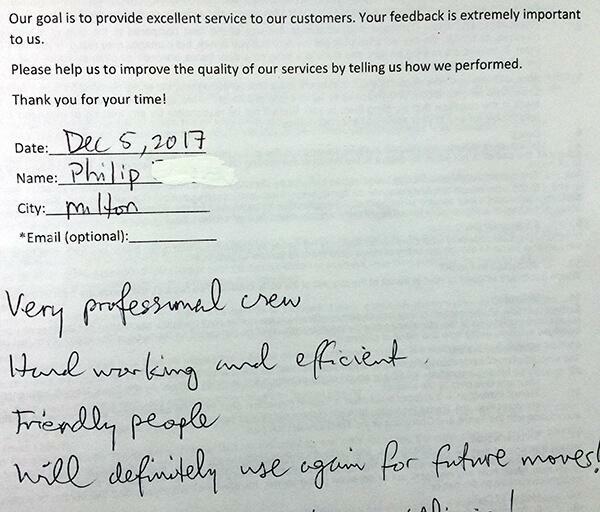 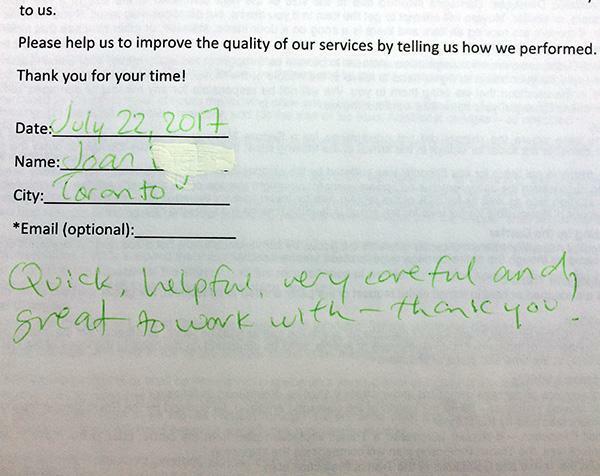 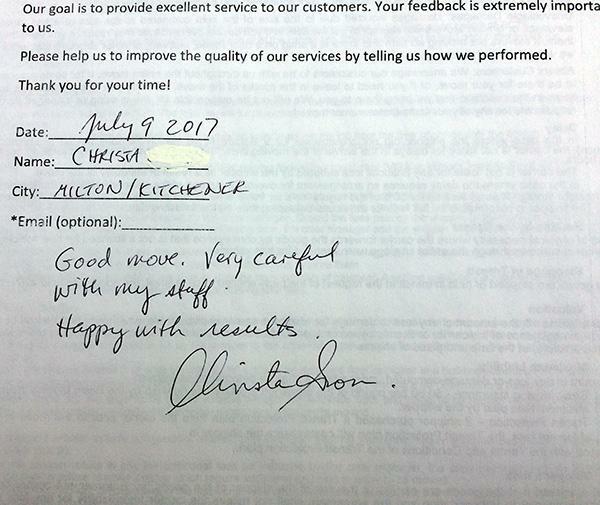 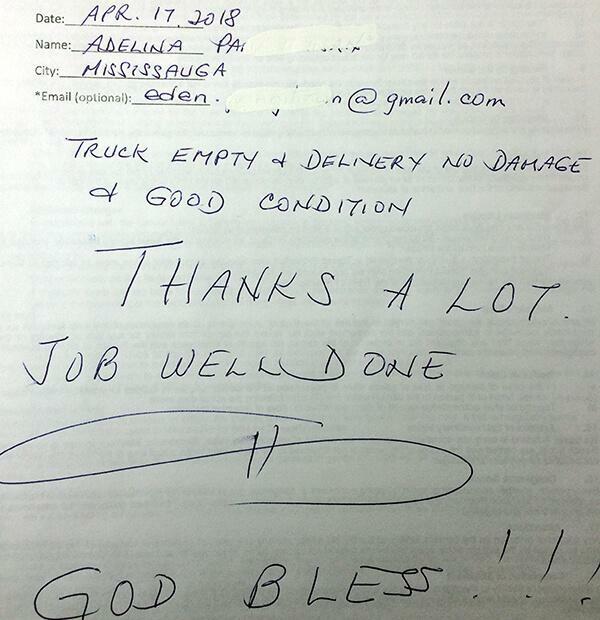 We know how much you care about your possessions and our Toronto movers treat all of the customer’s belongings as if they were their own. 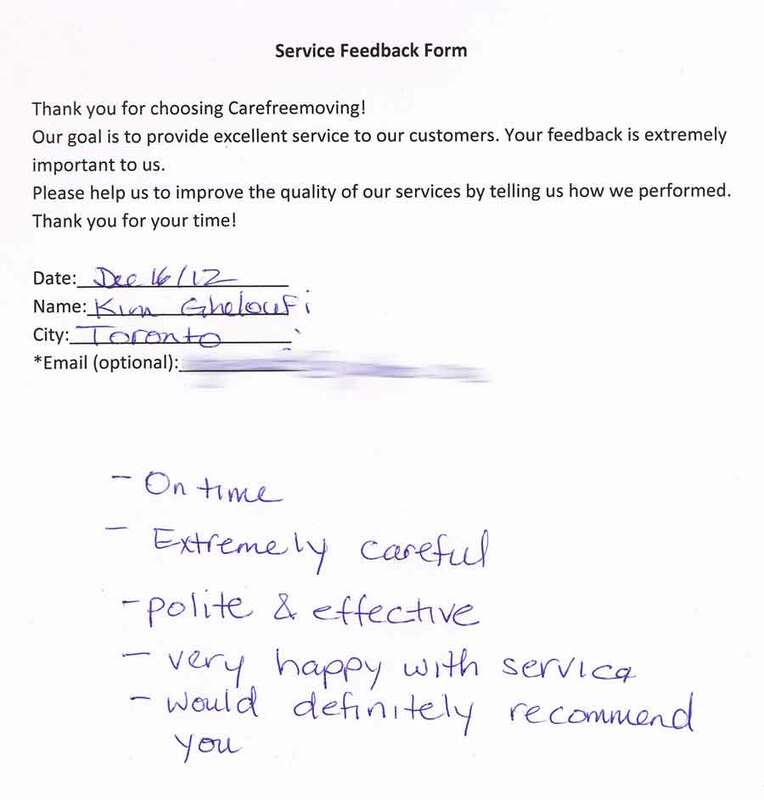 Our moving company Toronto is willing to plan and organize your relocation, as well as provide you with anything you might need for your relocation to make it less stressful and carefree. Modern technology and techniques, newest Equipment, various types of packaging options, a wide selection of new and clean Trucks - is only a small part of the advantages that our moving company could offer to our clients and distinguishes us from other local and long distance moving companies. 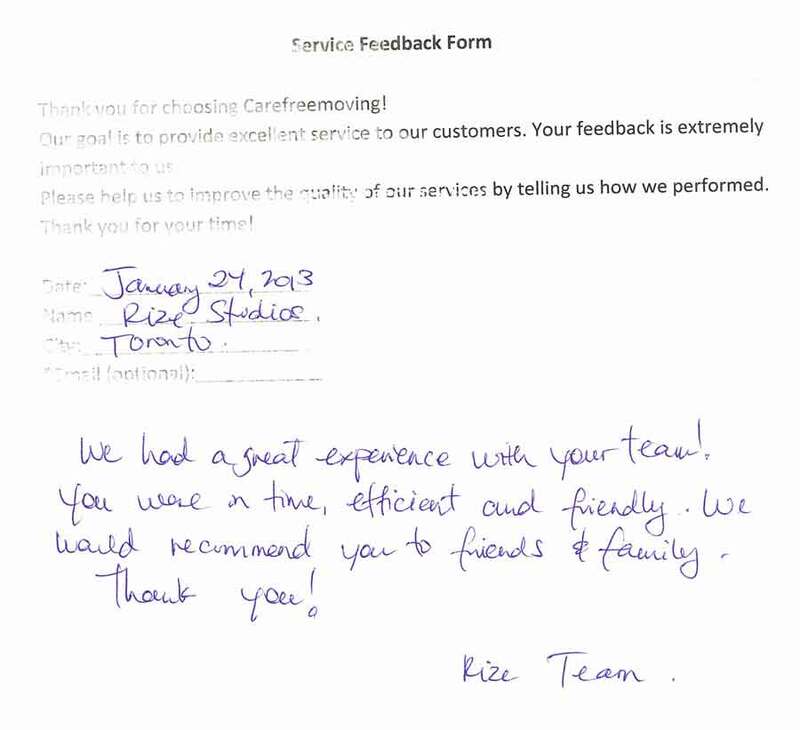 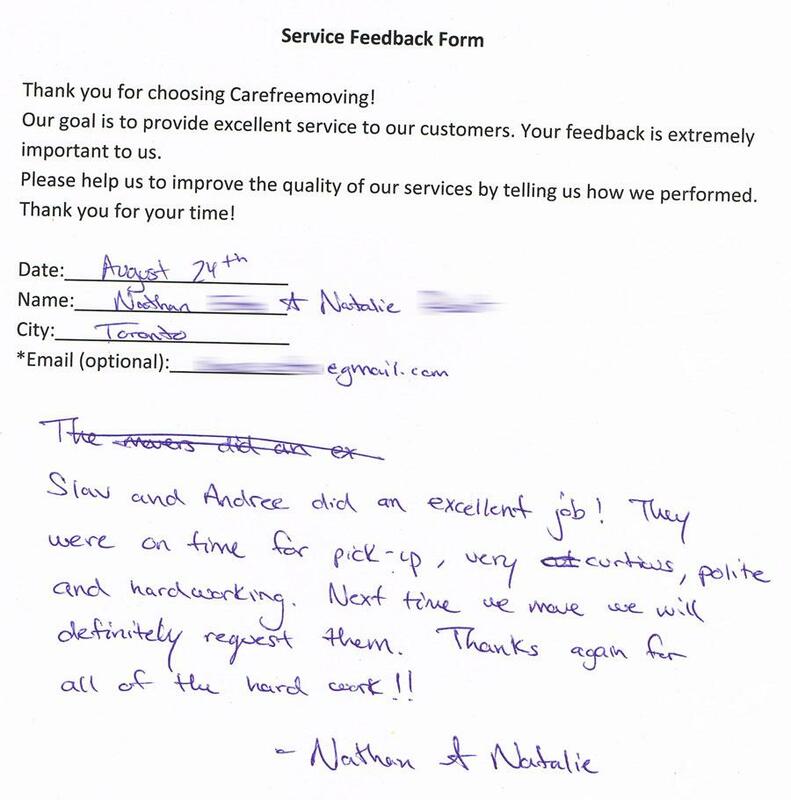 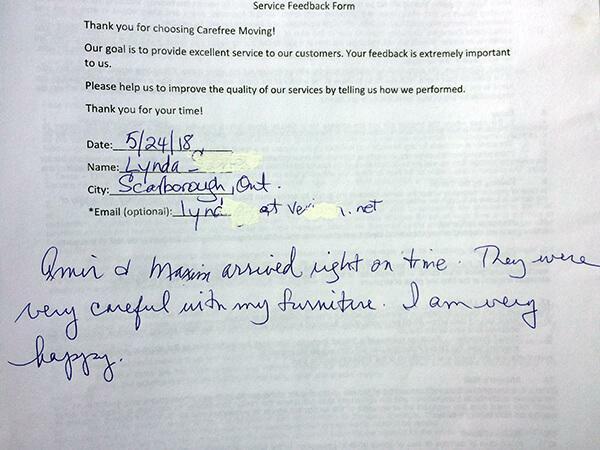 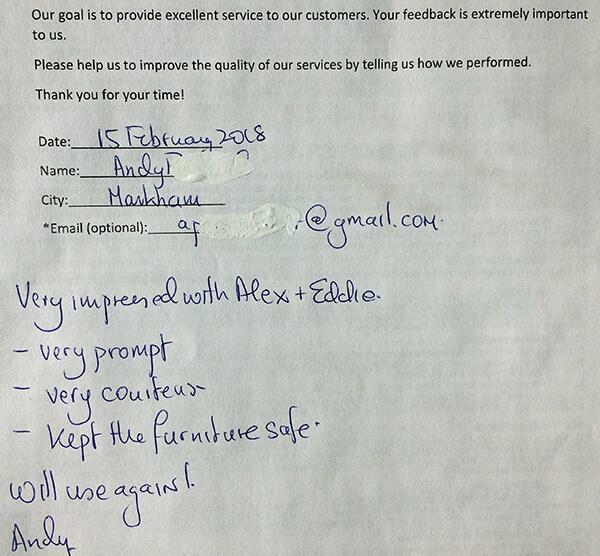 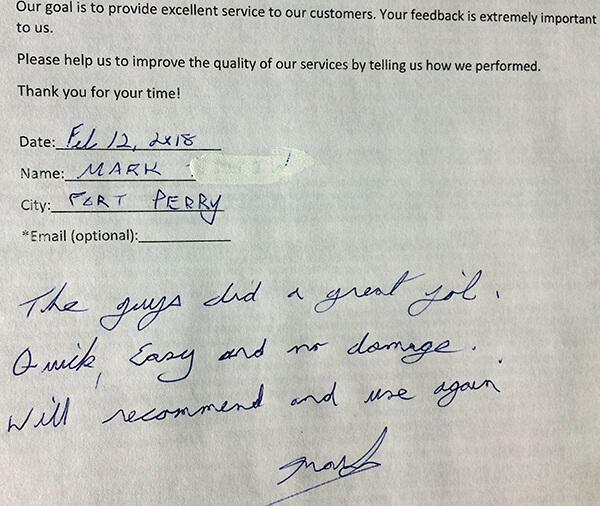 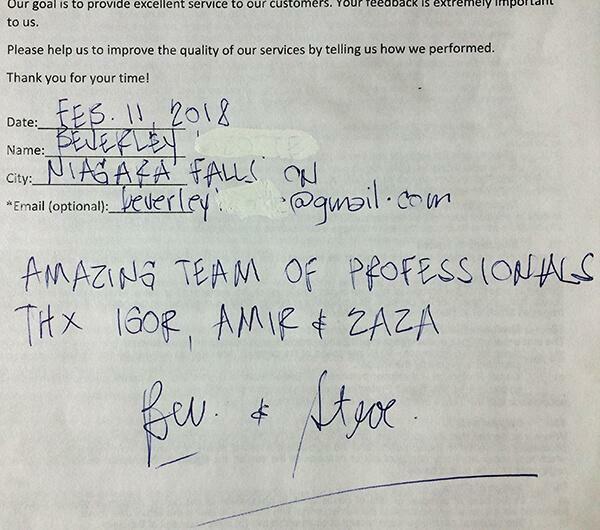 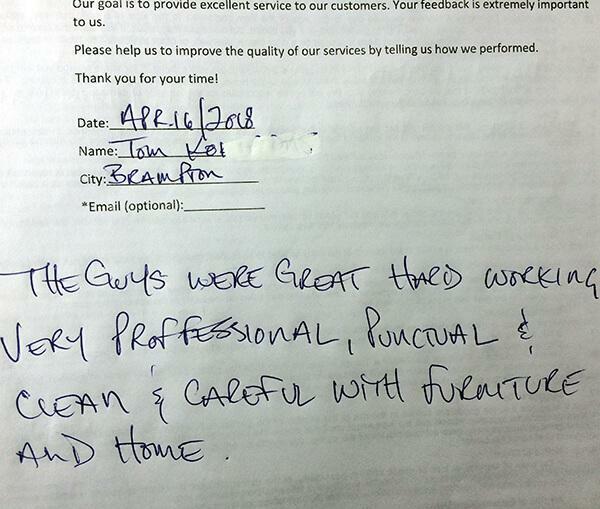 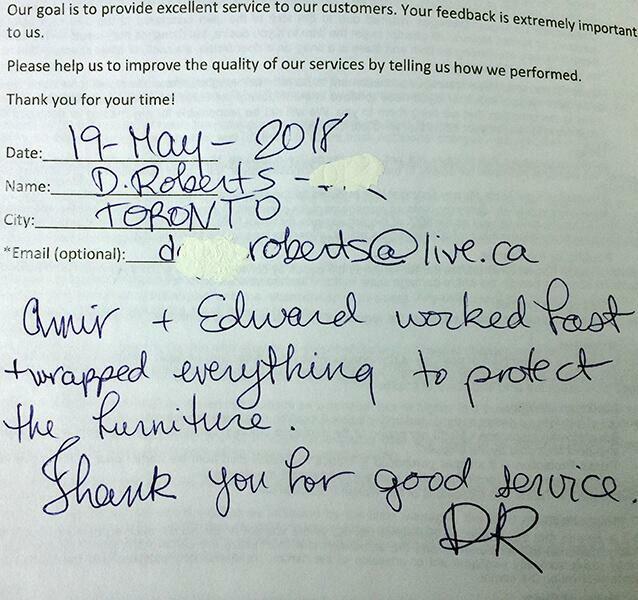 Our Toronto movers are able to take apart your furniture professionally and reassemble it at your new spot; properly pack your belongings, or assist you with any other matters if you ask for. 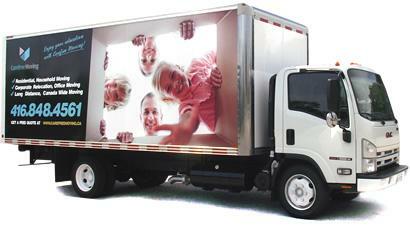 All special equipment and services are included in the hourly rate. 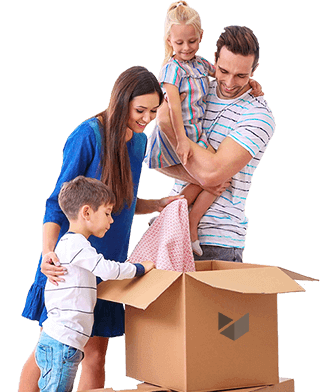 We strongly suggest entrusting your moving and all the worries related to this important event to us. 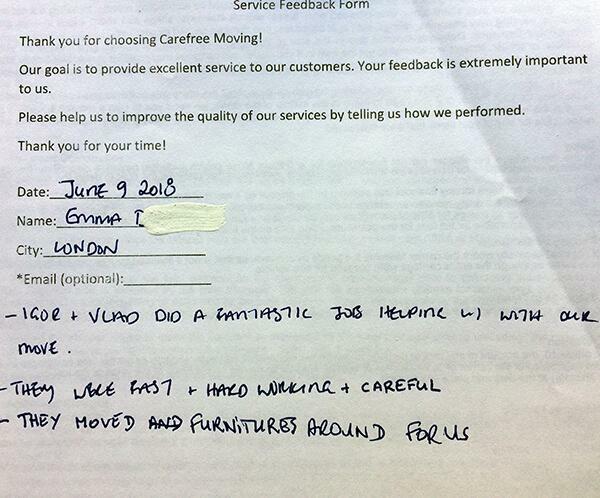 All we want you to do - is relax and focus on your new life in your new home! 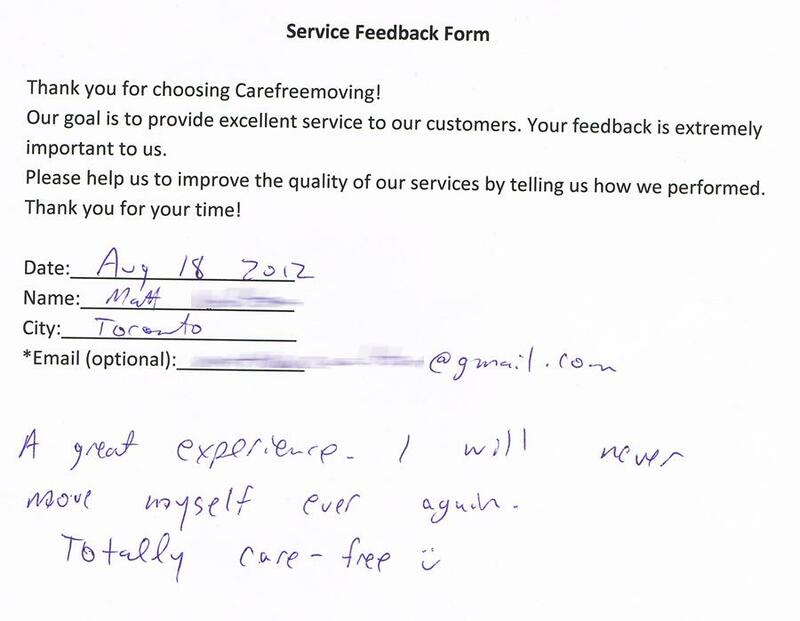 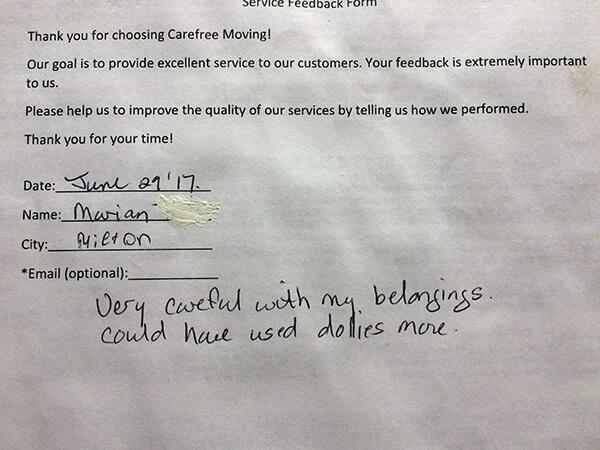 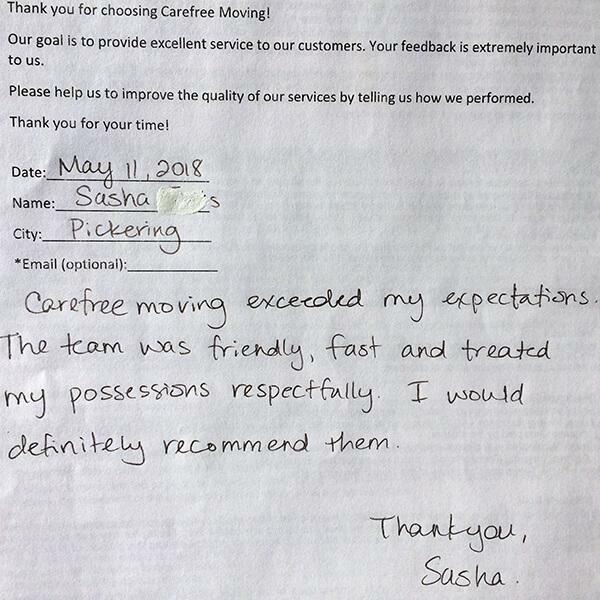 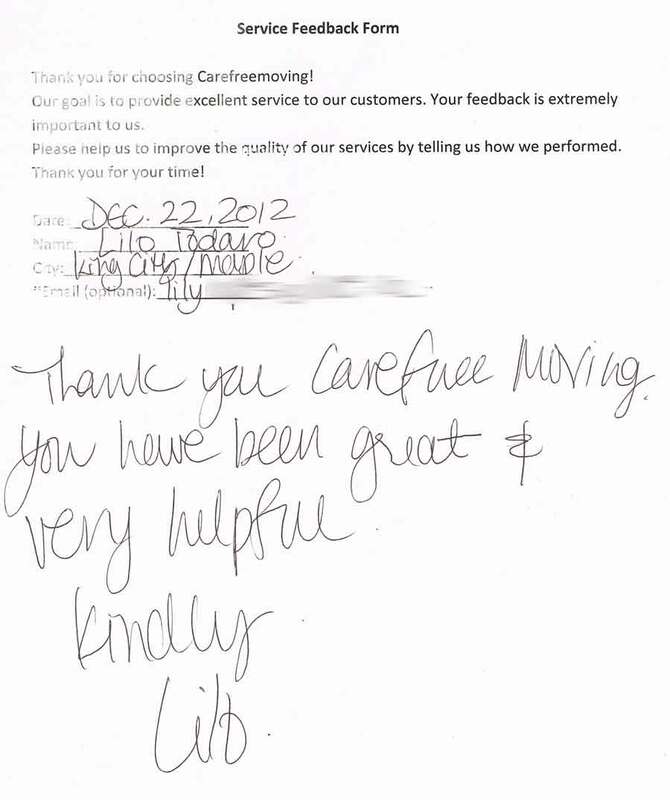 Call Carefree Moving today and enjoy your new relocation!